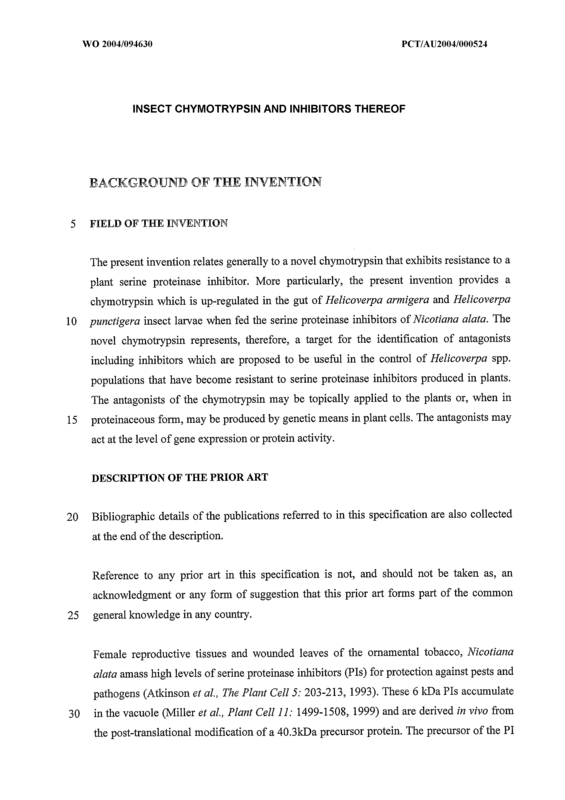 The present invention relates generally to a novel chymotrypsin that exhibits resistance to a plant serine proteinase inhibitor. 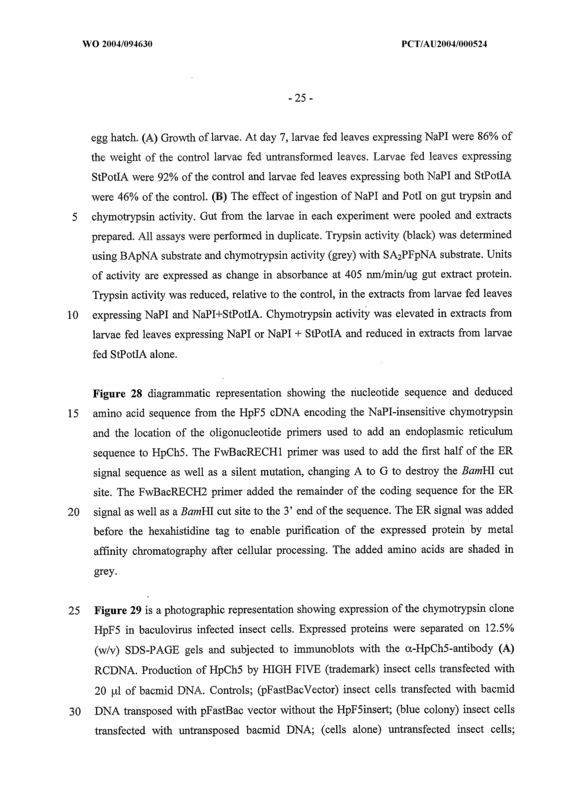 More particularly, the present invention provides a chymotrypsin which is up-regulated in the gut of Helicoverpa armigera and Helicoverpa punctigera insect larvae when fed the serine proteinase inhibitors of Nicotiana alata. 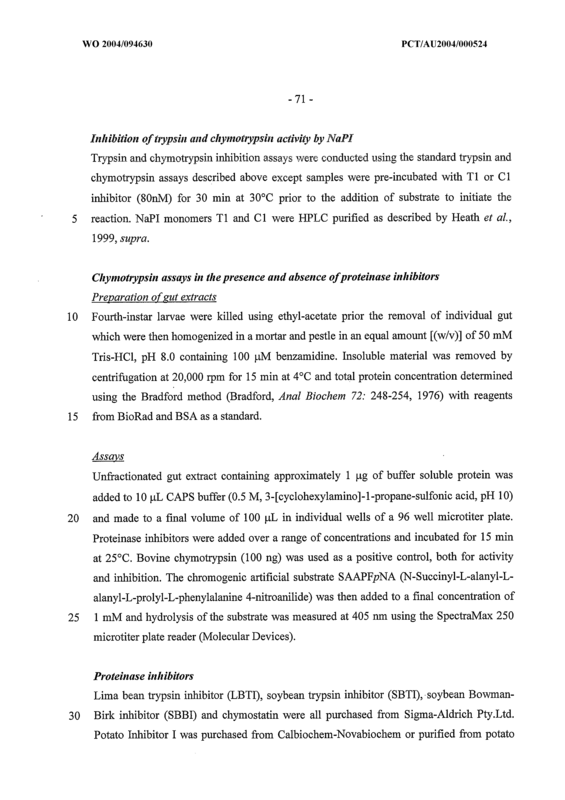 The novel chymotrypsin represents, therefore, a target for the identification of antagonists including inhibitors which are proposed to be useful in the control of Helicoverpa spp. 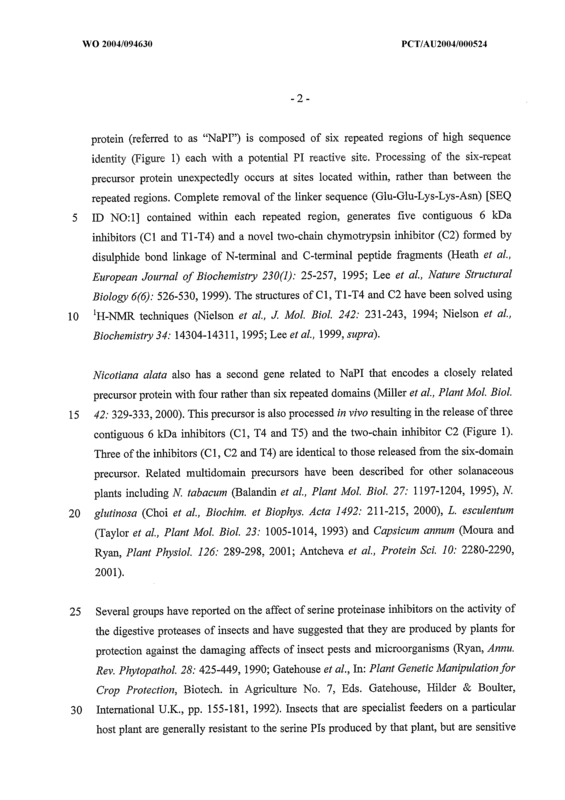 populations that have become resistant to serine proteinase inhibitors produced in plants. 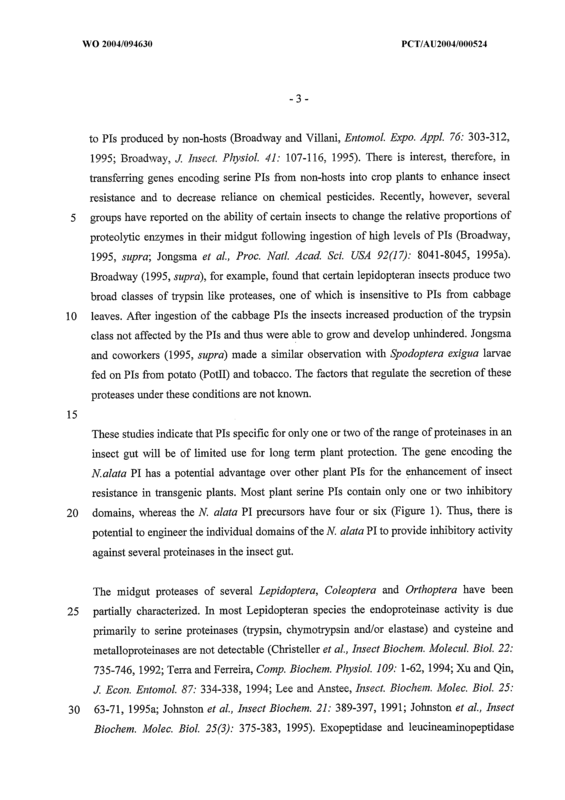 The antagonists of the chymotrypsin may be topically applied to the plants or, when in proteinaceous form, may be produced by genetic means in plant cells. 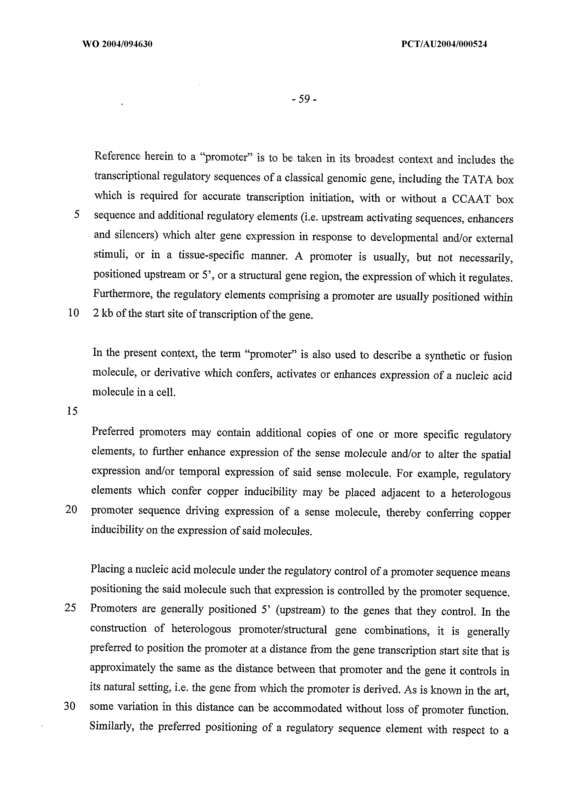 The antagonists may act at the level of gene expression or protein activity. 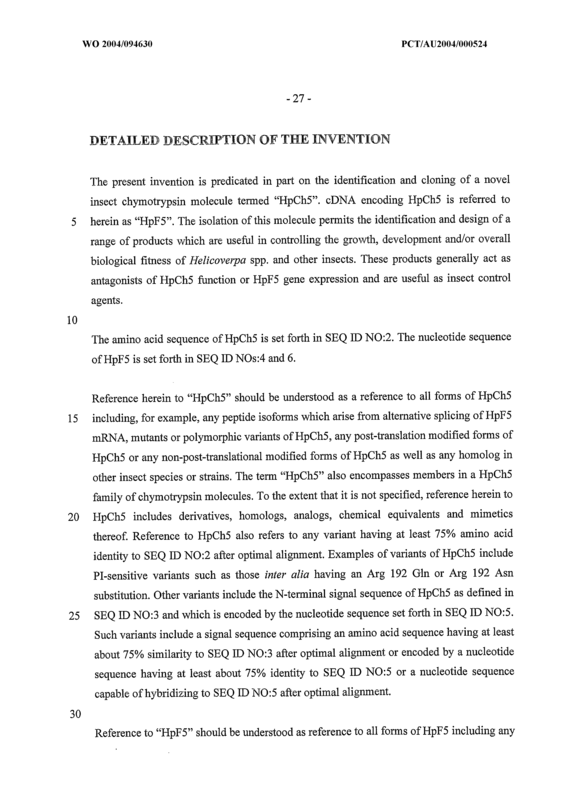 An isolated nucleic acid molecule comprising a sequence of nucleotides encoding a chymotrypsin from Helicoverpa spp. 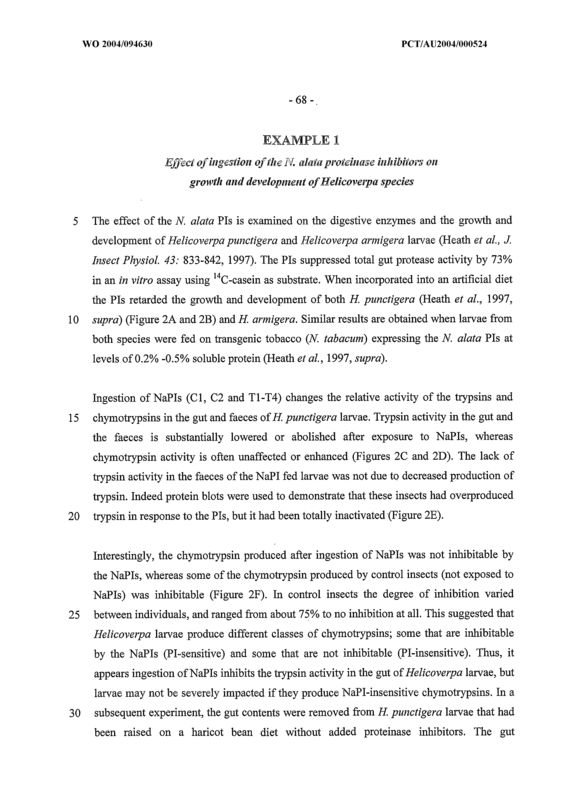 or a variant, derivative, homolog or analog of said chymotrypsin, wherein said chymotrypsin exhibits resistance to a proteinase inhibitor (PI) from Nicotiana alata. 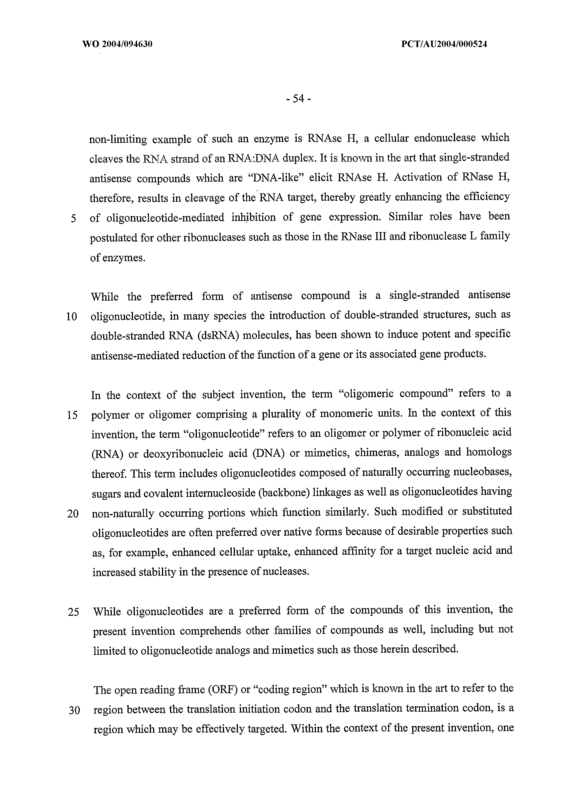 The isolated nucleic acid molecule of Claim 1 wherein the nucleotide sequence encodes an amino acid sequence set forth in SEQ ID NO:2 or an amino acid sequence having at least about 75% similarity to SEQ ID NO:2 after optimal alignment. 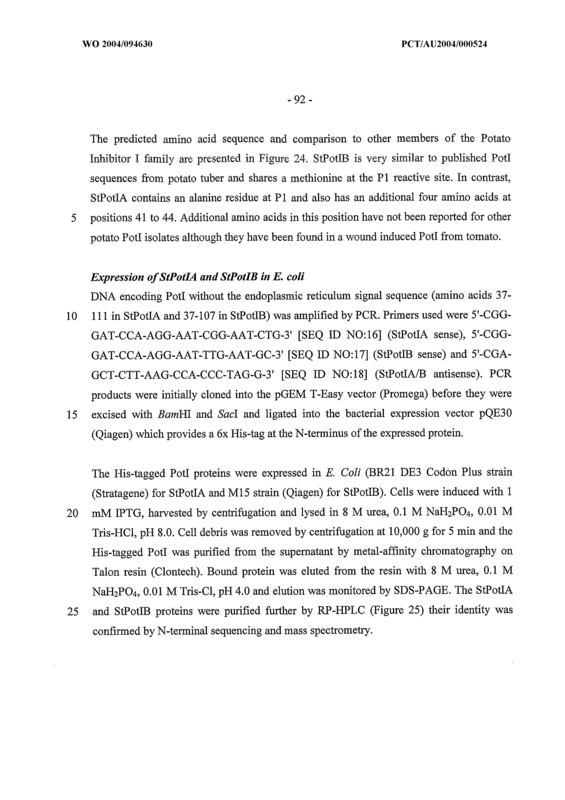 The isolated nucleic acid molecule of Claim 2 wherein the nucleotide sequence encodes an amino acid sequence set forth in SEQ ID NO:2. 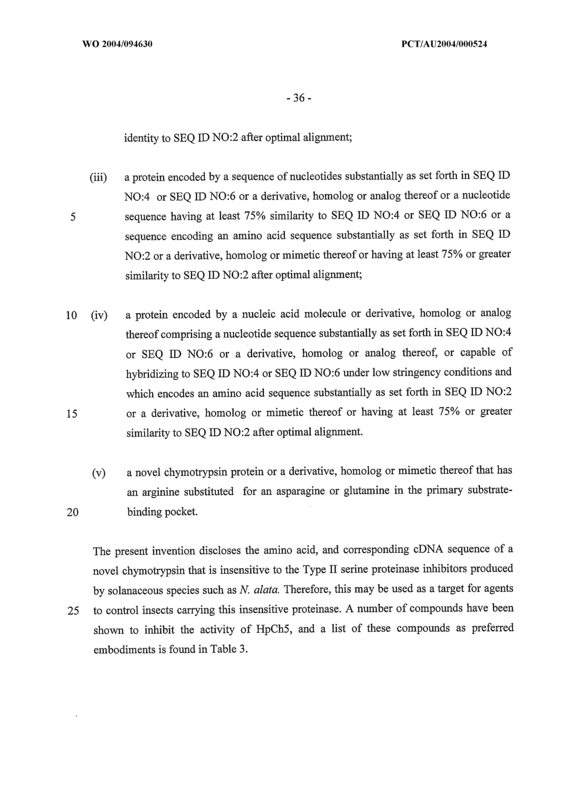 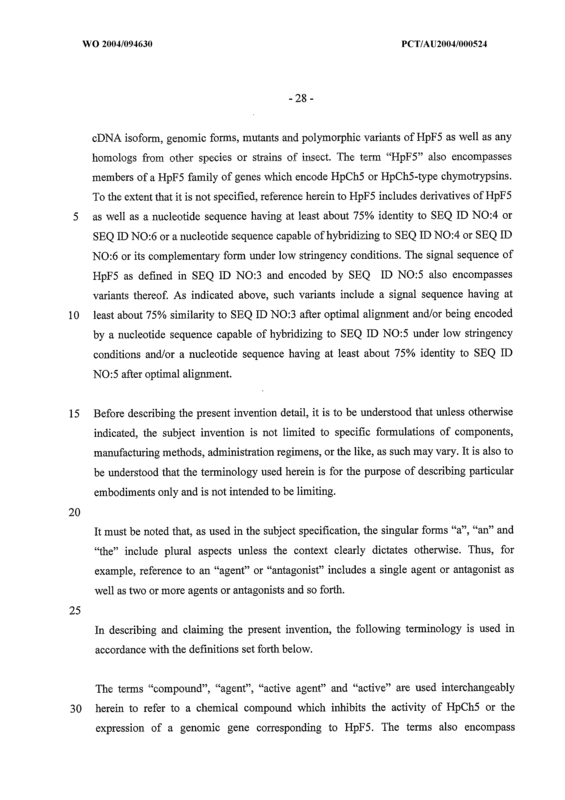 The isolated nucleic acid molecule of Claim 1 wherein the nucleotide sequence is as set forth in SEQ ID NO:4 or SEQ ID NO: 6 or a nucleotide sequence having at least about 75% identity to SEQ ID NO:4 or SEQ ID NO:6 after optimal alignment or a nucleotide sequence capable of hybridizing to SEQ ID NO:4 or SEQ ID NO:6 or its complementary form under low stringency conditions. 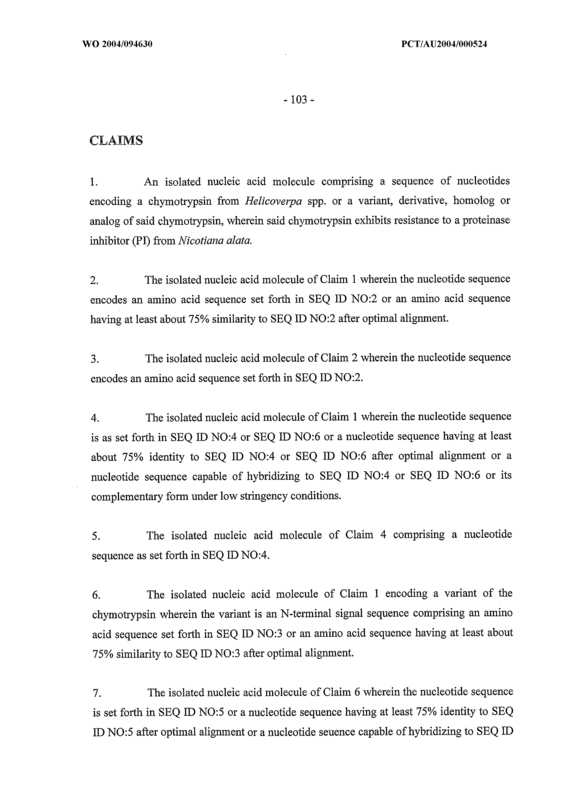 The isolated nucleic acid molecule of Claim 4 comprising a nucleotide sequence as set forth in SEQ ID NO:4. 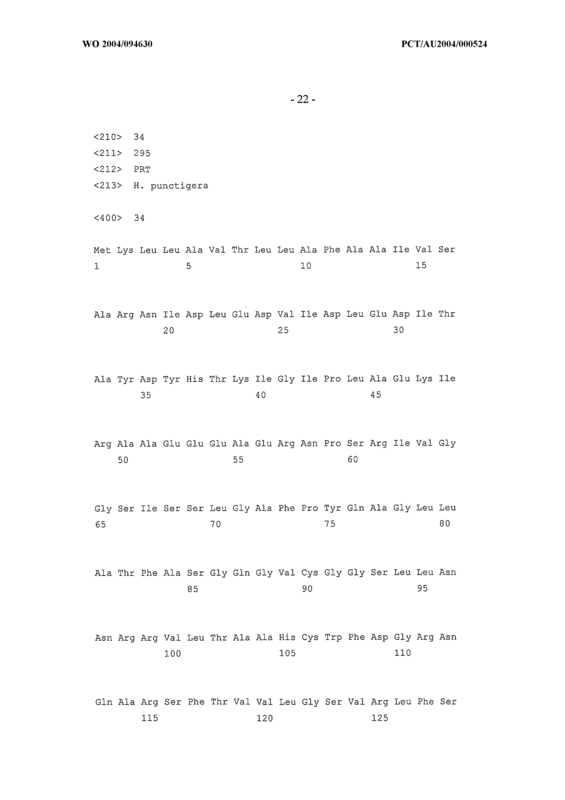 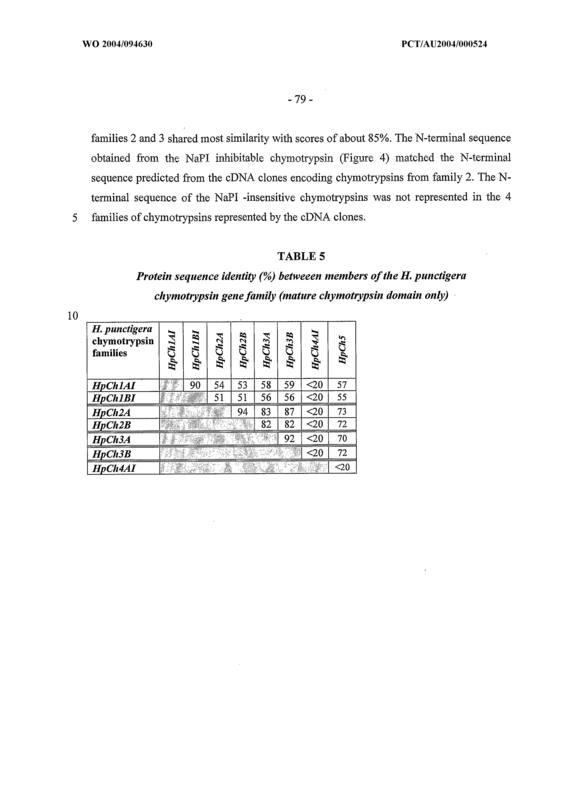 The isolated nucleic acid molecule of Claim 1 encoding a variant of the chymotrypsin wherein the variant is an N-terminal signal sequence comprising an amino acid sequence set forth in SEQ ID NO:3 or an amino acid sequence having at least about 75%) similarity to SEQ ID NO:3 after optimal alignment. 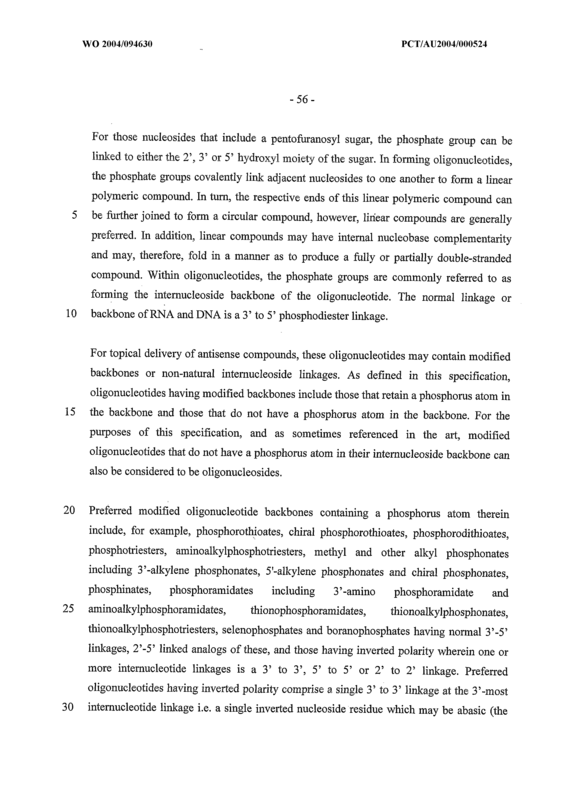 The isolated nucleic acid molecule of Claim 6 wherein the nucleotide sequence is set forth in SEQ ID NO: 5 or a nucleotide sequence having at least 75% identity to SEQ ID NO: 5 after optimal alignment or a nucleotide seuence capable of hybridizing to SEQ ID NO:5 or its complementary form under low stringency conditions. 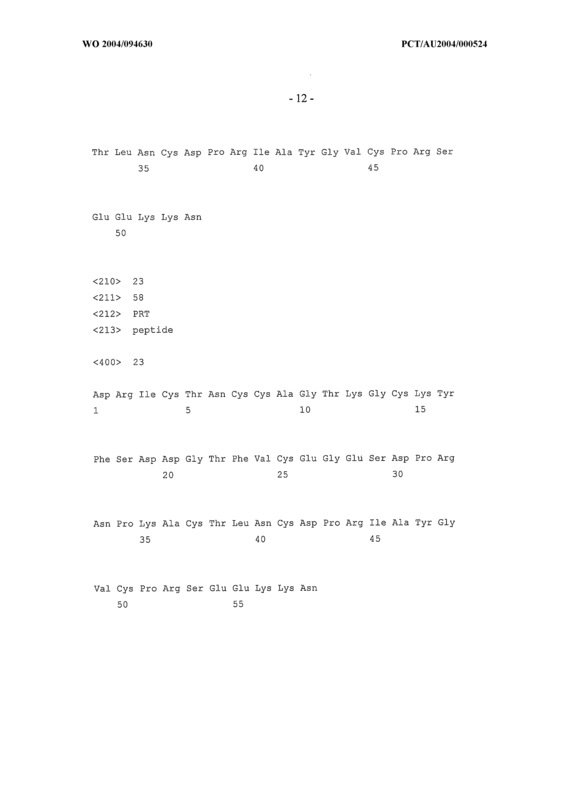 The isolated nucleic acid molecule of Claim 1 encoding a variant of the chymotrypsin wherein the variant comprises an amino acid other than arginine at position 192. 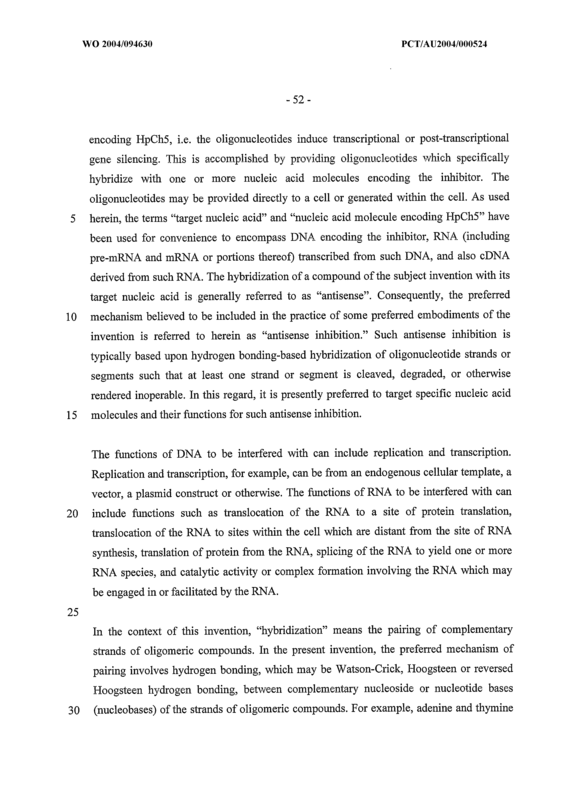 The isolated nucleic acid molecule of Claim 8 wherein the variant comprises a glutamine at position 192. 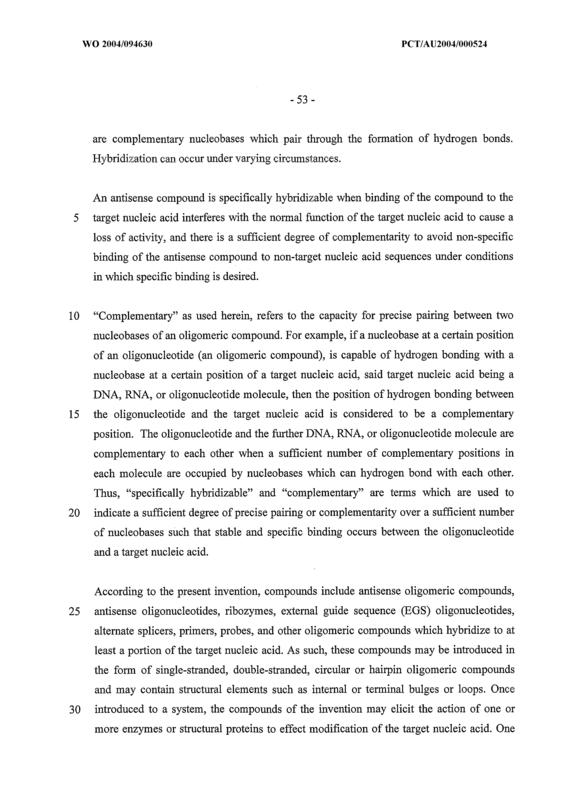 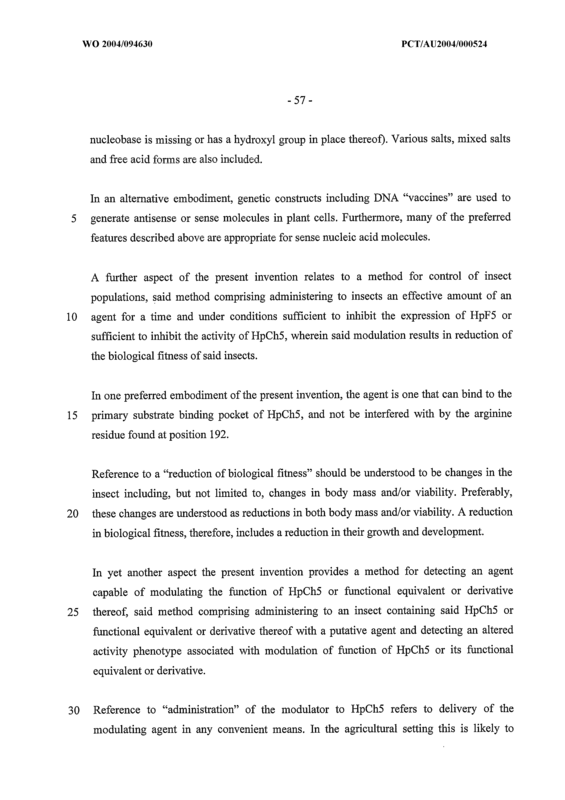 A vector comprising a nucleic acid molecule of any one of Claims 1 to 9. 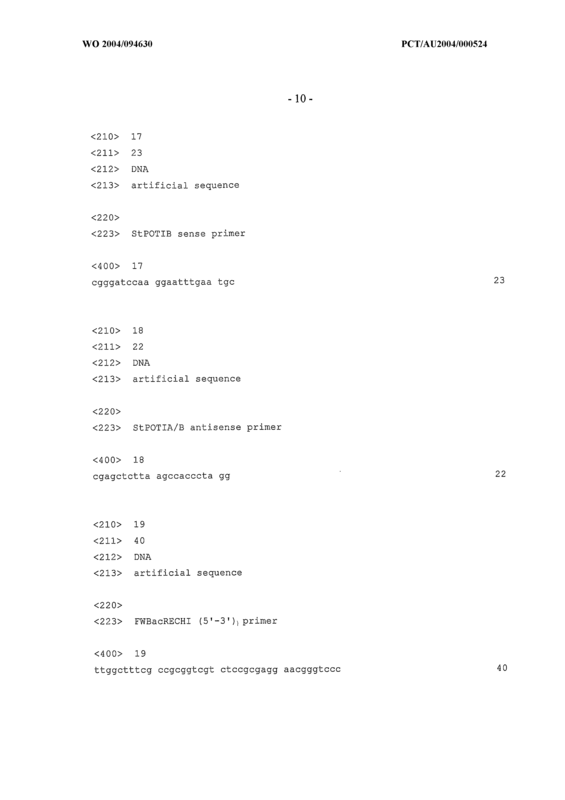 The vector of Claim 8 wherein the vector is an expression vector. 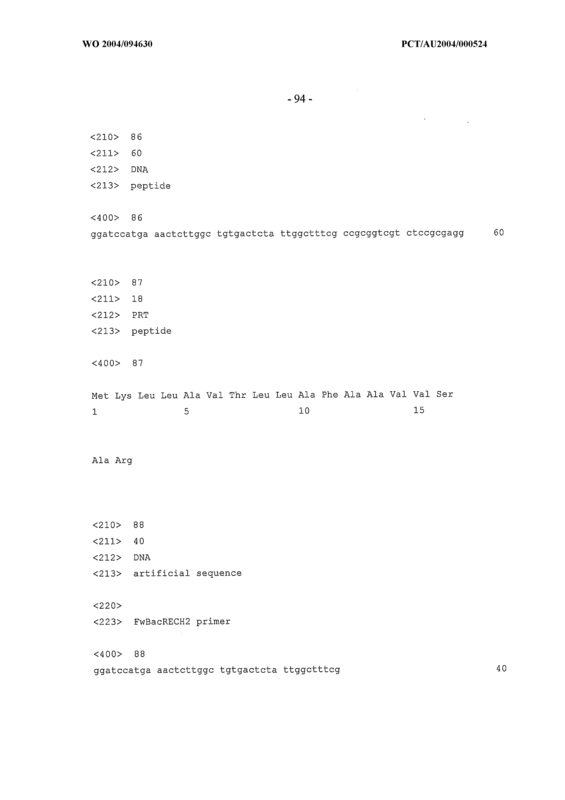 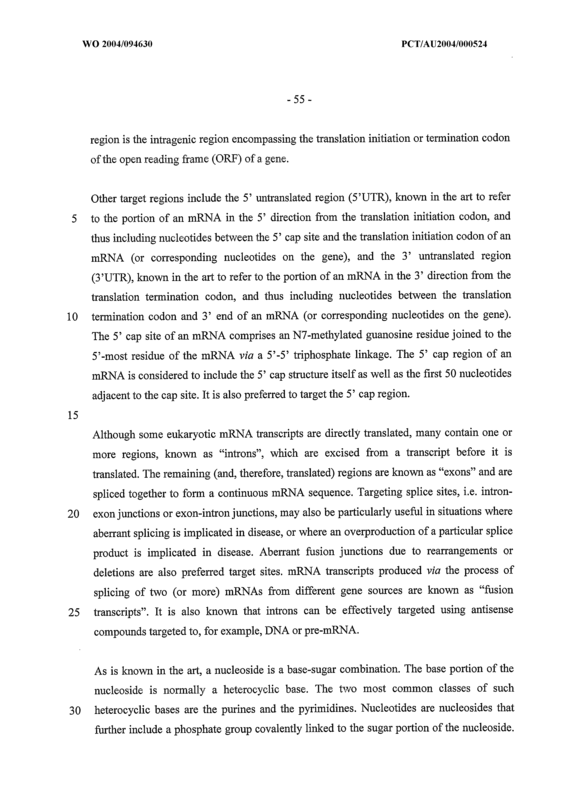 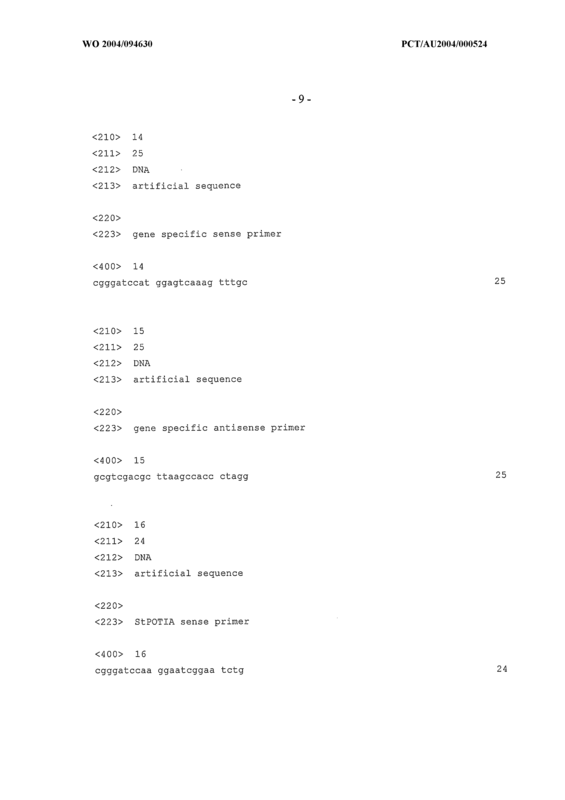 The vector of Claim 10 wherein the expression vector is operable in a prokaryotic cell. 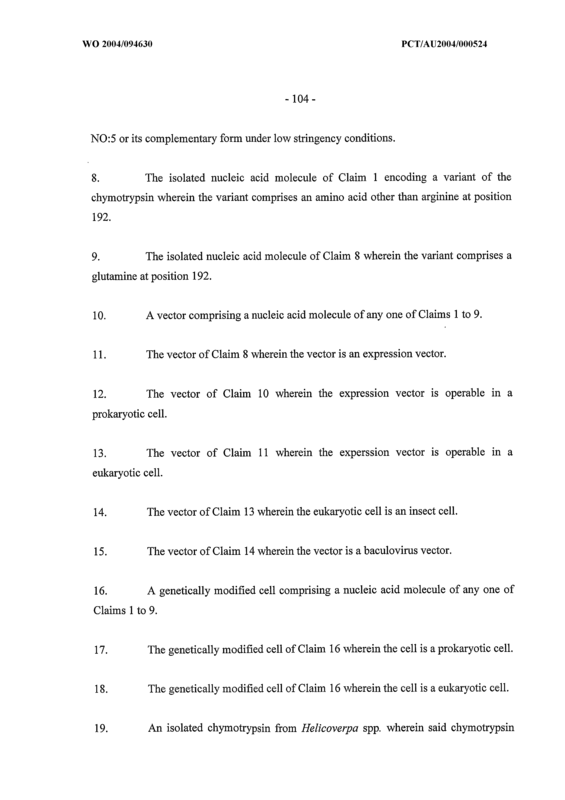 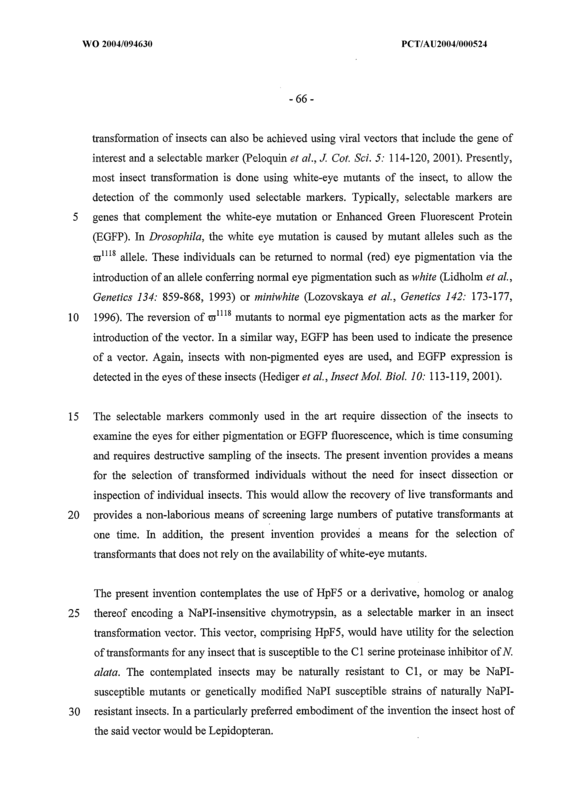 The vector of Claim 11 wherein the experssion vector is operable in a eukaryotic cell. 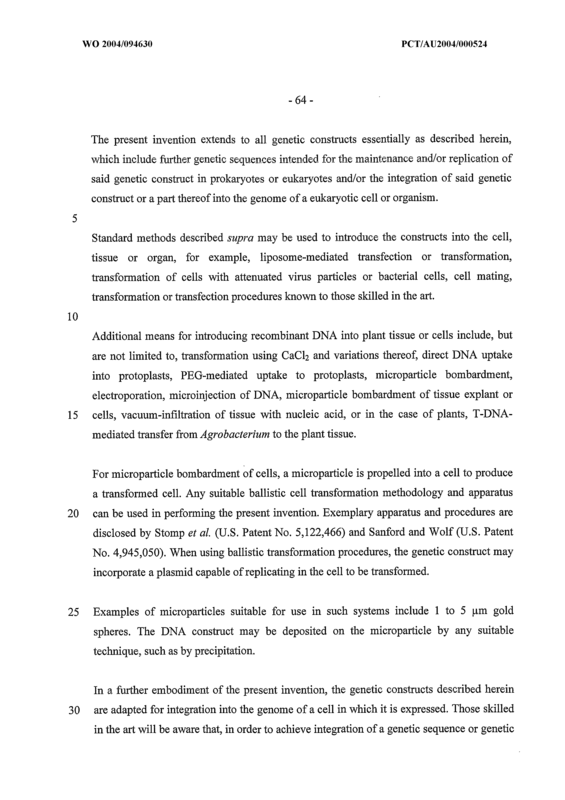 The vector of Claim 13 wherein the eukaryotic cell is an insect cell. 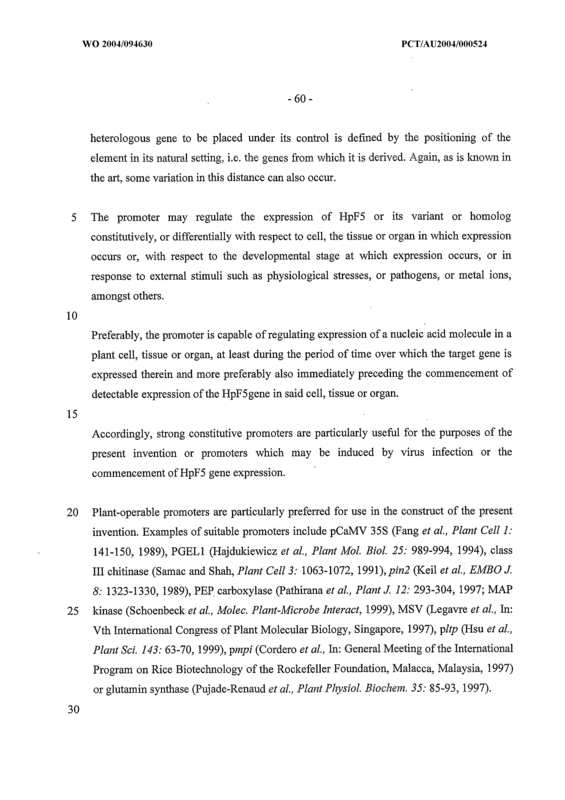 The vector of Claim 14 wherein the vector is a baculovirus vector. 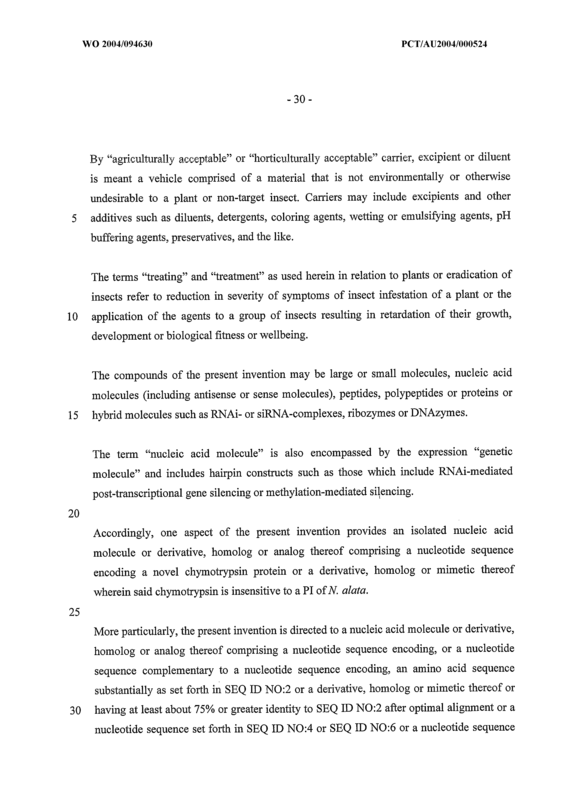 A genetically modified cell comprising a nucleic acid molecule of any one of Claims 1 to 9. 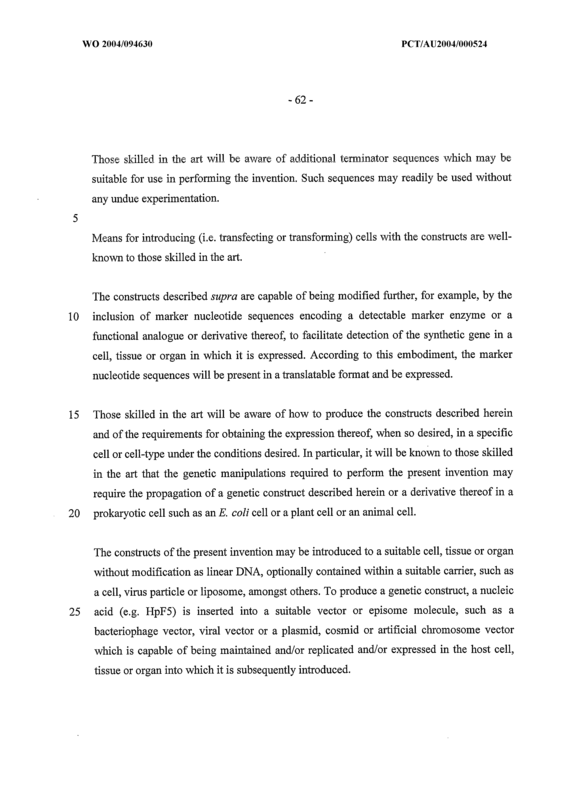 The genetically modified cell of Claim 16 wherein the cell is a prokaryotic cell. 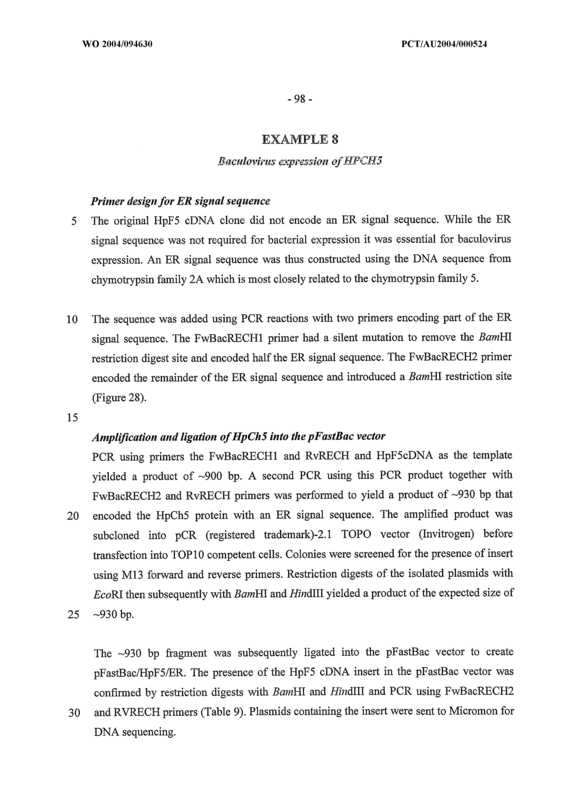 The genetically modified cell of Claim 16 wherein the cell is a eukaryotic cell. 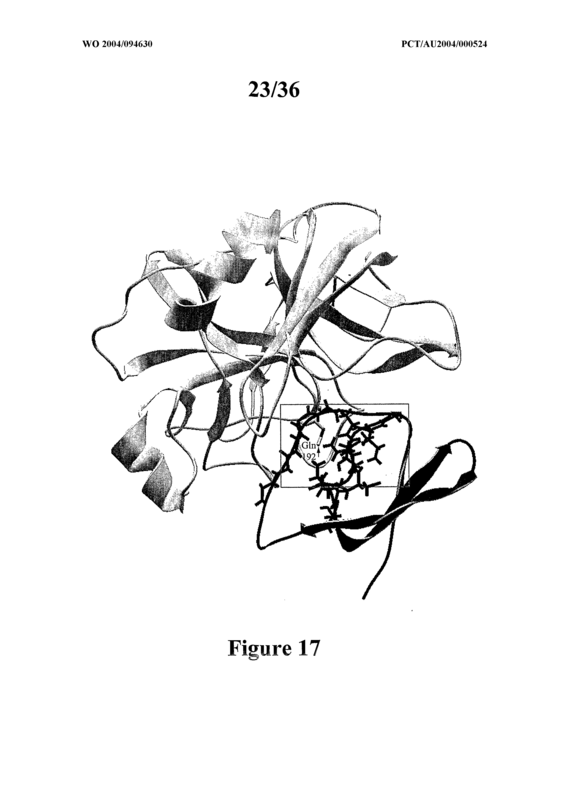 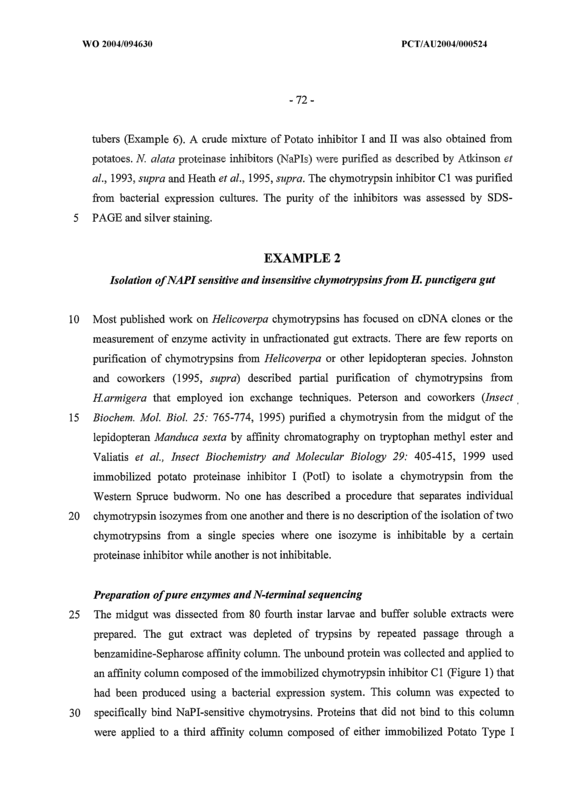 An isolated chymotrypsin from Helicoverpa spp. 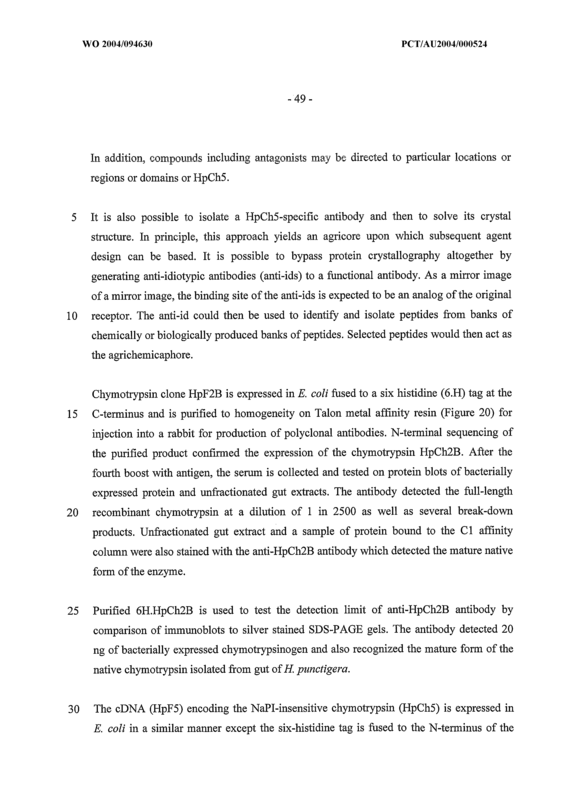 wherein said chymotrypsin exhibits resistance to a PI from N. alata or a variant, derivative, homolog or analog of said chymotrypsin. 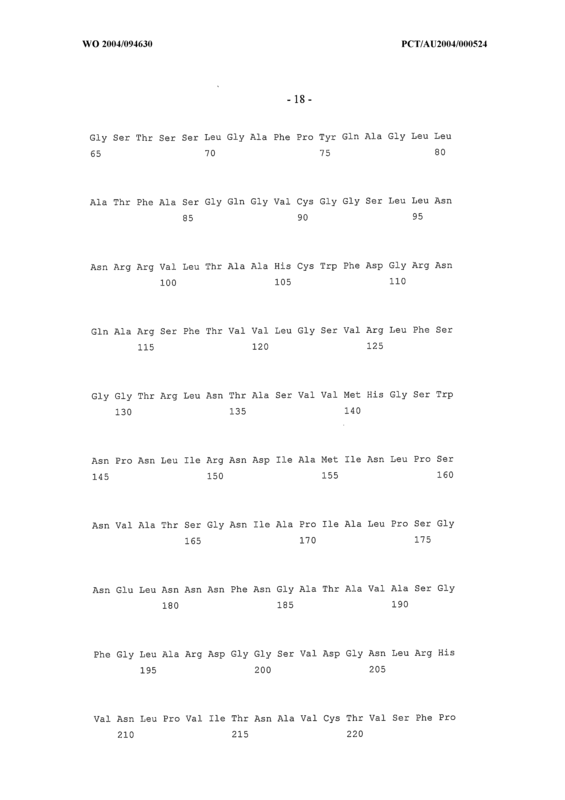 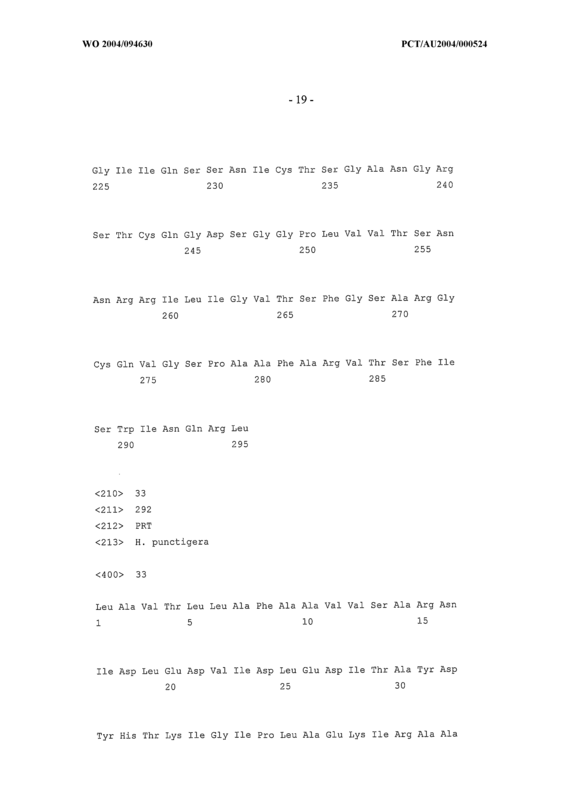 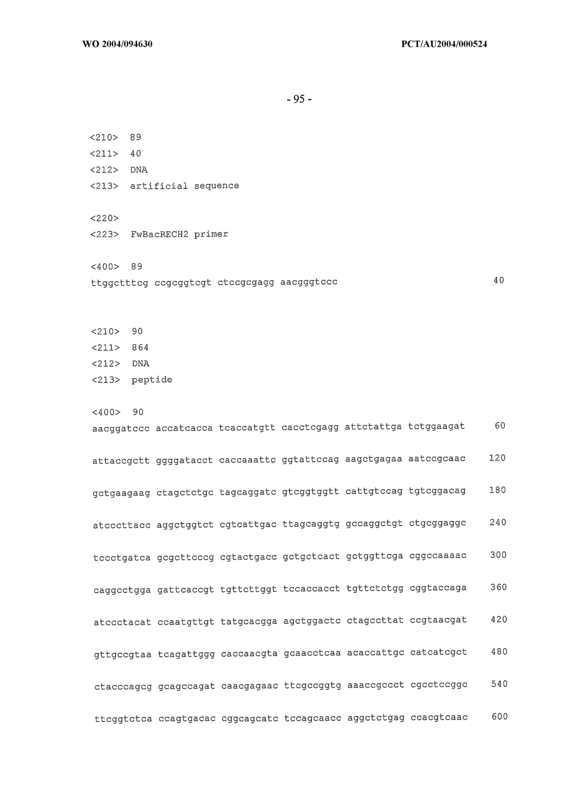 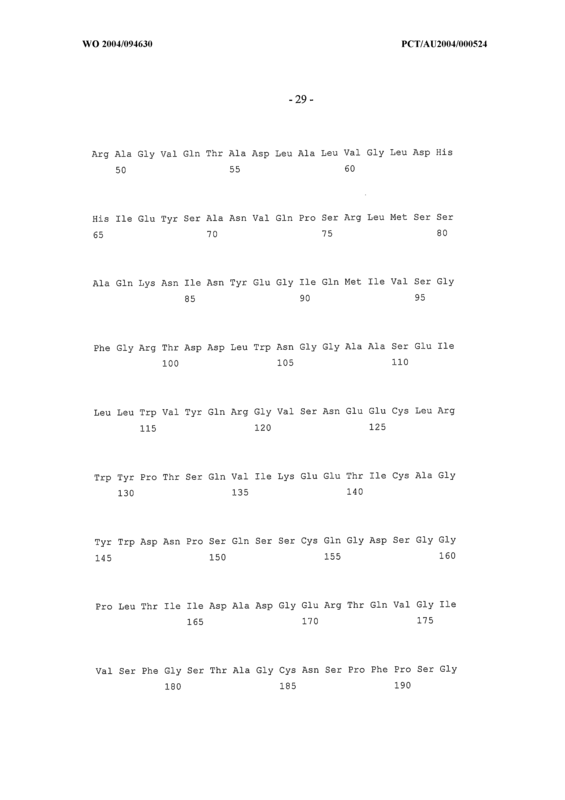 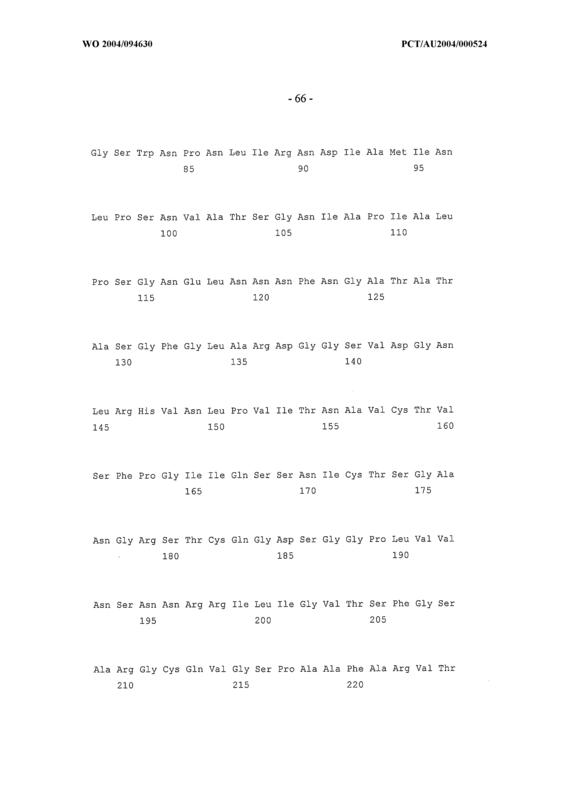 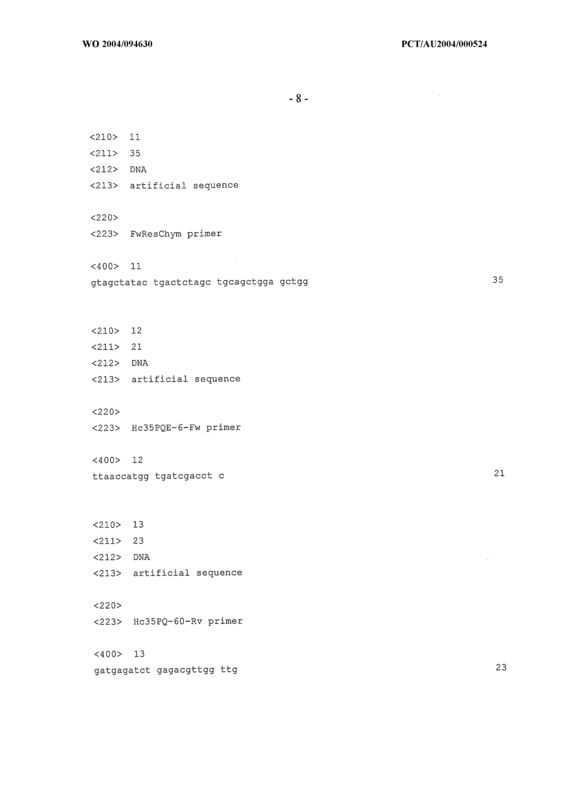 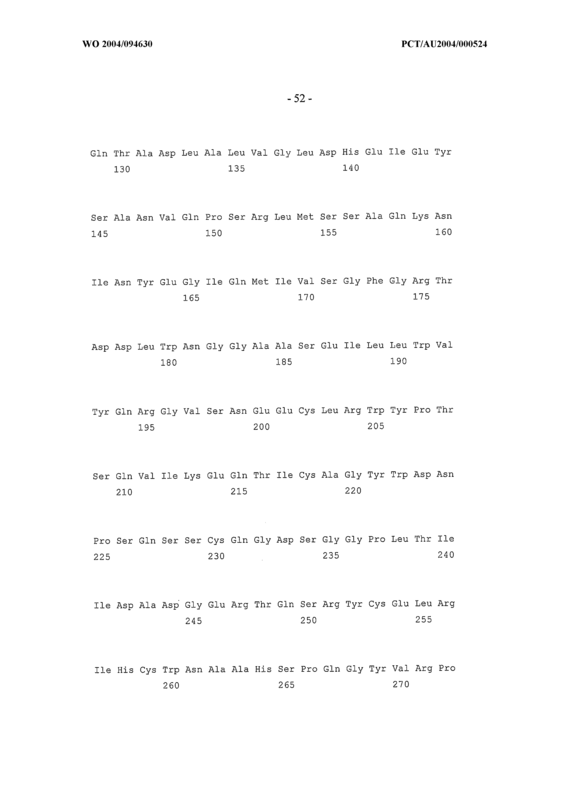 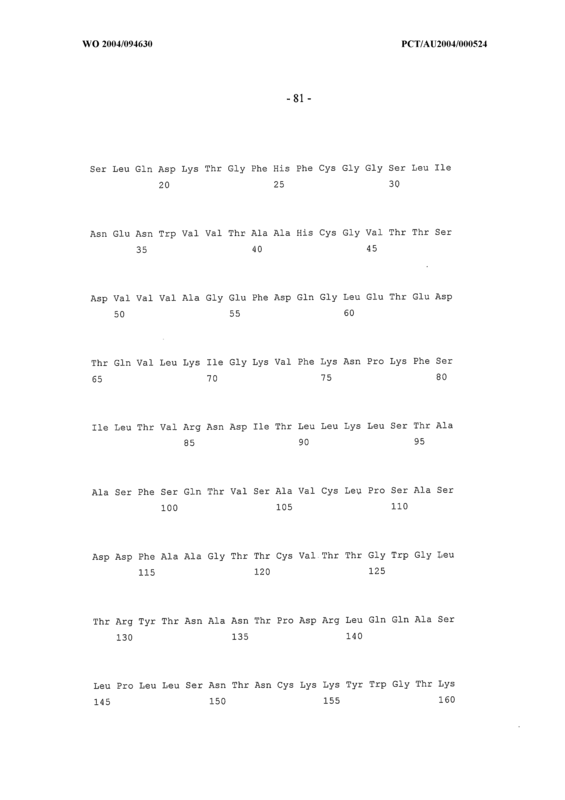 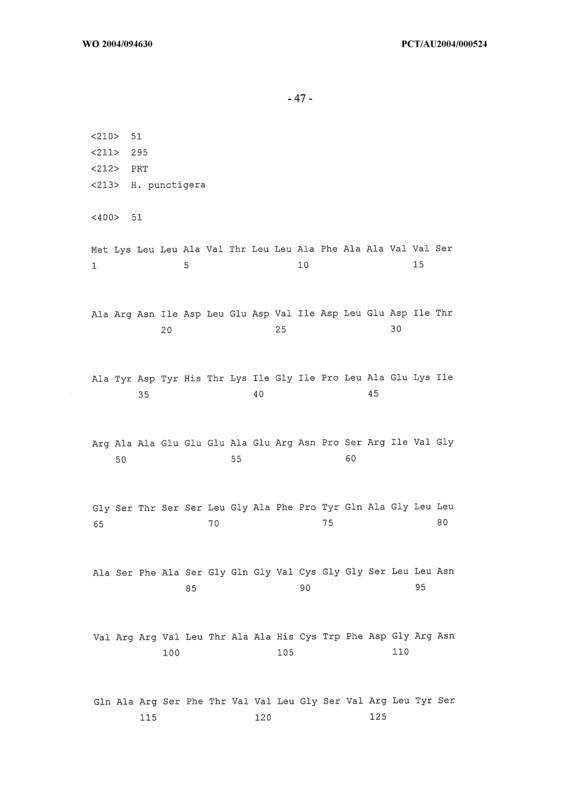 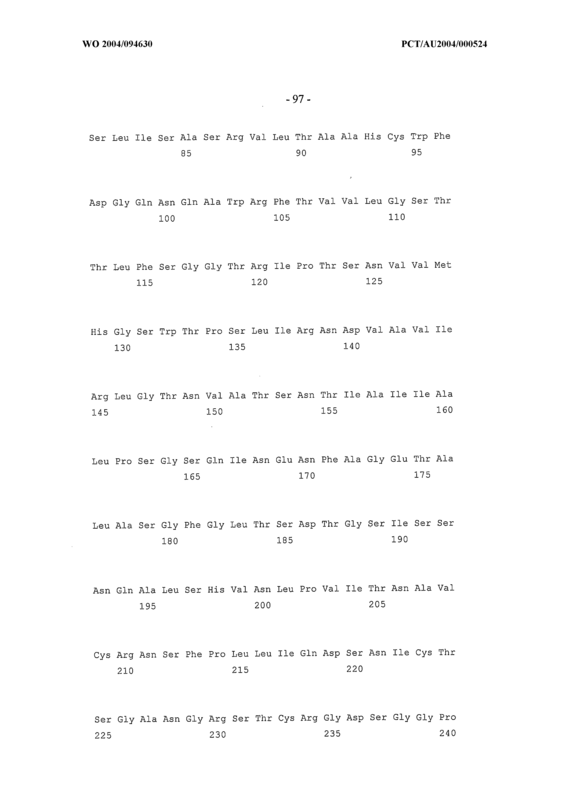 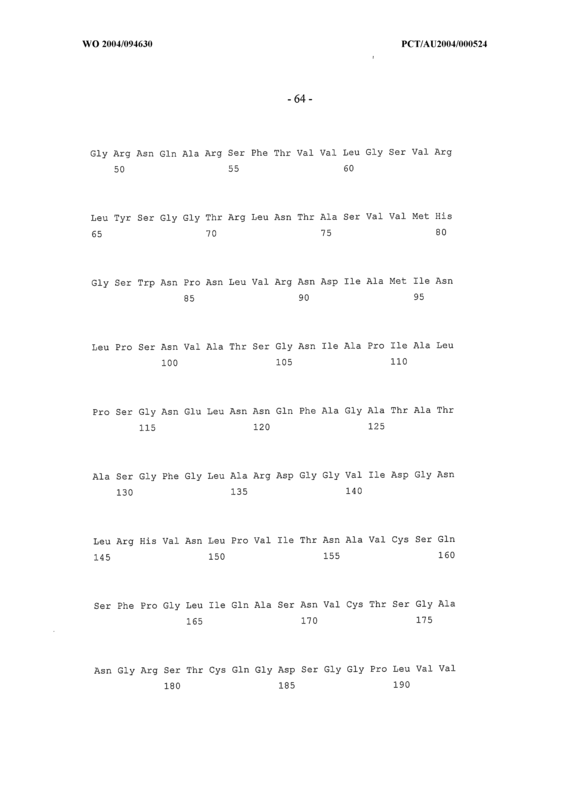 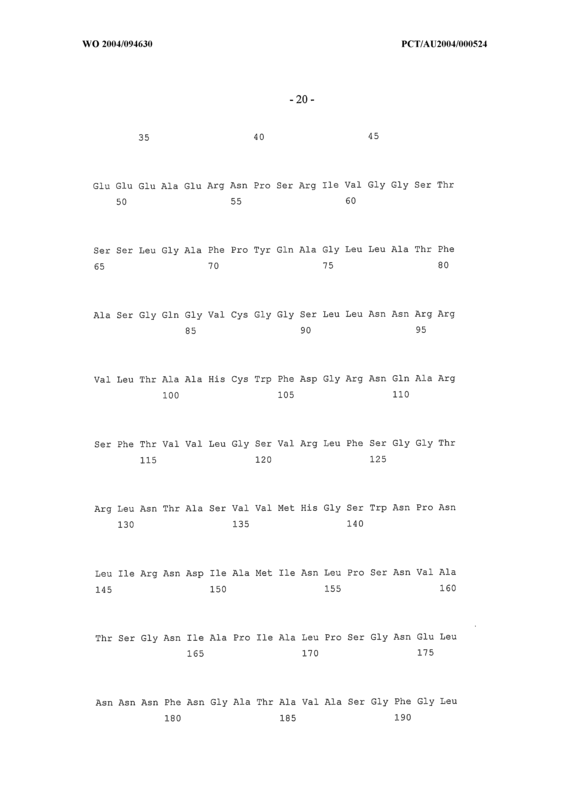 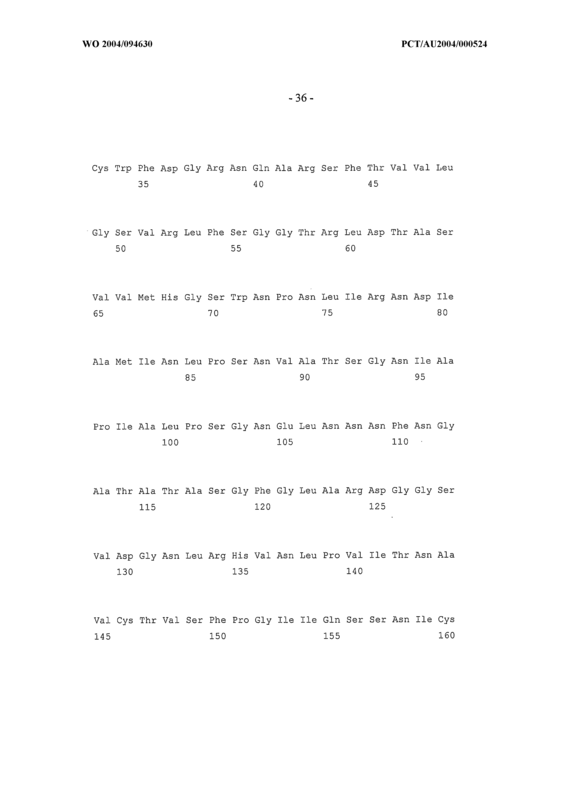 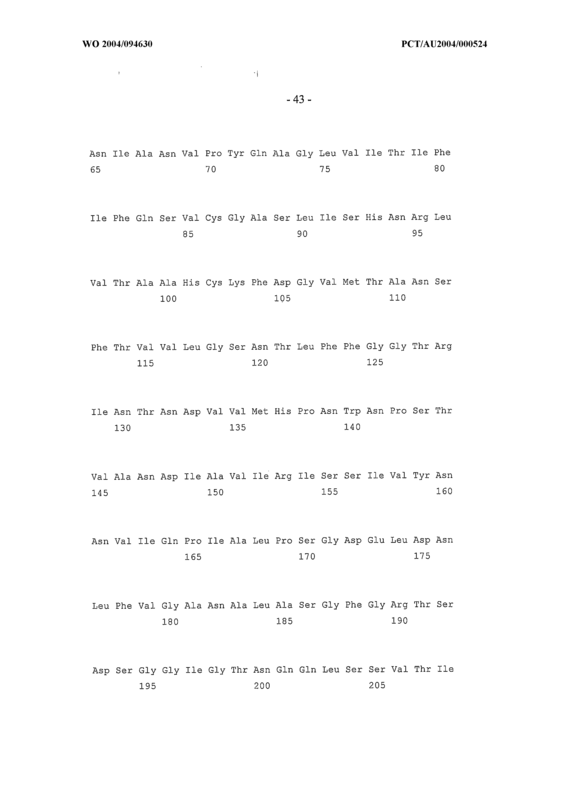 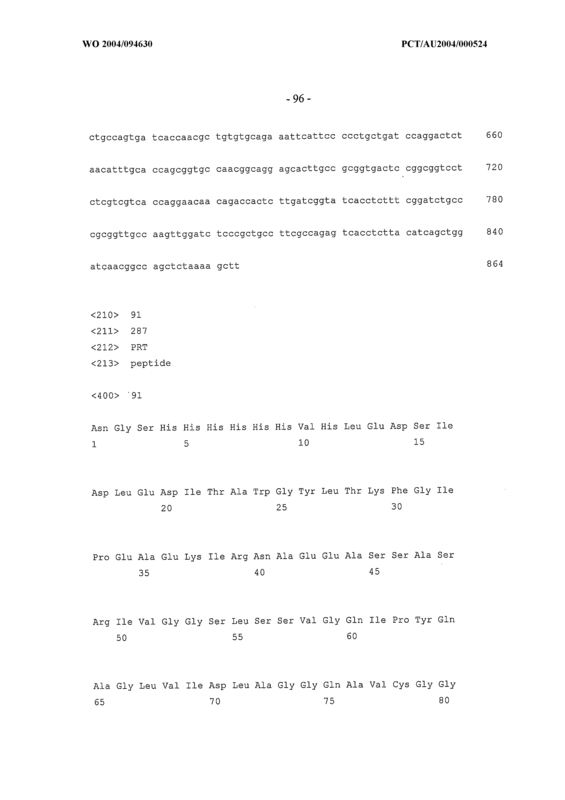 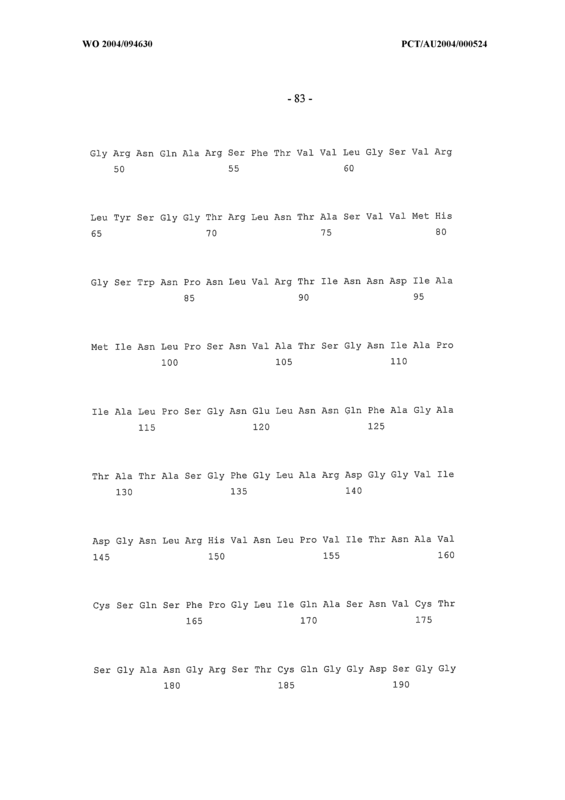 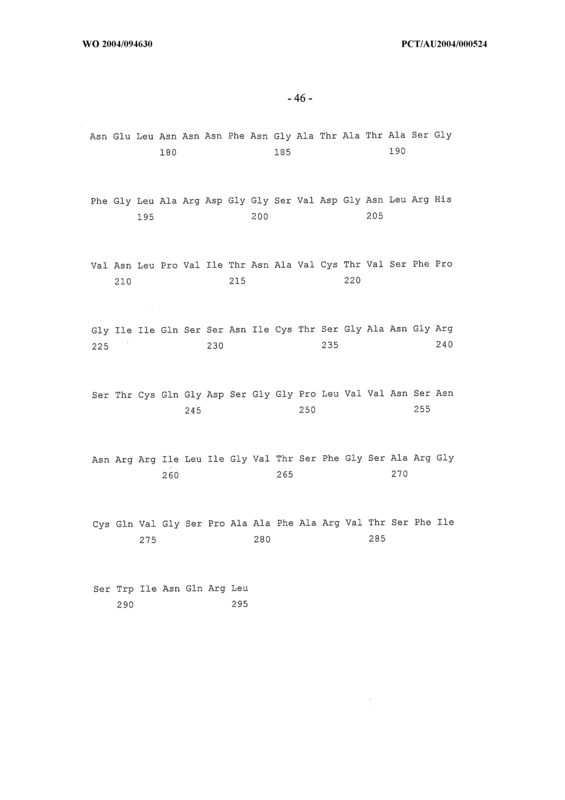 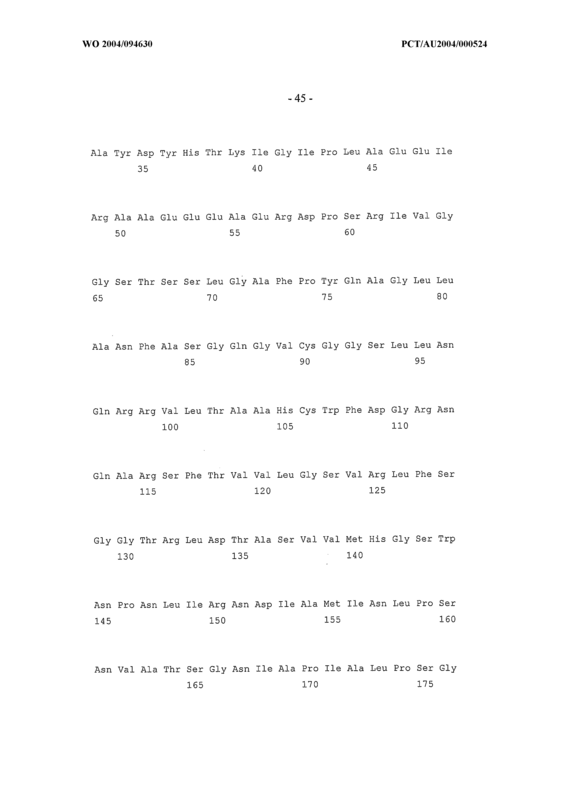 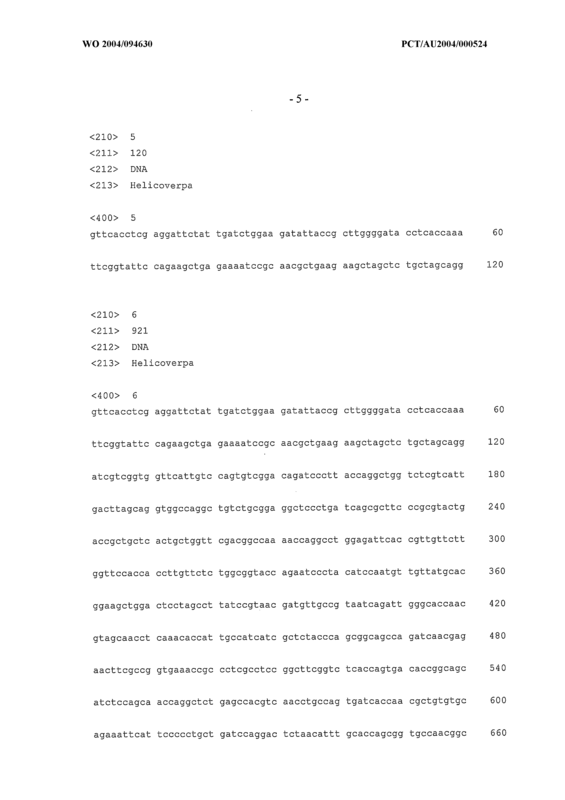 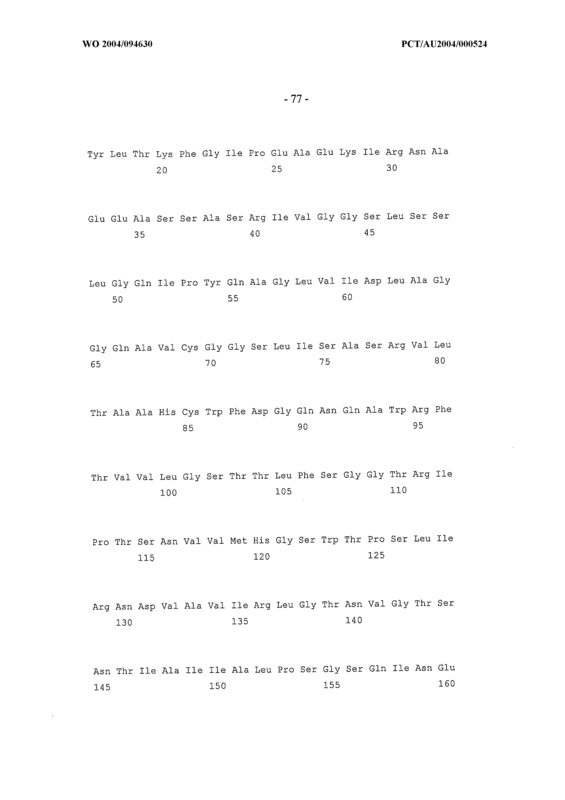 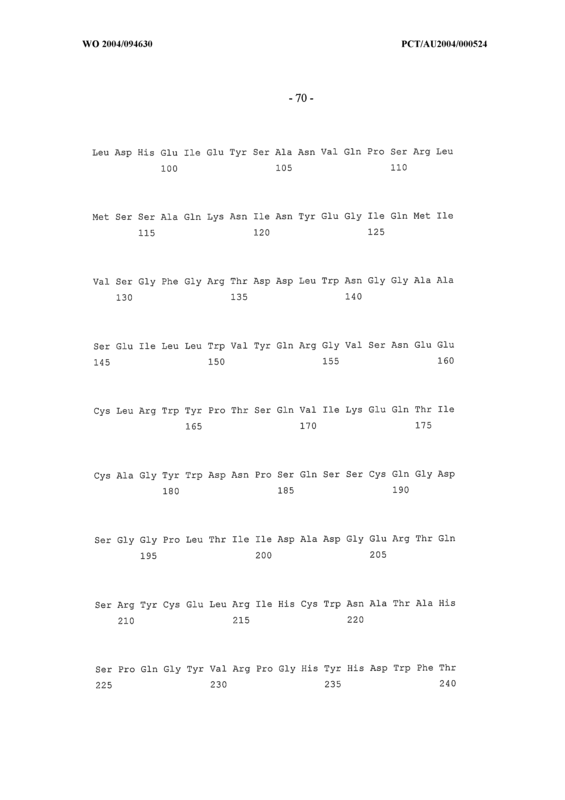 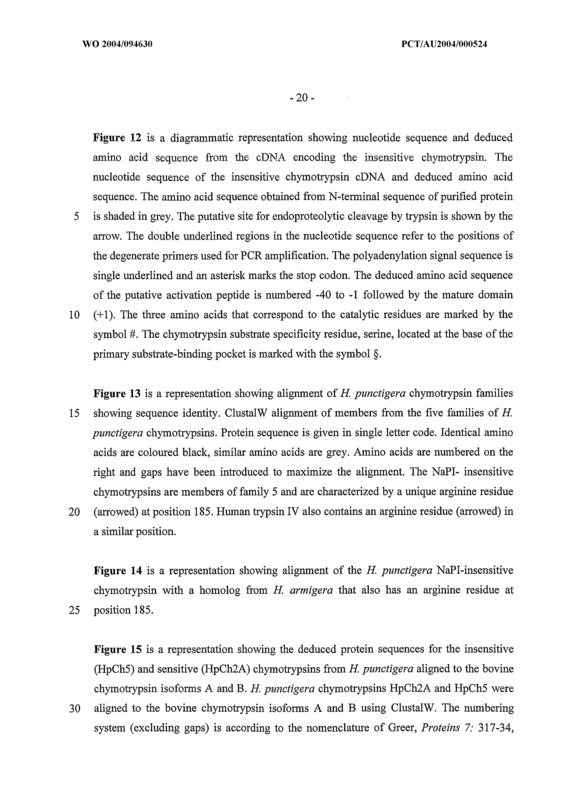 The isolated chymotrypsin of Claim 19 comprising an amino acid sequence set forth in SEQ ID ΝO:2 or an amino acid sequence having at least about 75% similarity to SEQ ID NO: 2 after optimal alignment. 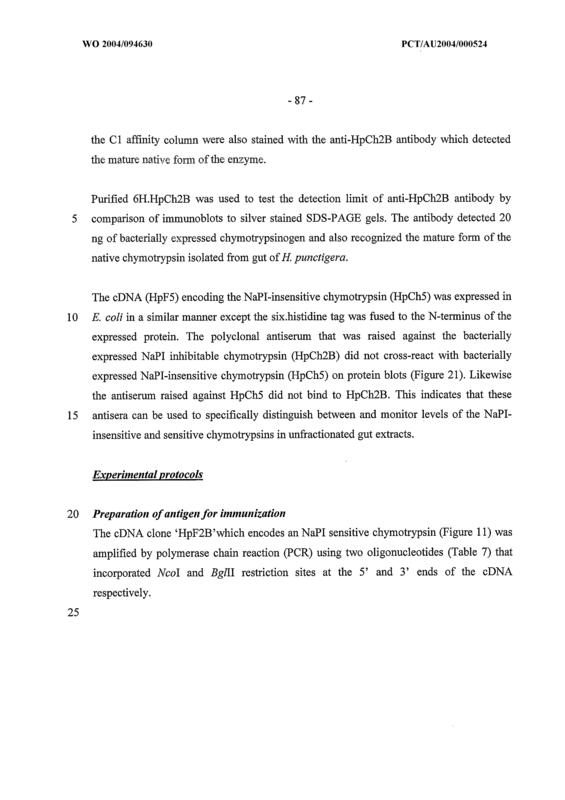 The isolated chymotrypsin of Claim 20 comprising an amino acid sequence as set forth in SEQ ID NO:2. 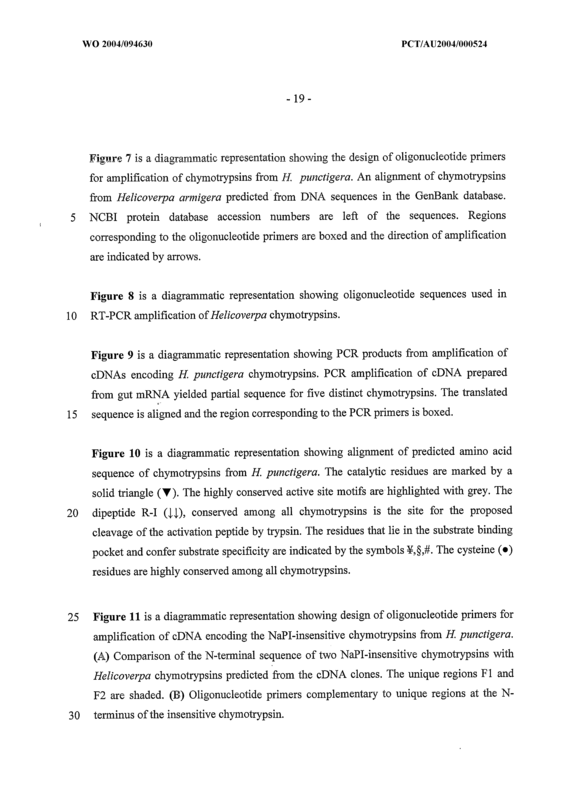 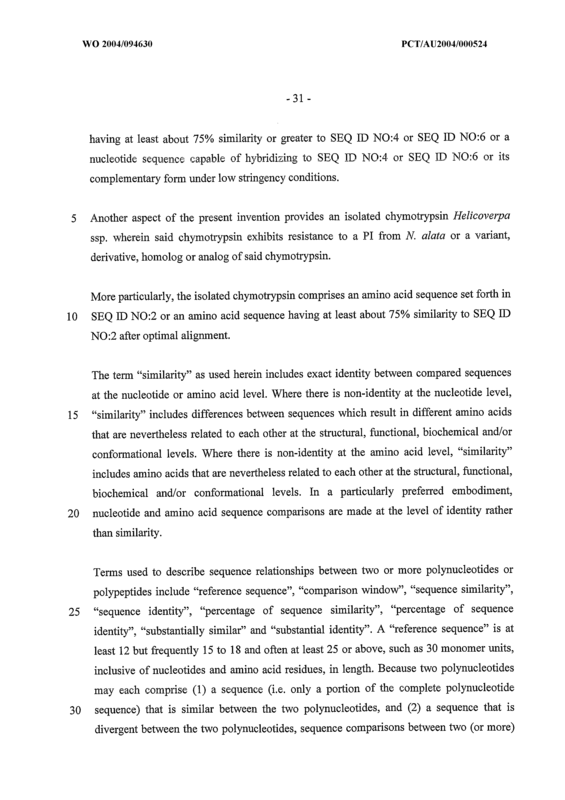 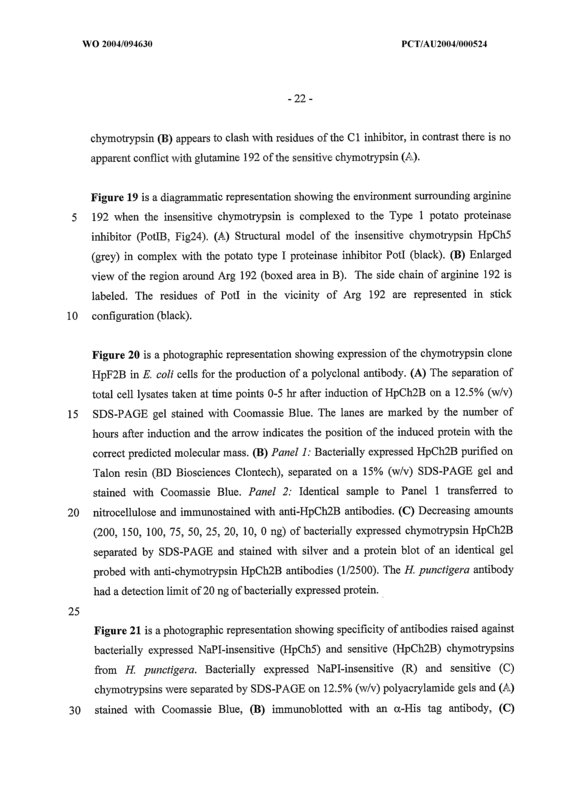 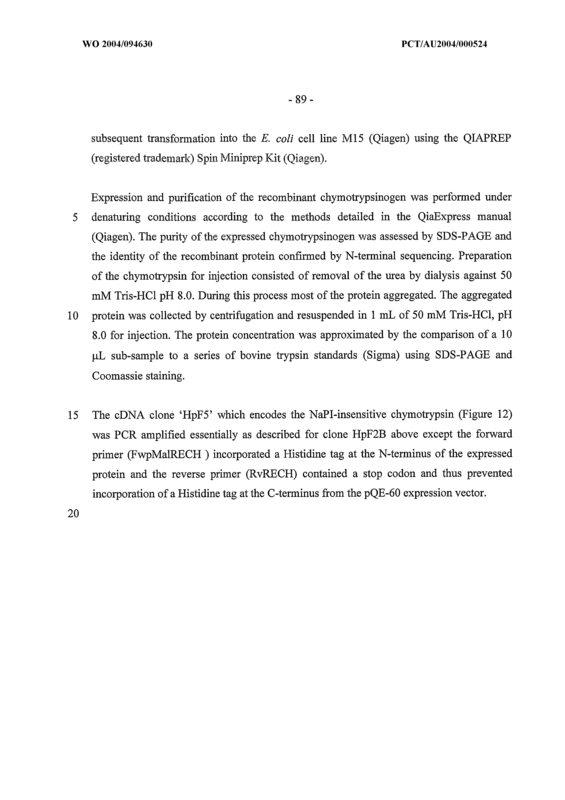 The isolated chymotrypsin of Claim 19 encoded by a nucleotide sequence having at least about 15% identity to SEQ ID NO:4 or SEQ ID NO:6 after optimal alignment or a nucleotide sequence capable of hybridizing to SEQ ID NO:4 or SEQ ID NO: 6 or its complementary form under low stringency conditions. 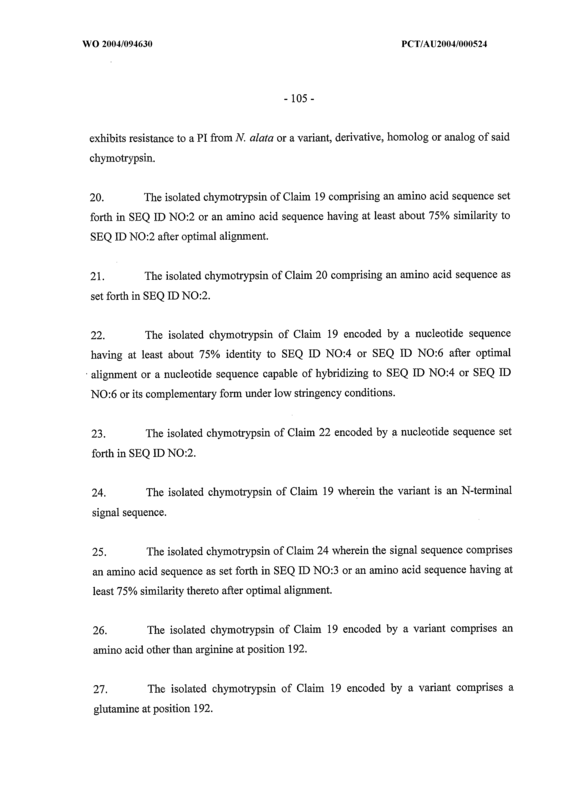 The isolated chymotrypsin of Claim 22 encoded by a nucleotide sequence set forth in SEQ ID NO:2. 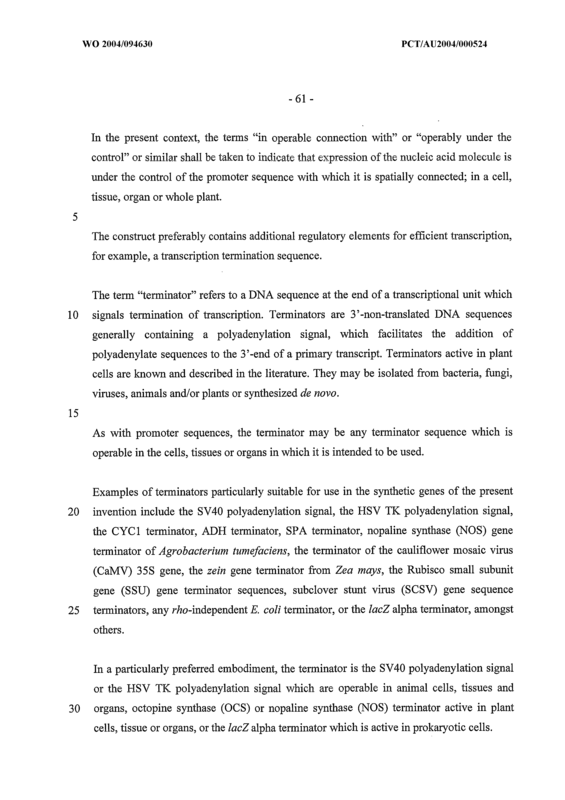 The isolated chymotrypsin of Claim 19 wherein the variant is an N-terminal signal sequence. 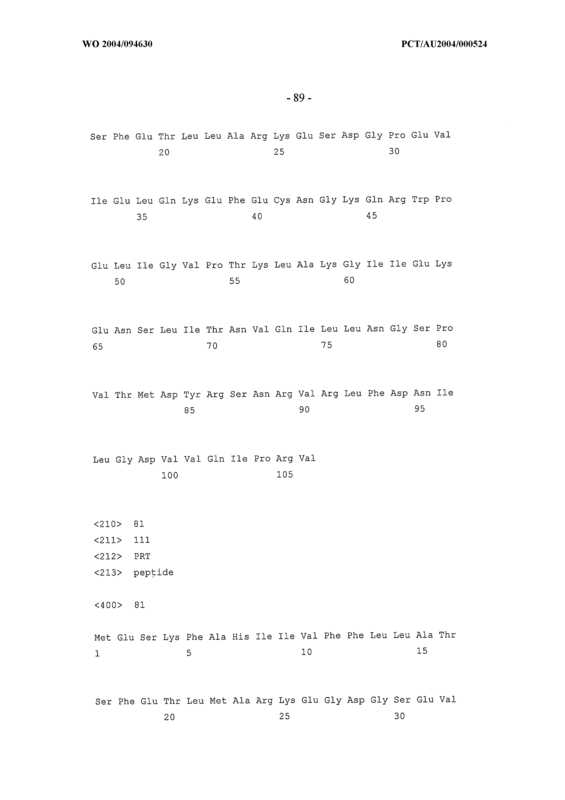 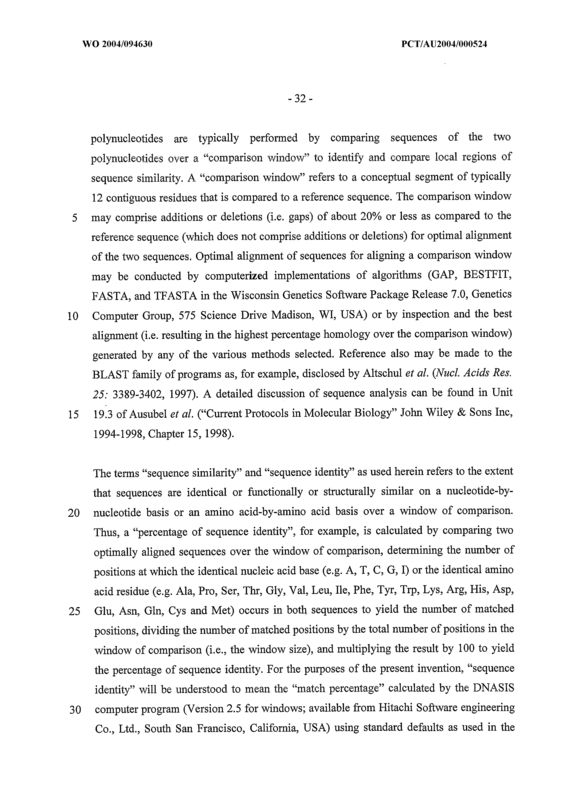 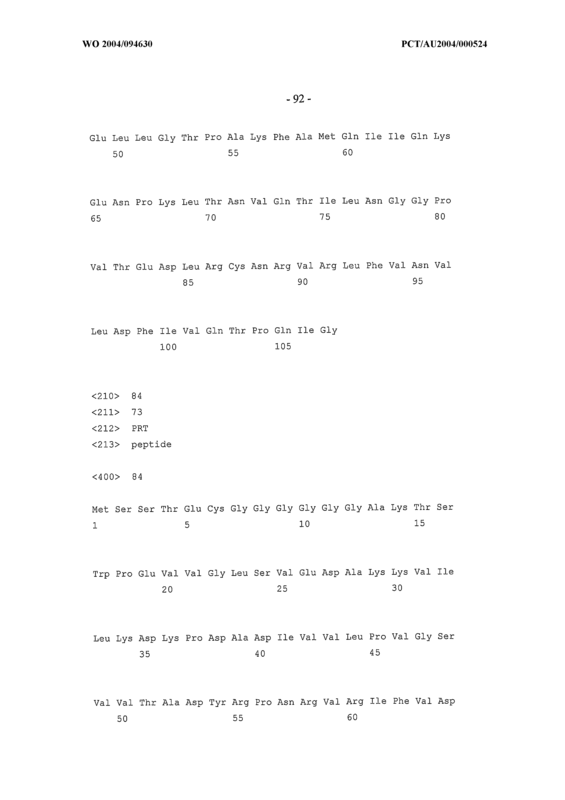 The isolated chymotrypsin of Claim 24 wherein the signal sequence comprises an amino acid sequence as set forth in SEQ ID NO: 3 or an amino acid sequence having at least 75%) similarity thereto after optimal alignment. 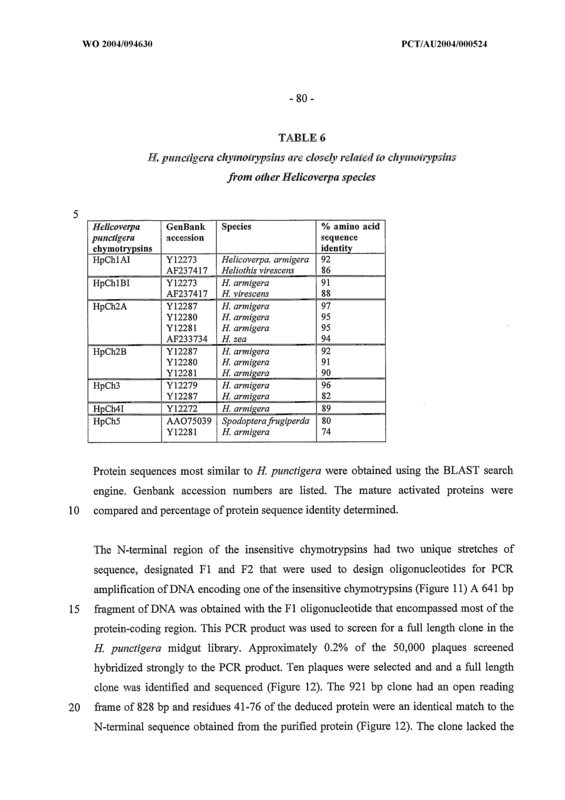 The isolated chymotrypsin of Claim 19 encoded by a variant comprises an amino acid other than arginine at position 192. 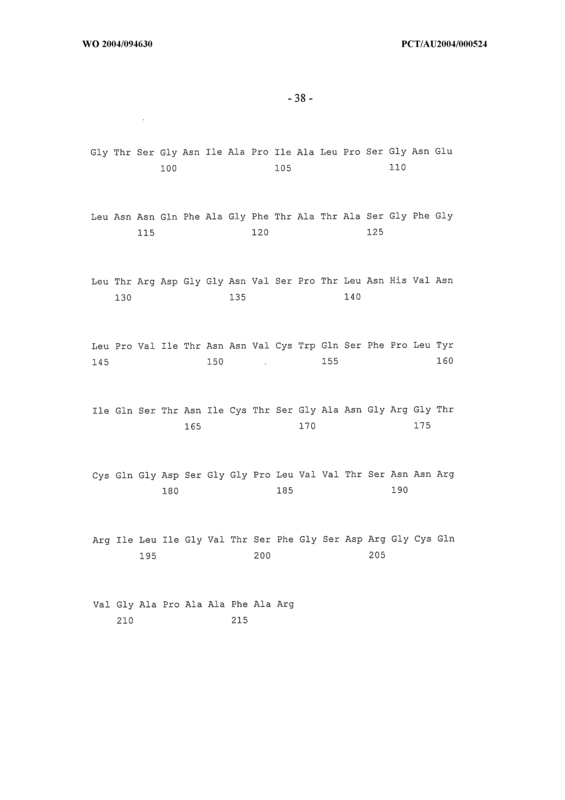 The isolated chymotrypsin of Claim 19 encoded by a variant comprises a glutamine at position 192. 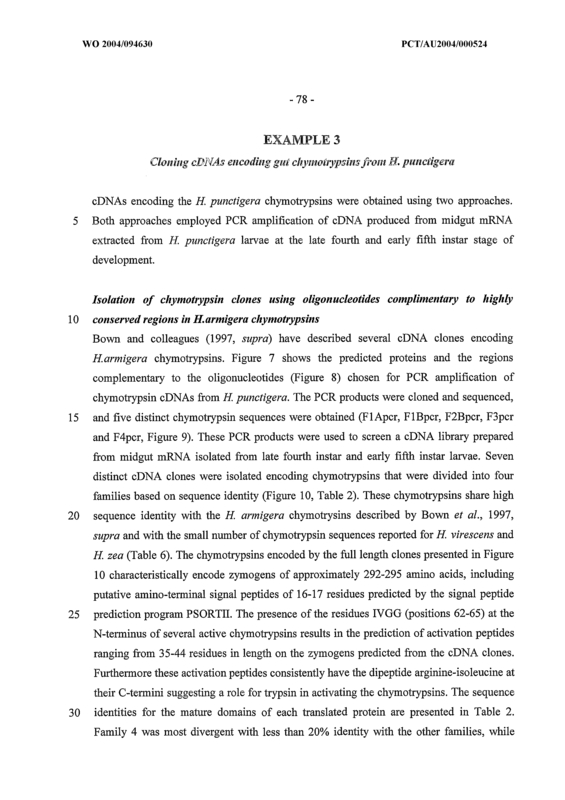 The isolated chymotrypsin encoded by a nucleic acid molecule of any one of Claims 1 to 9. 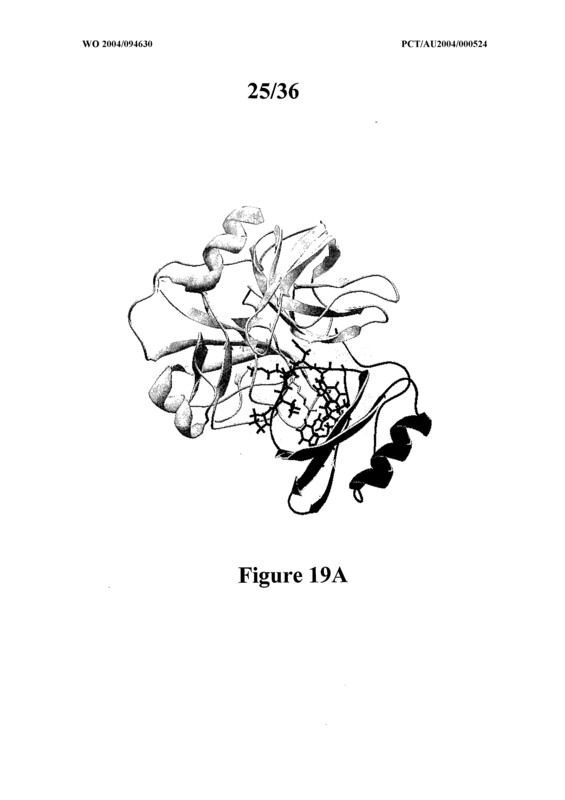 An antagonist of a chymotrypsin as defined in any one of Claims 19 to 28. 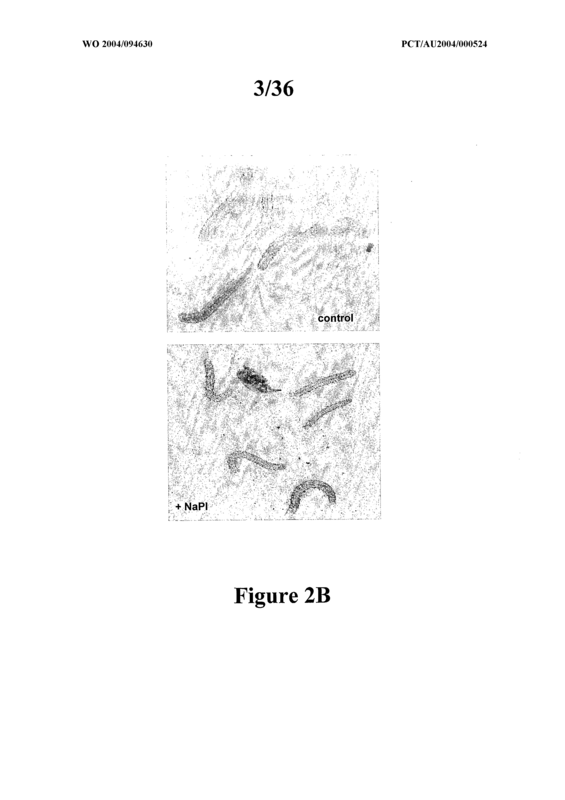 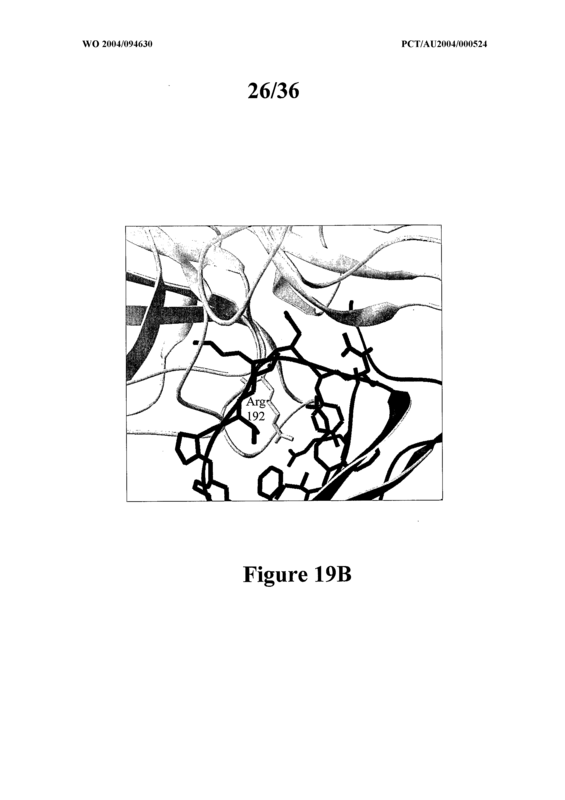 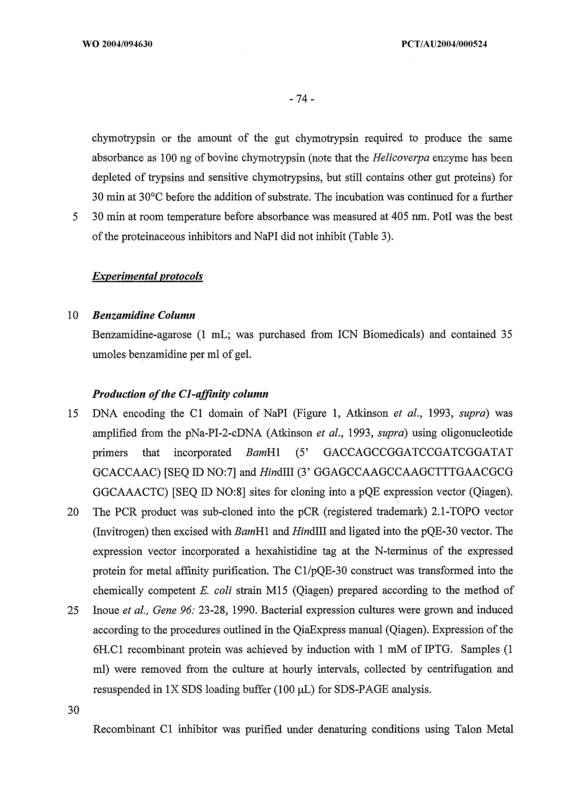 The antagonist of Claim 29 wherein the antagonist binds or interacts with the chymotrypsin at or near amino acid residue position 192. 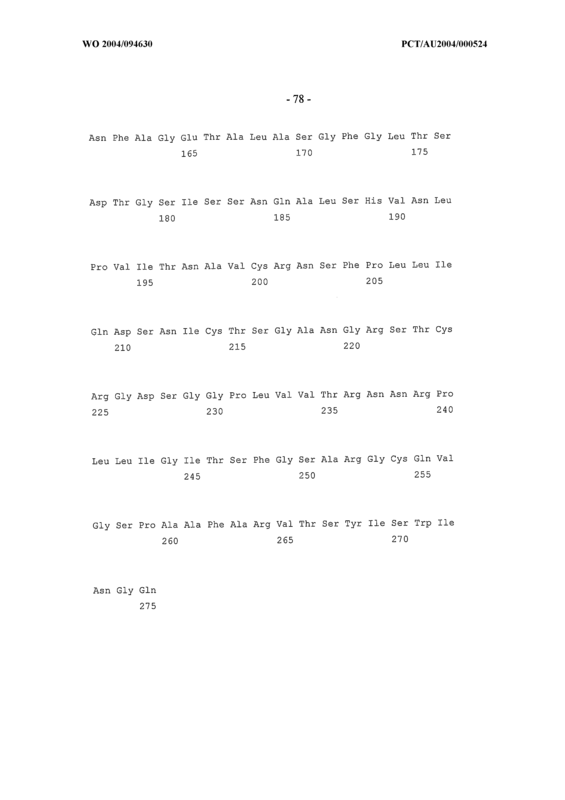 The antagonist of Claim 29 or 30 wherein said antagonist is Potl. 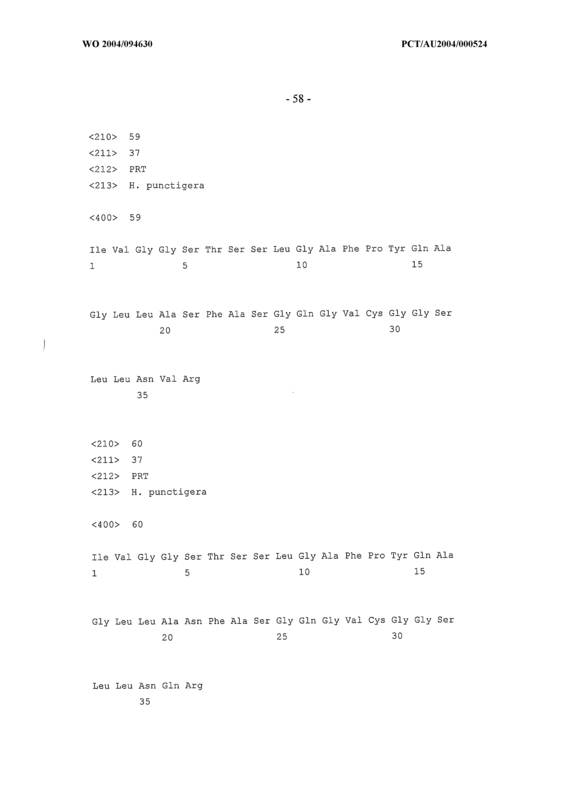 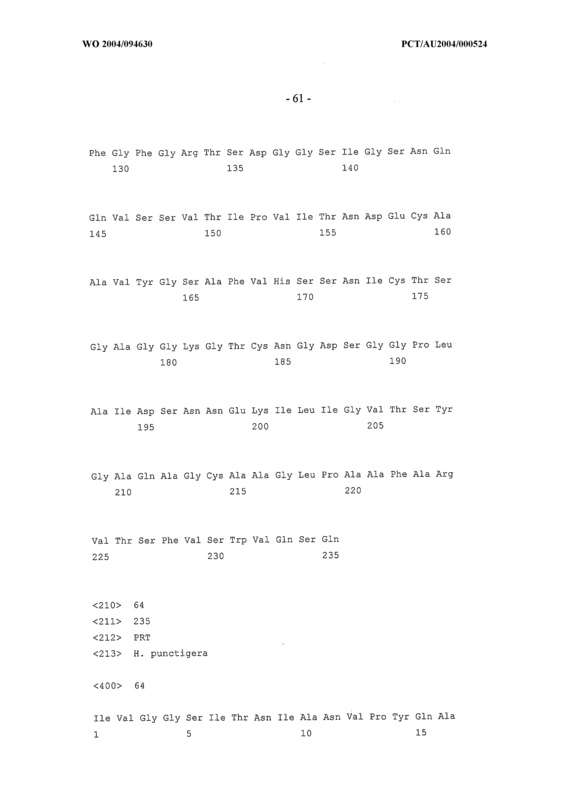 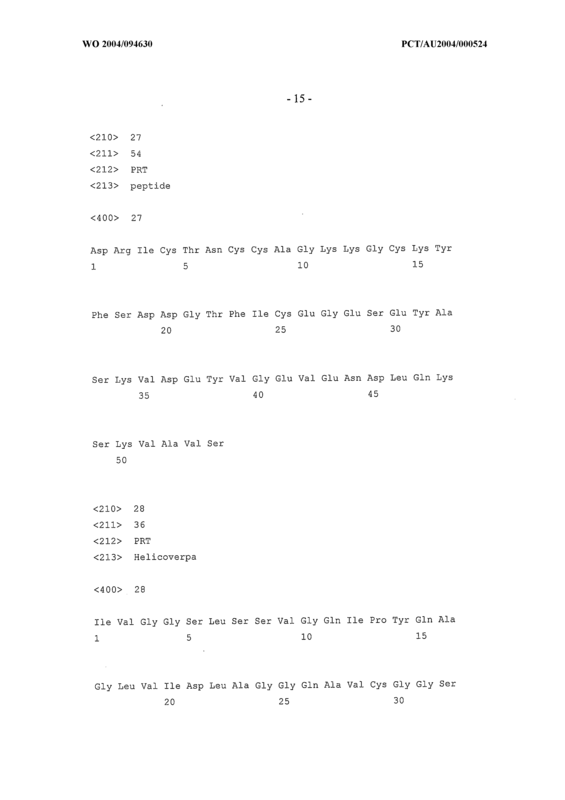 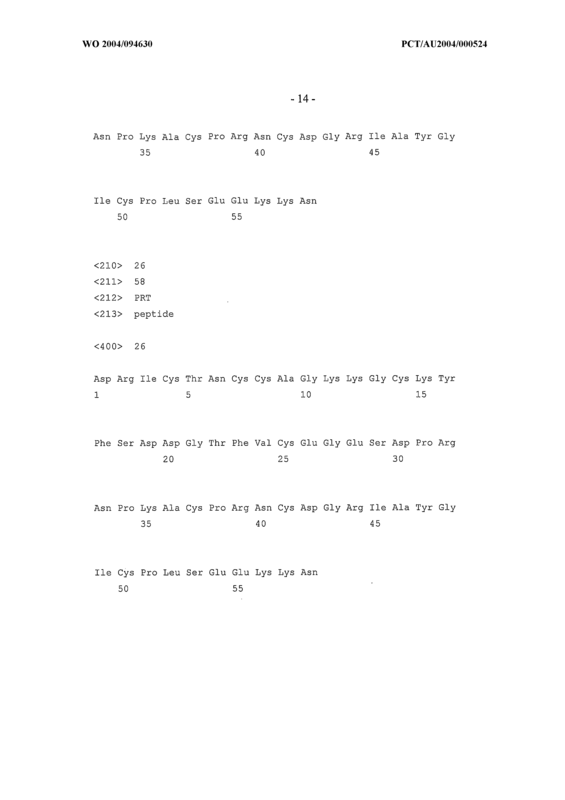 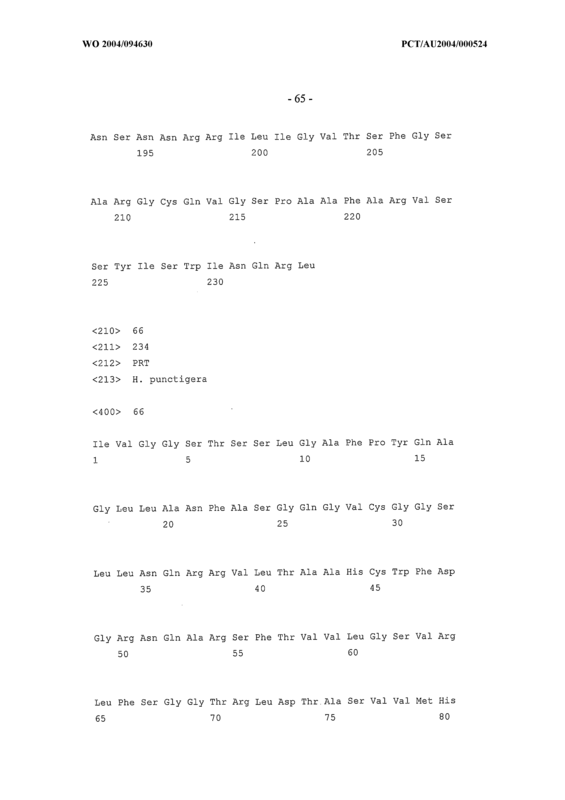 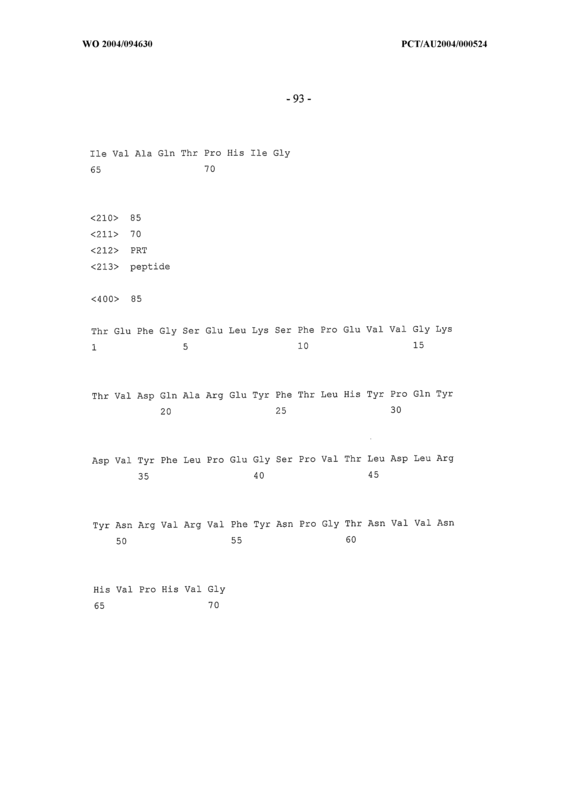 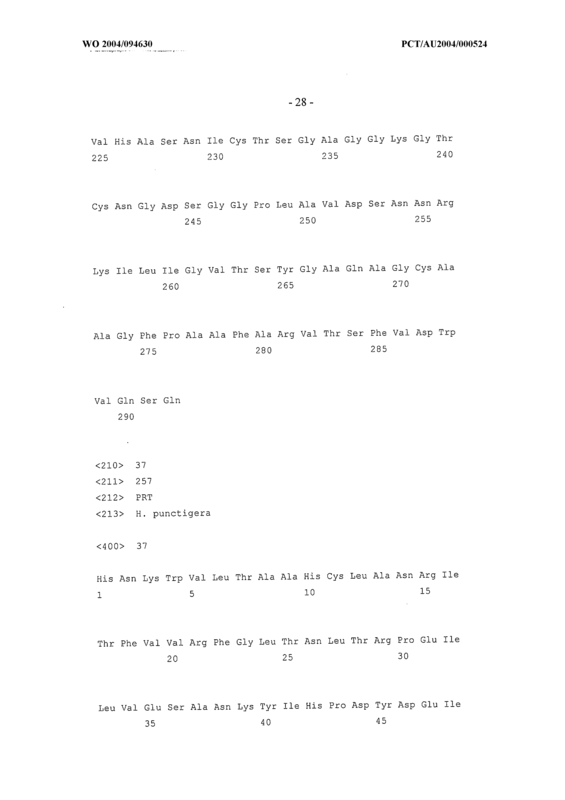 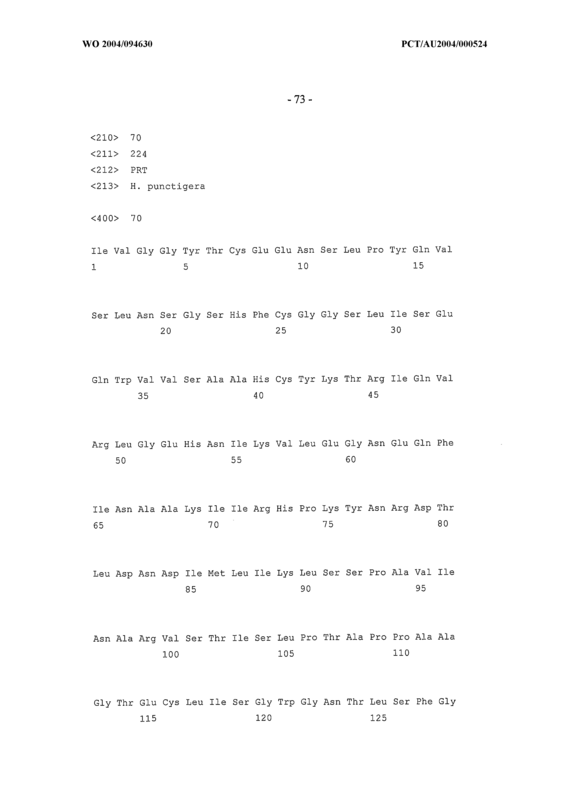 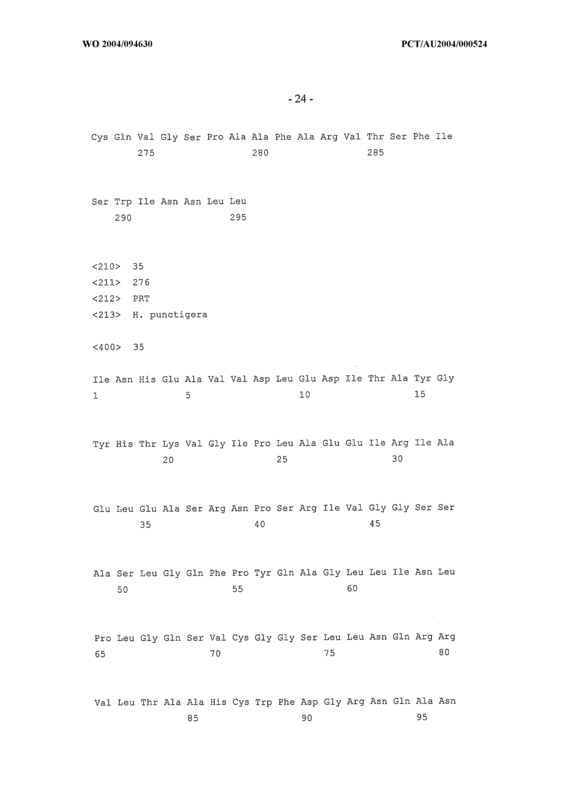 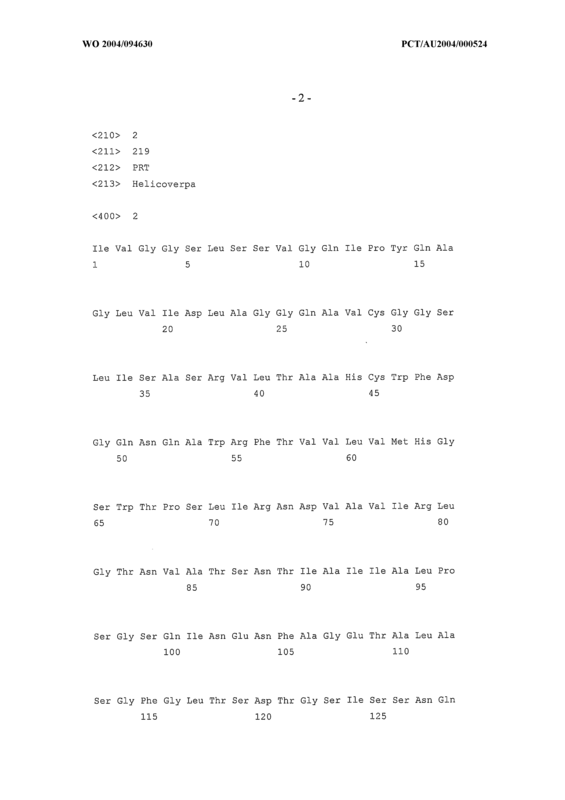 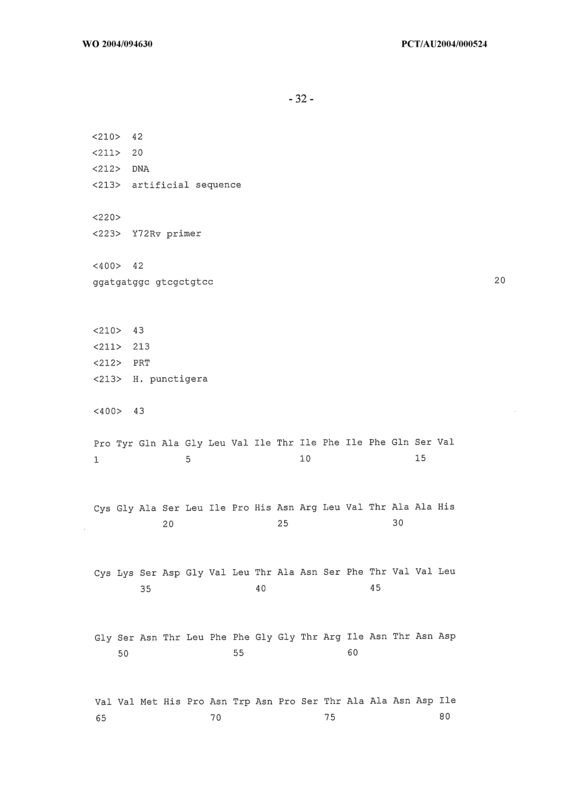 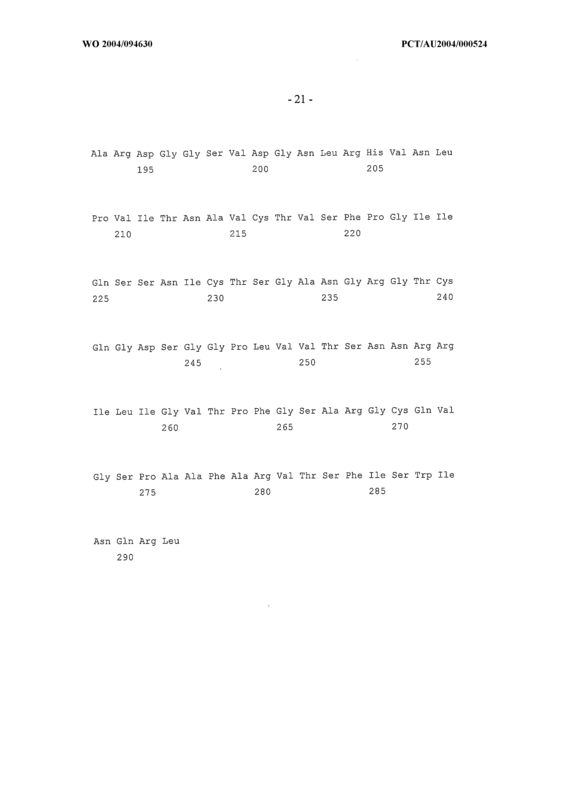 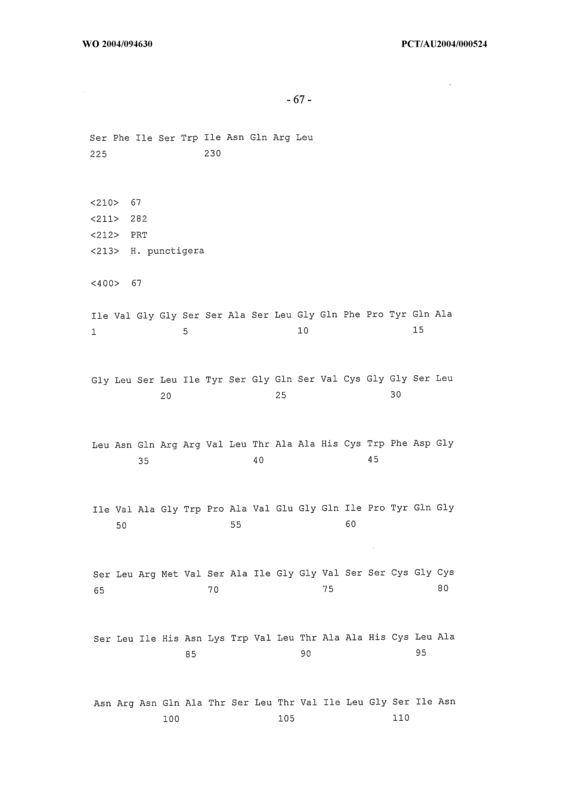 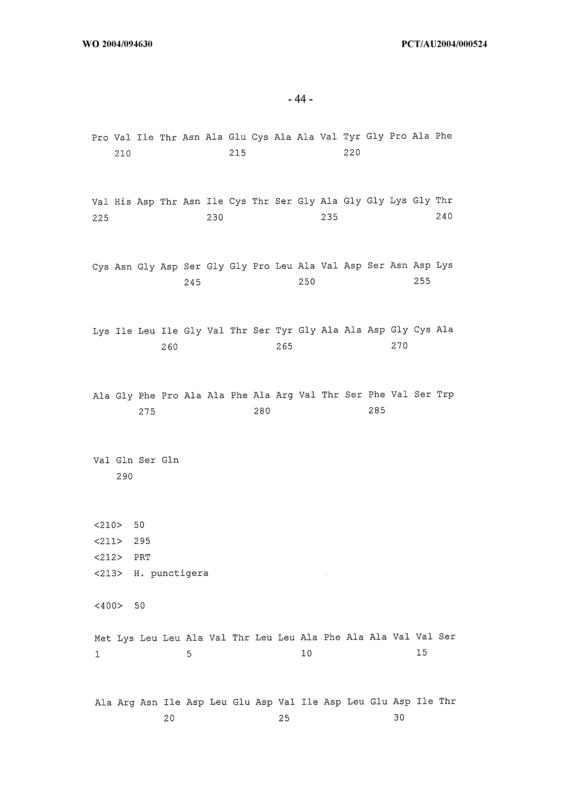 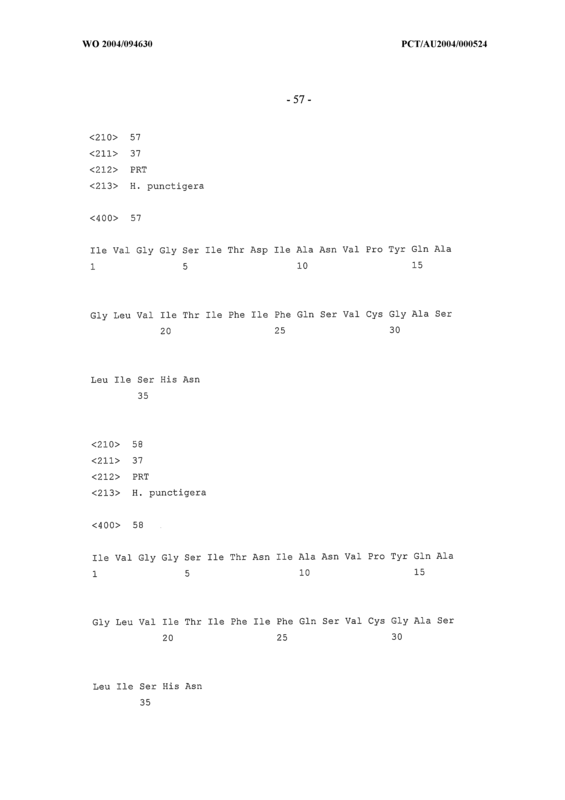 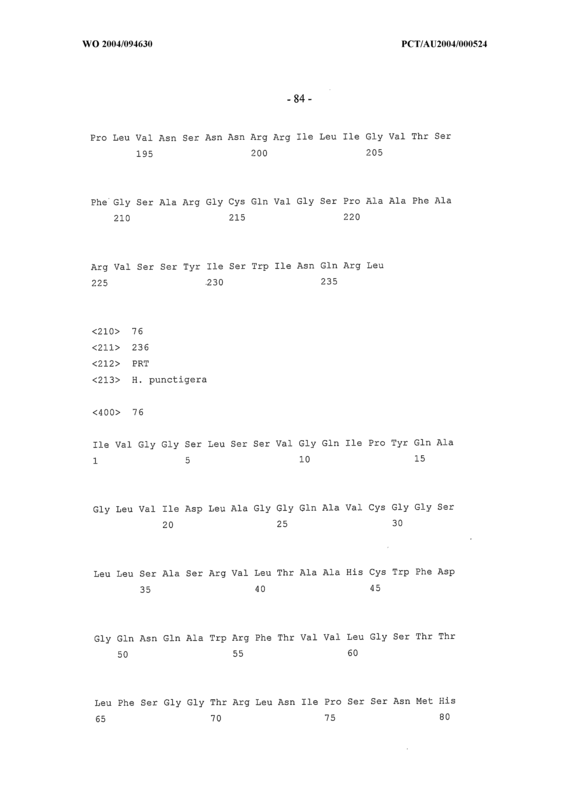 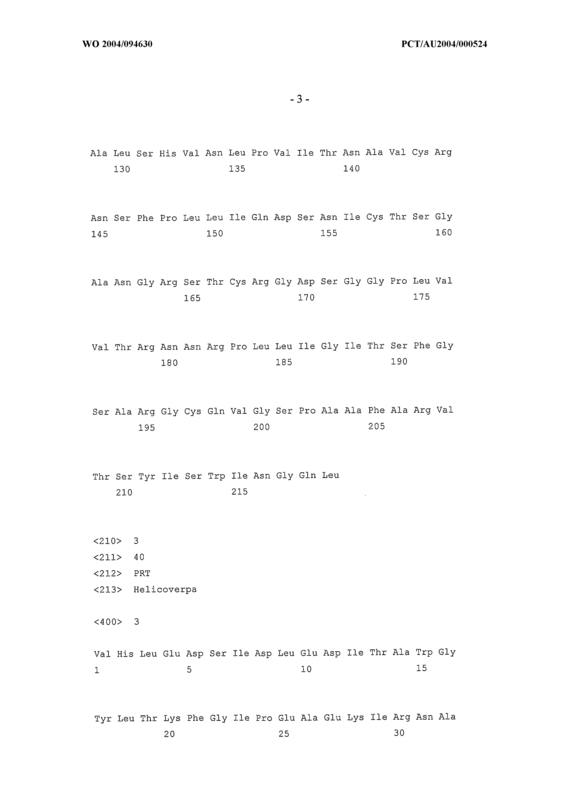 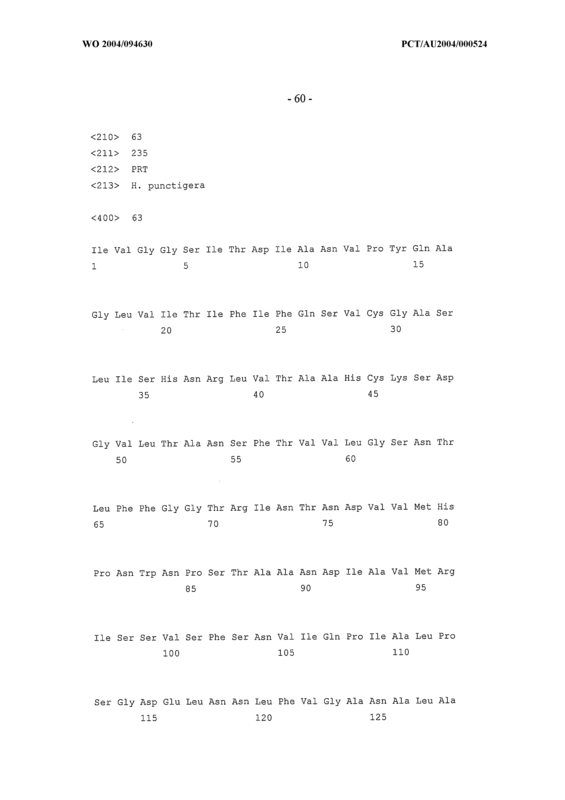 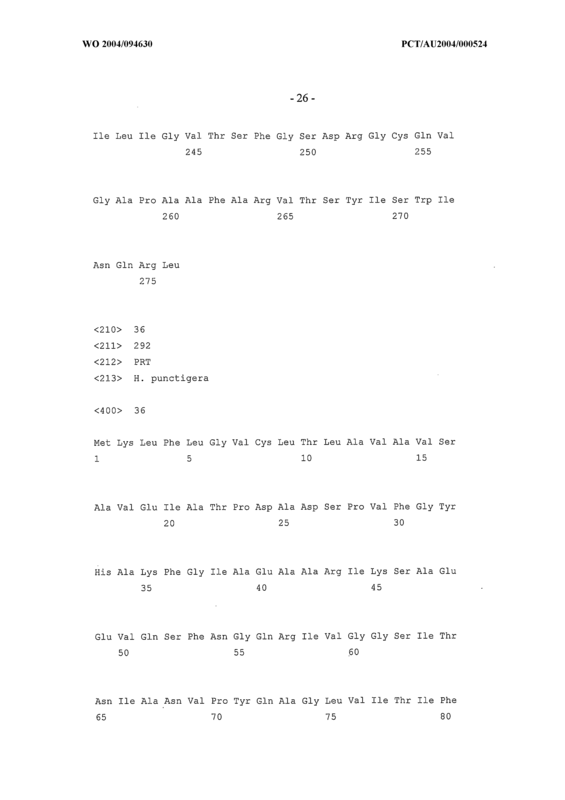 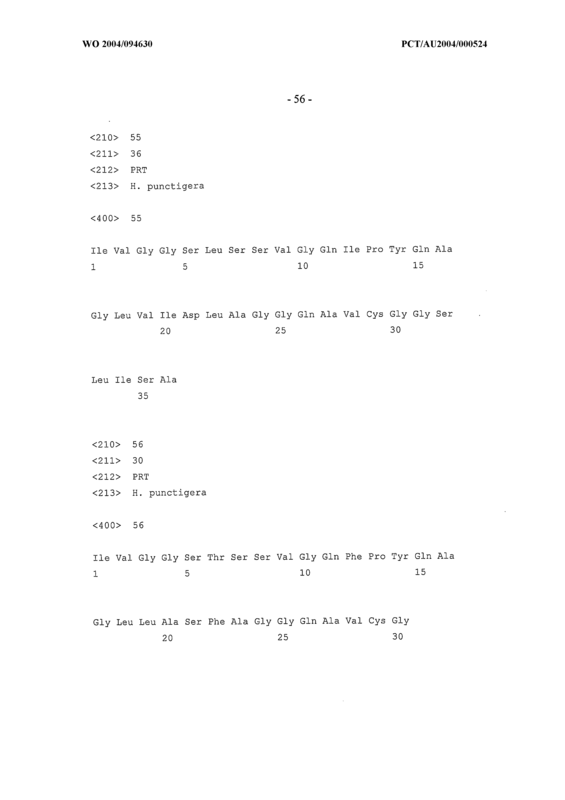 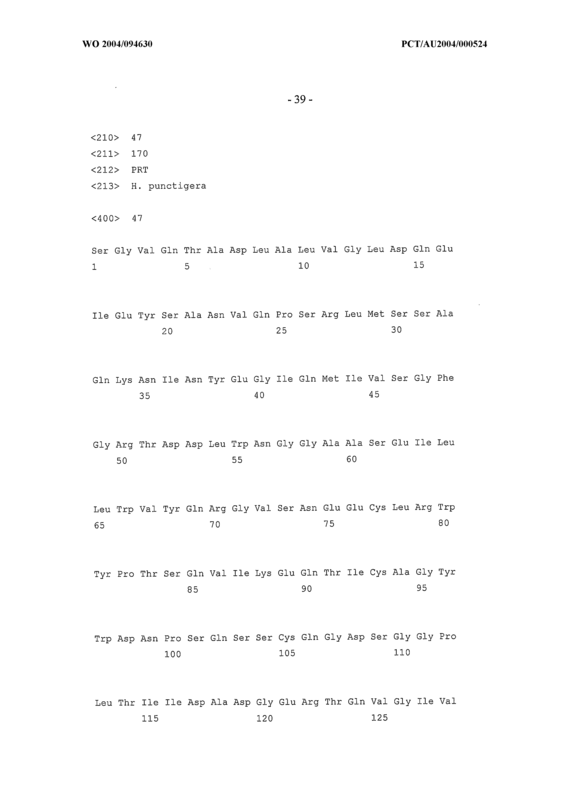 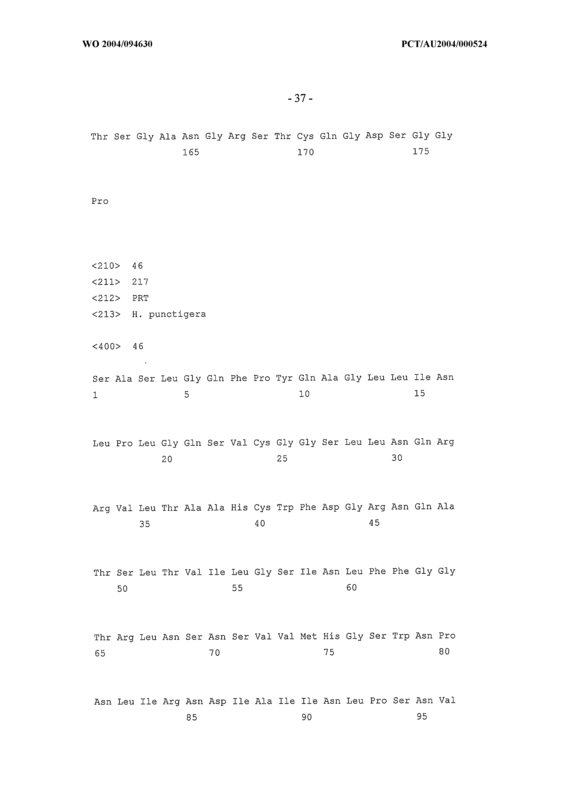 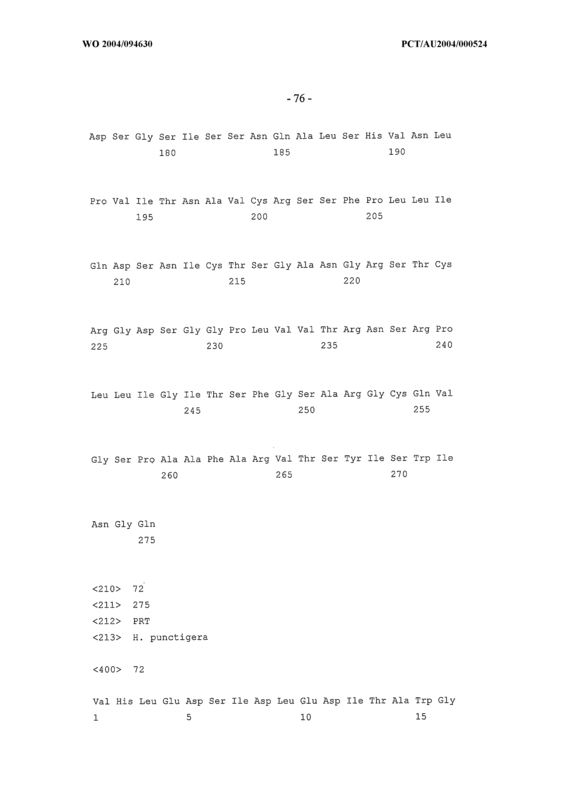 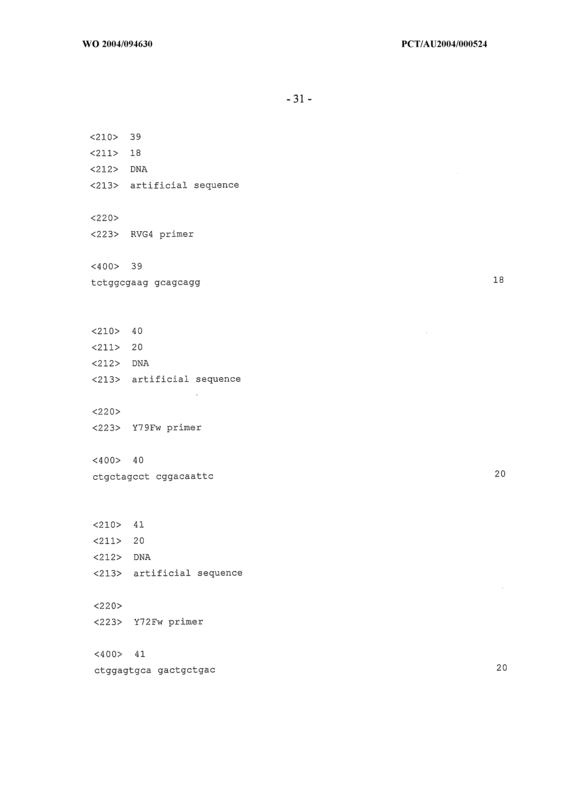 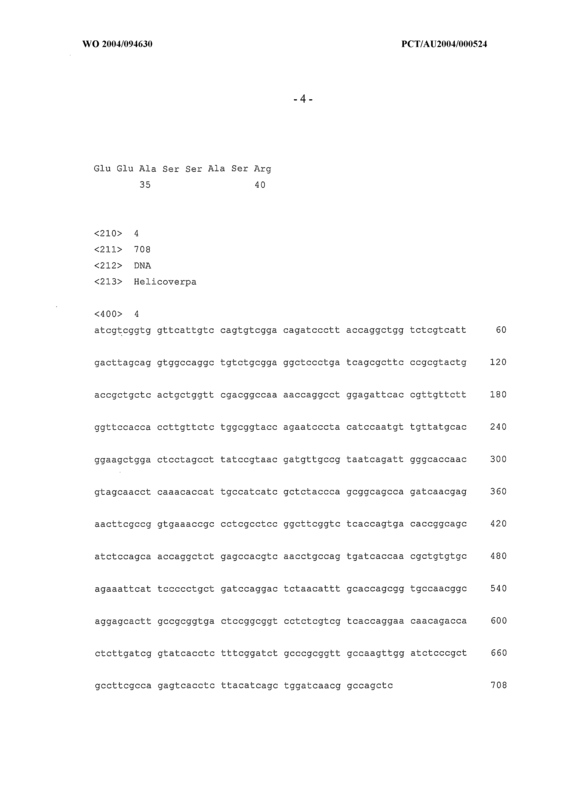 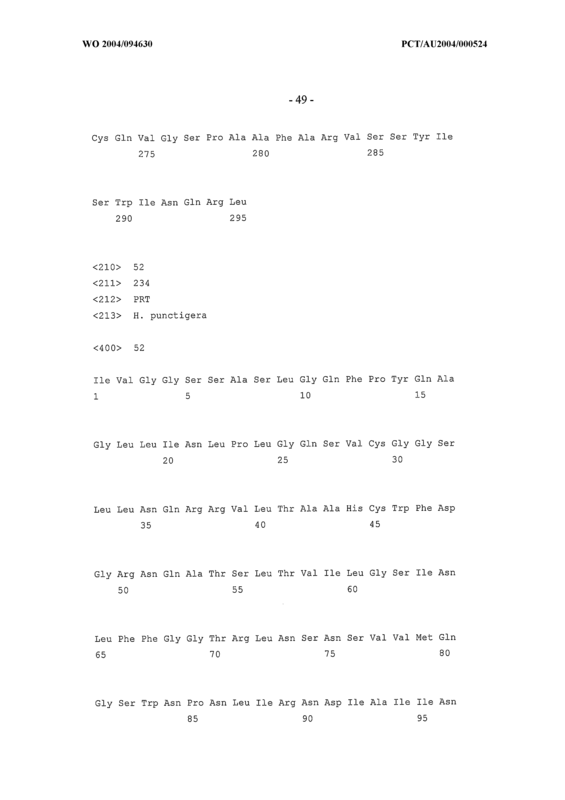 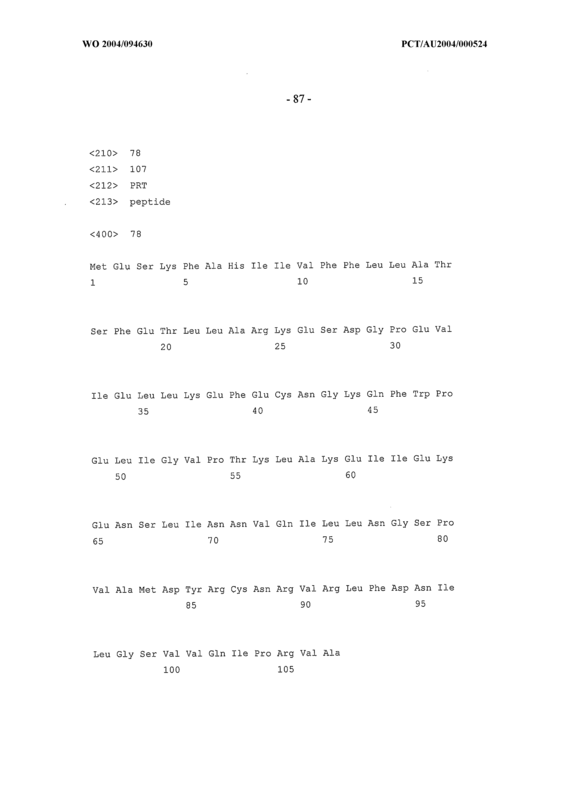 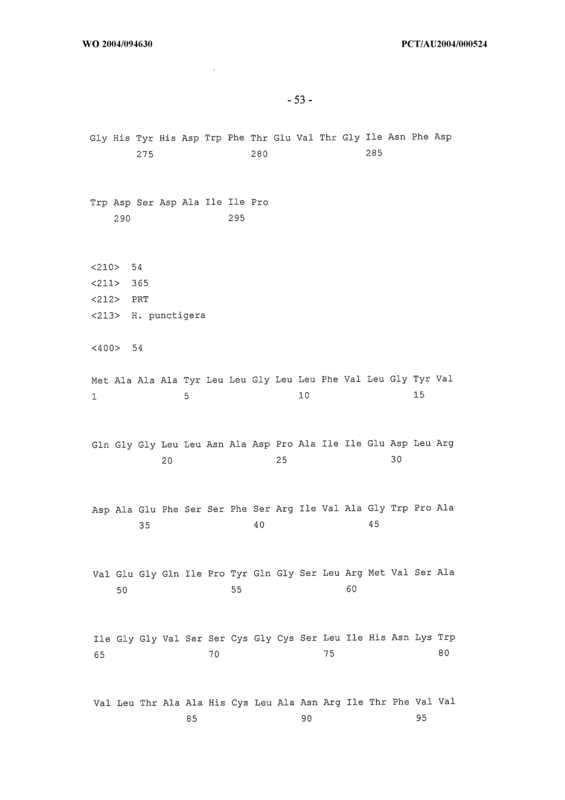 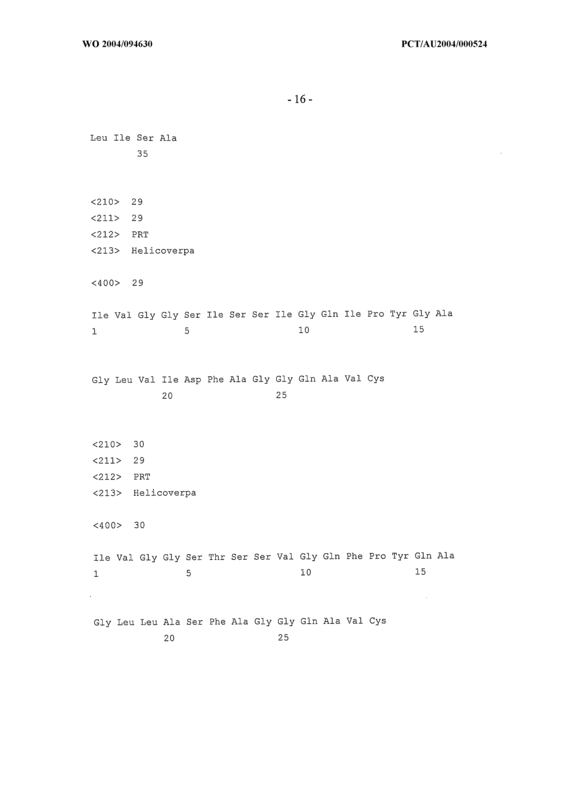 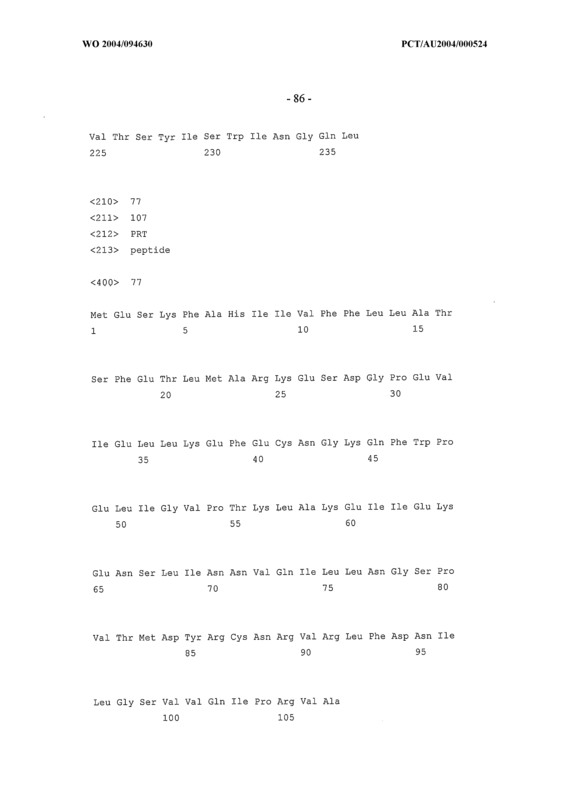 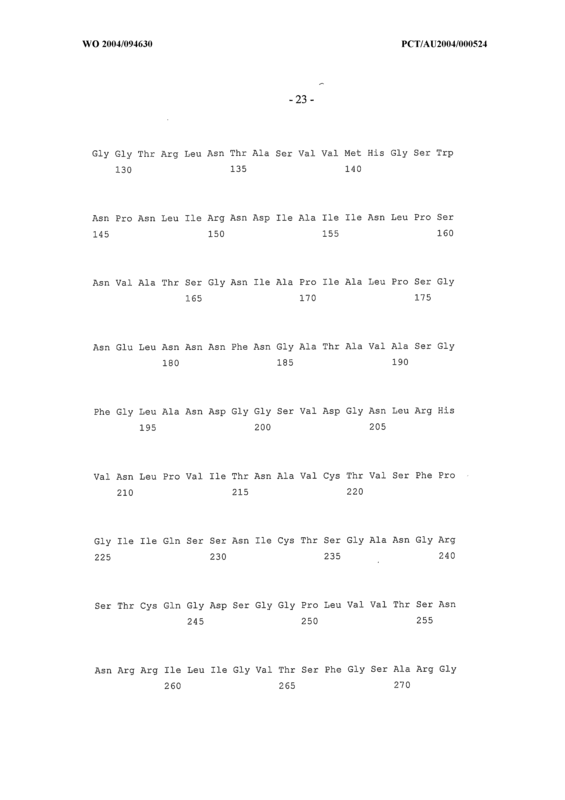 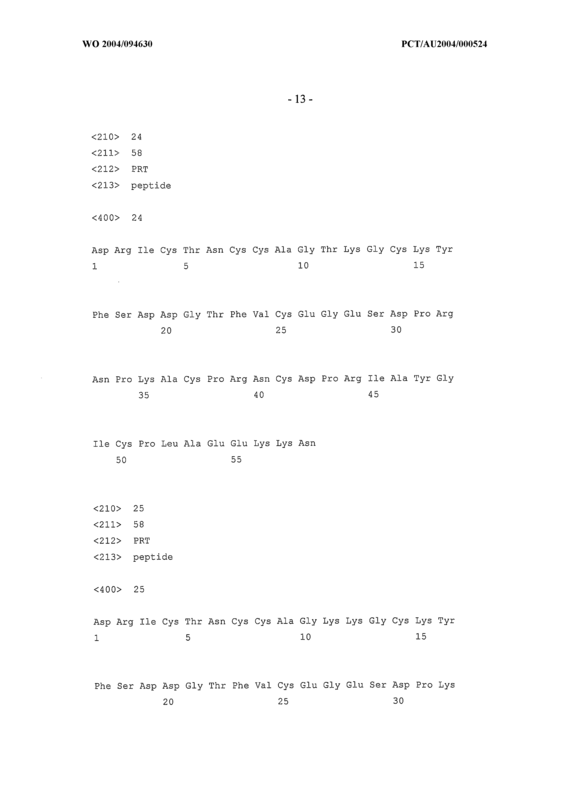 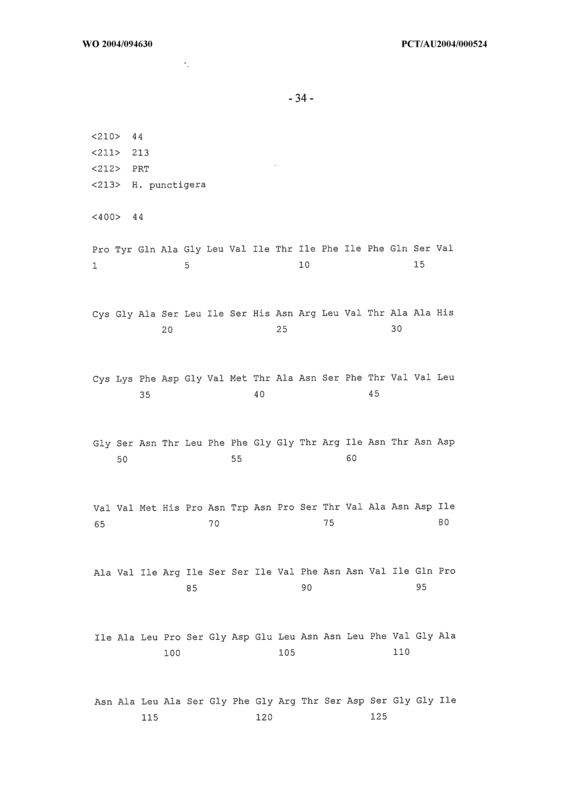 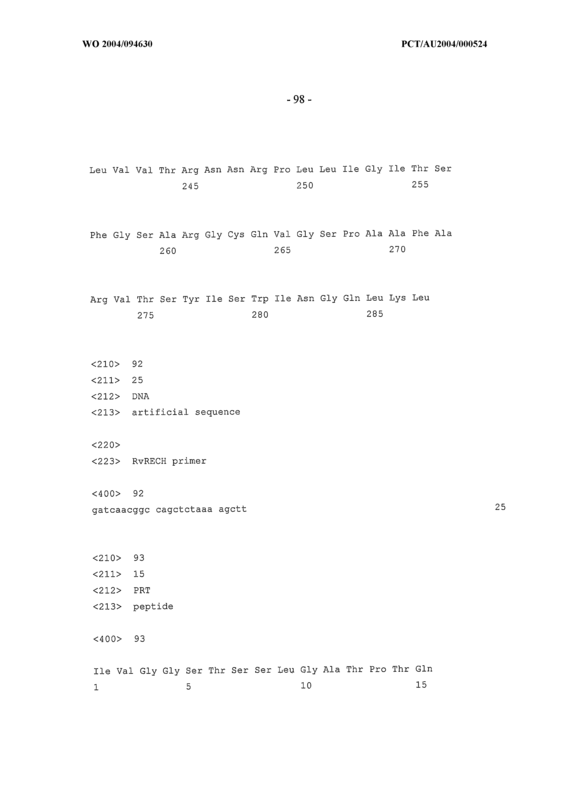 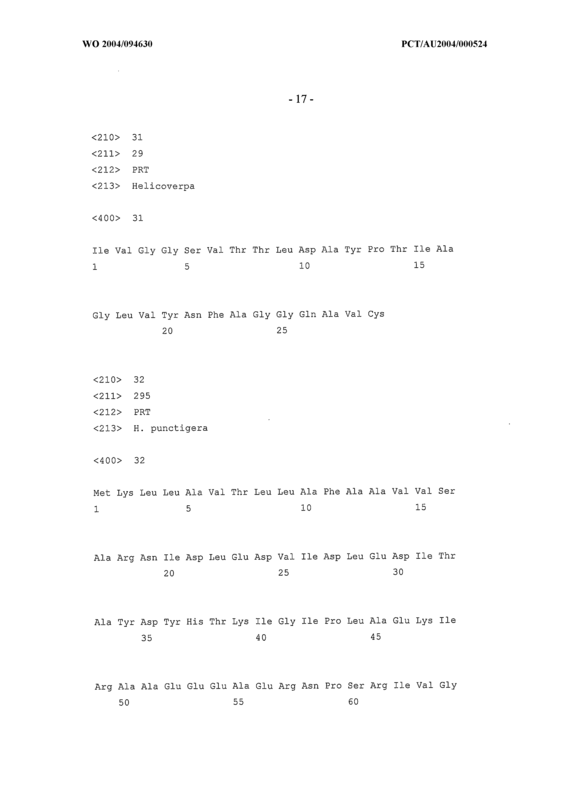 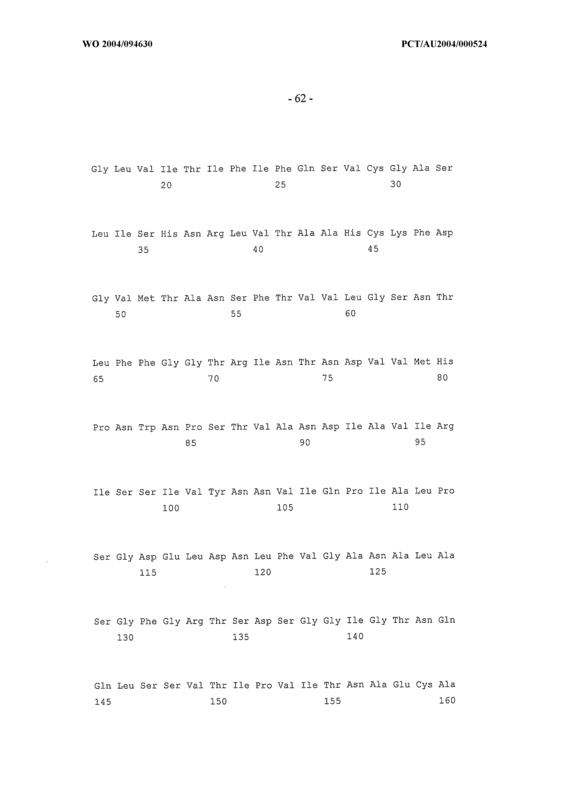 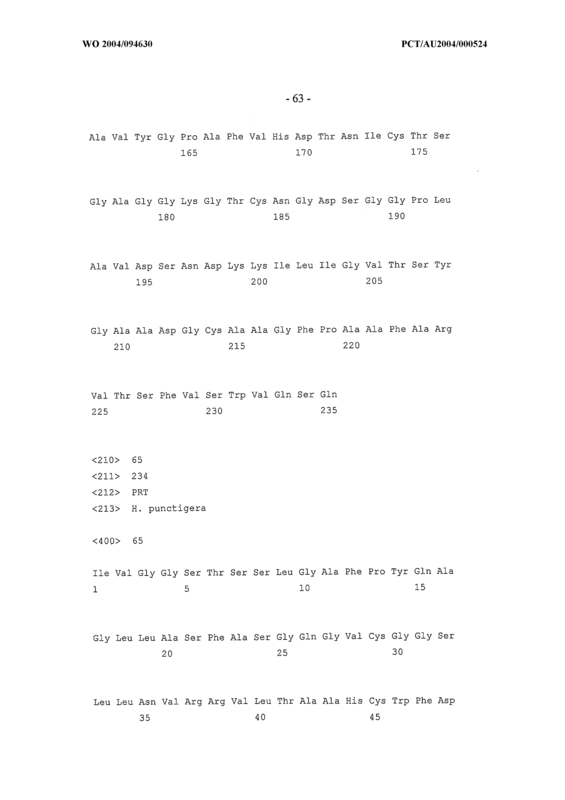 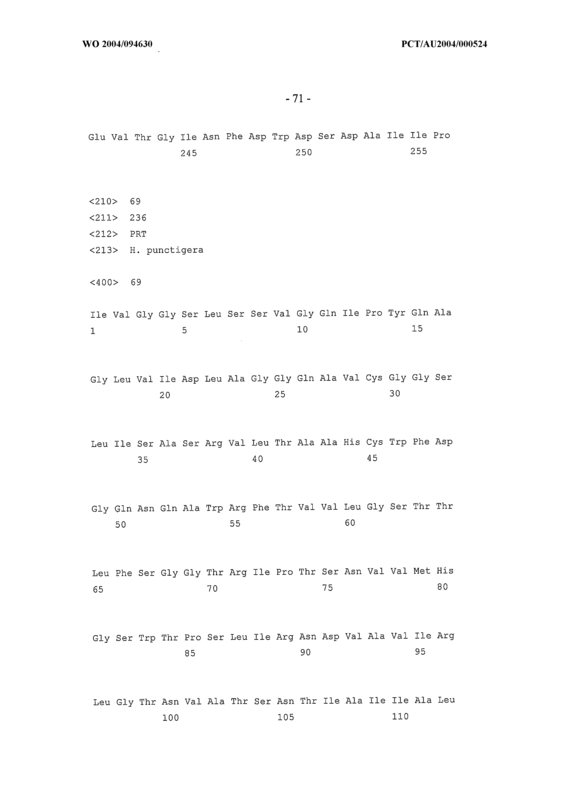 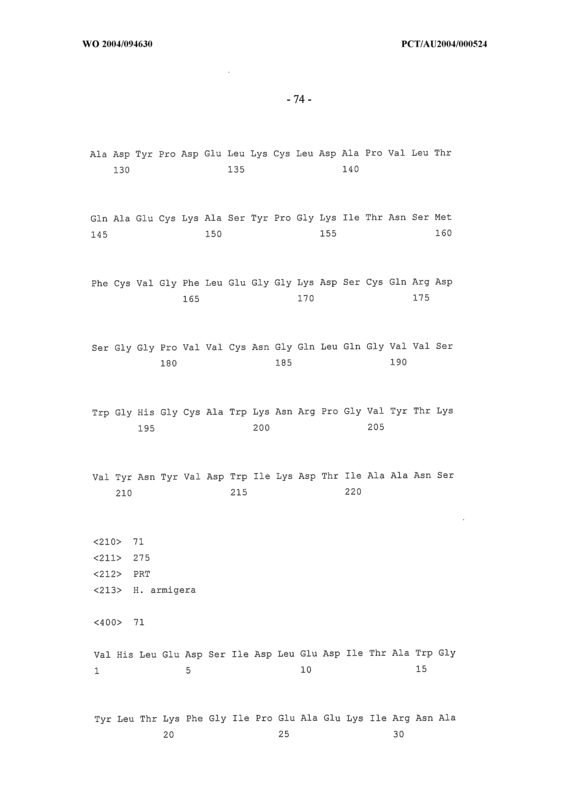 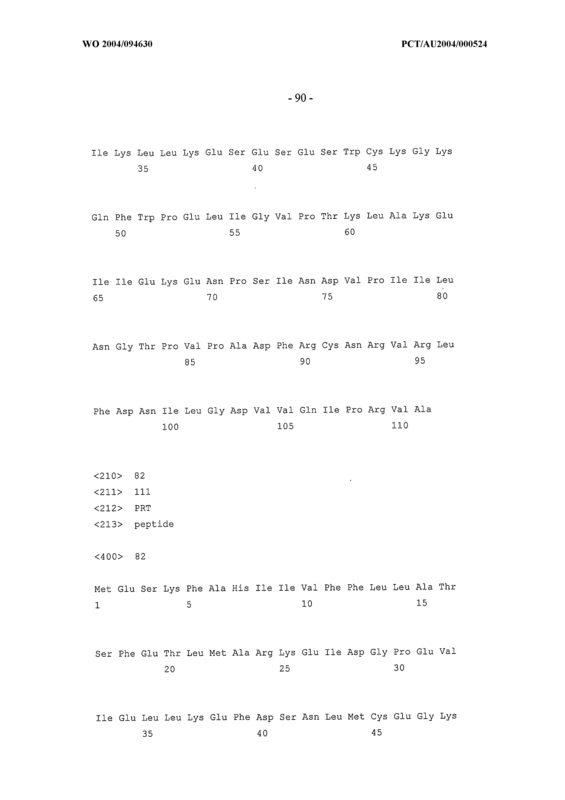 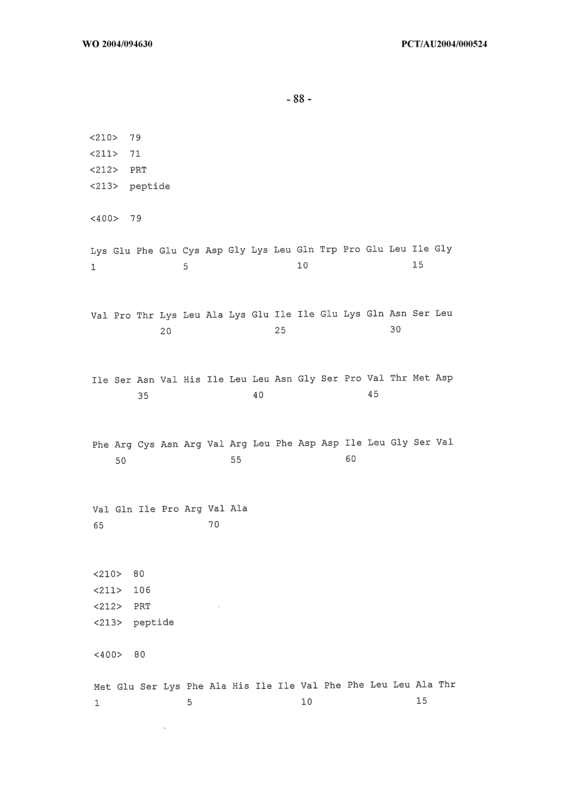 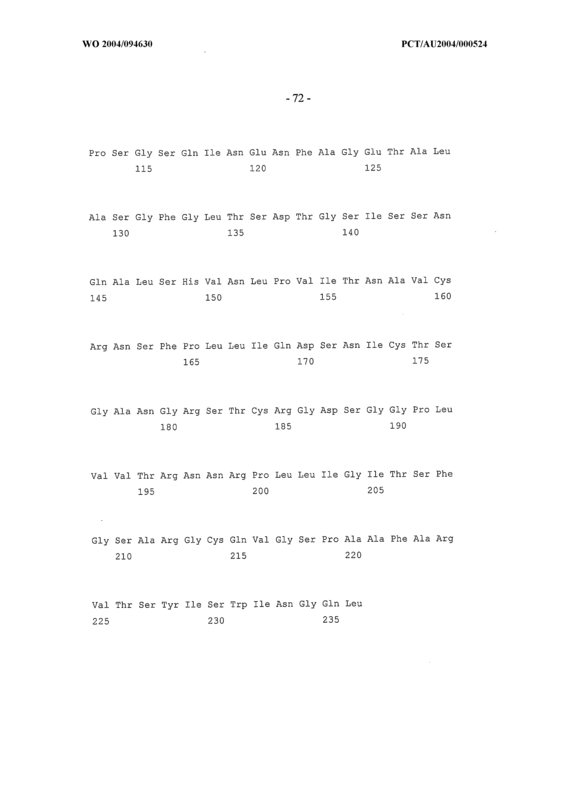 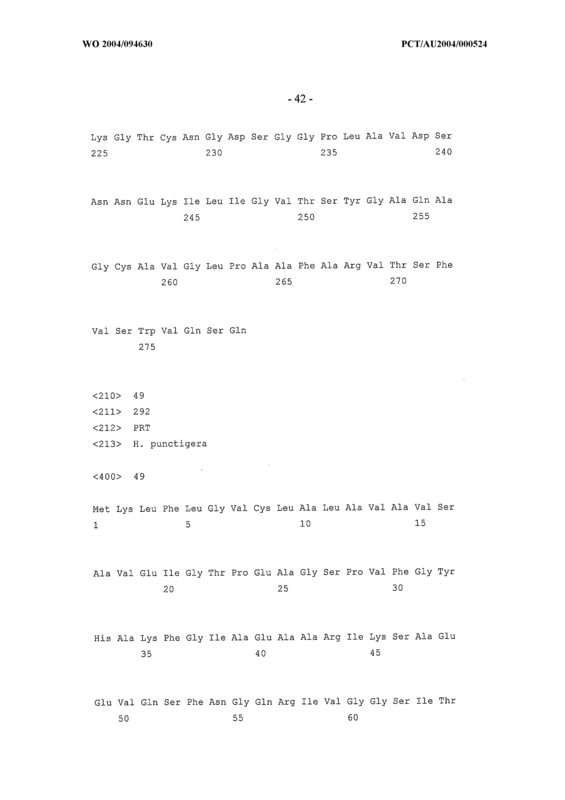 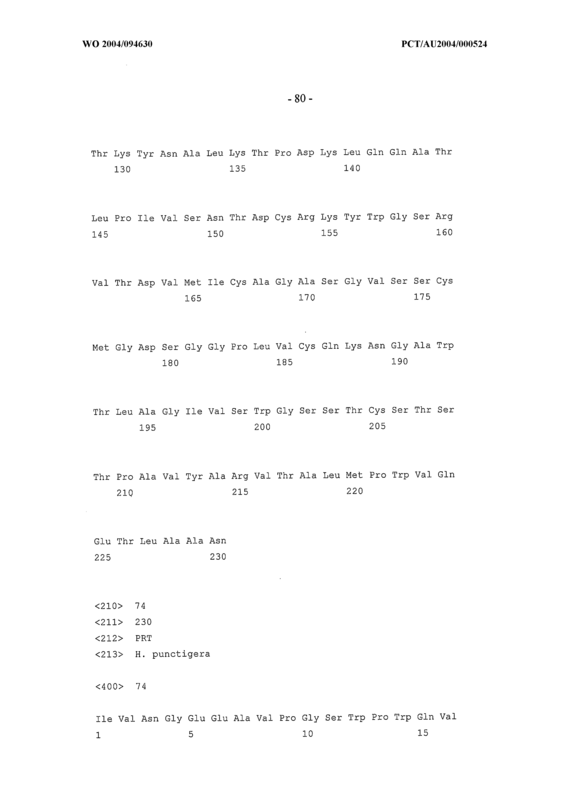 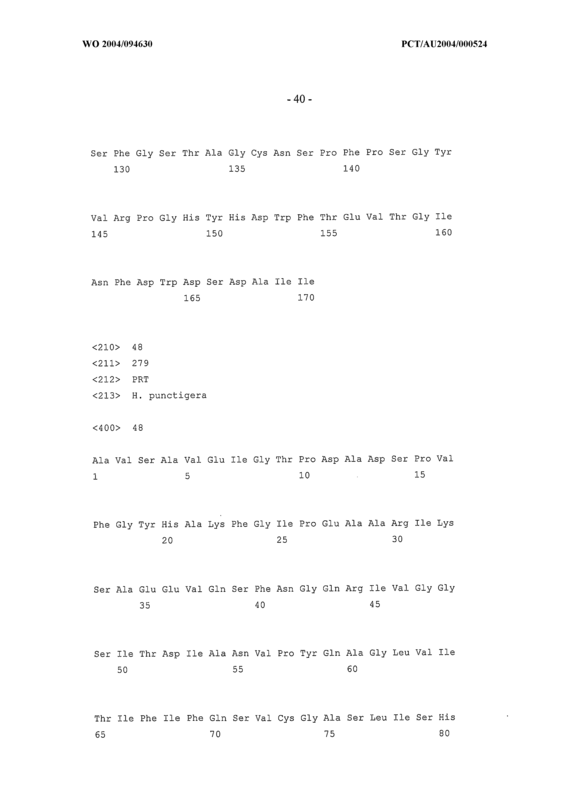 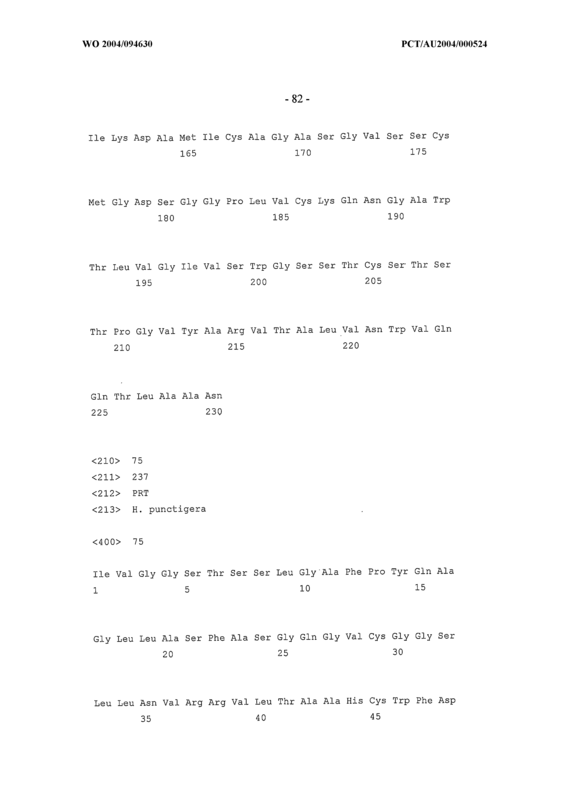 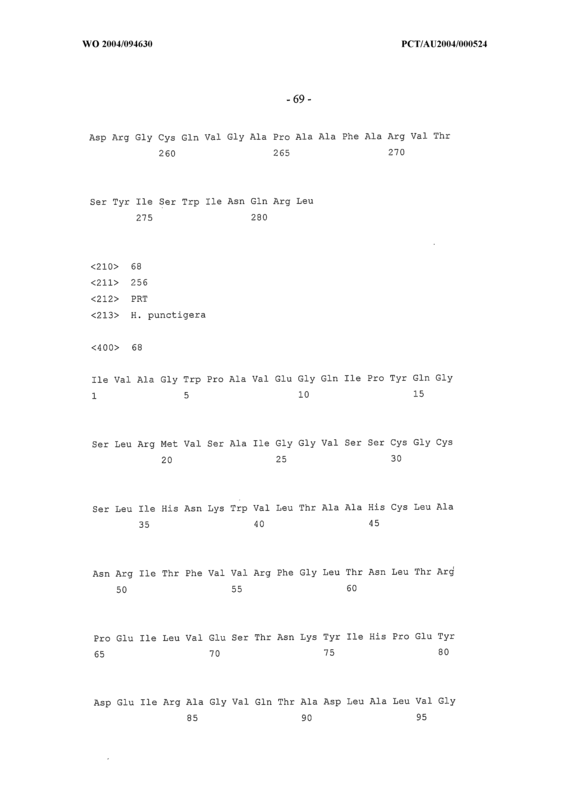 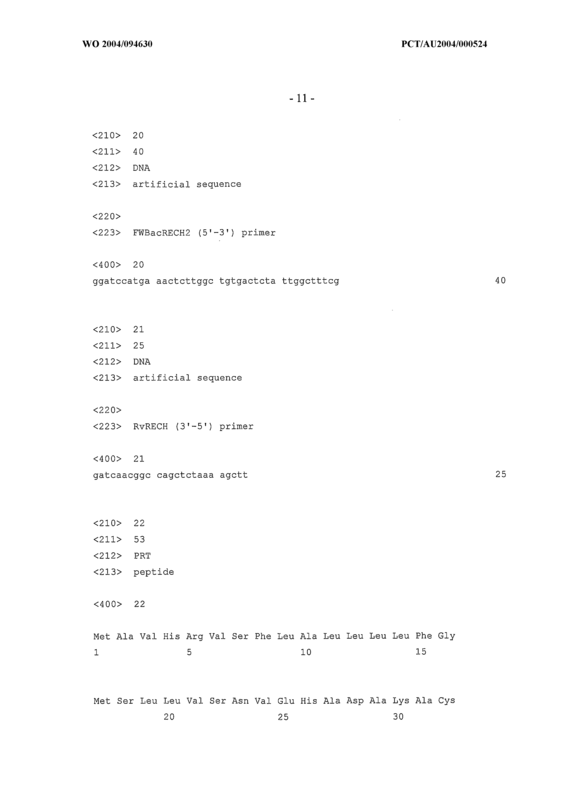 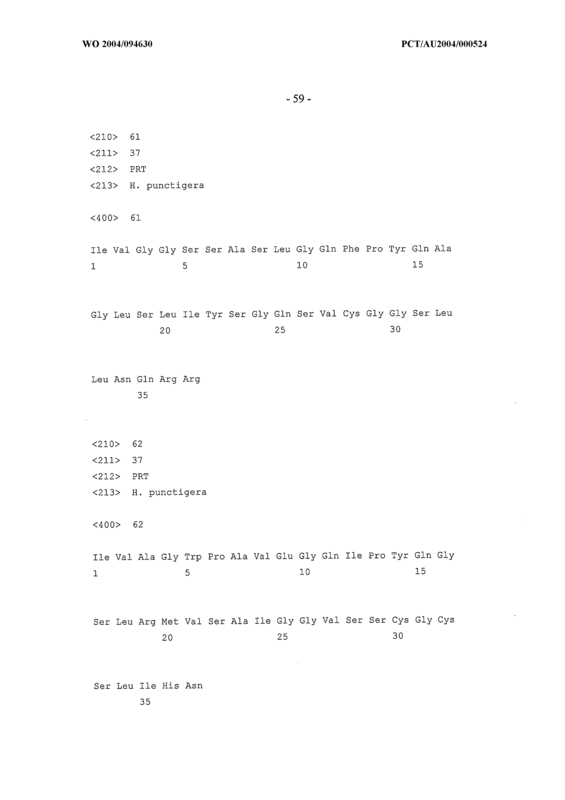 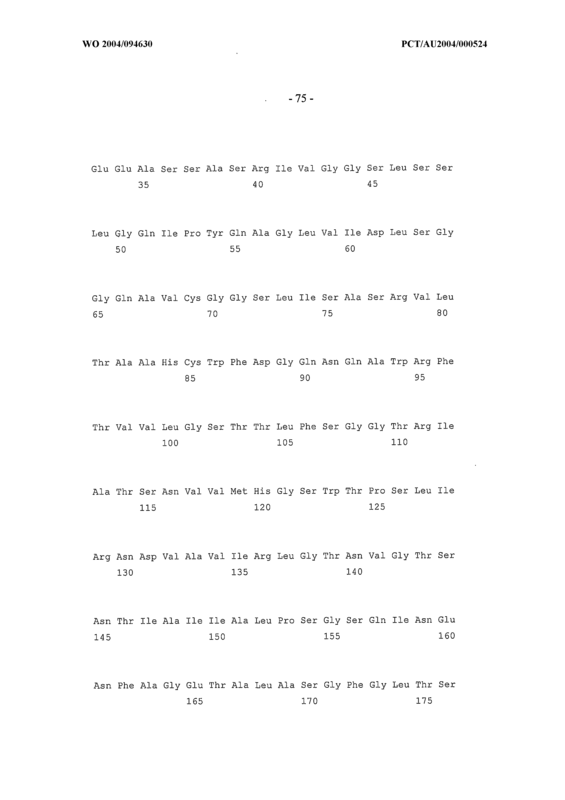 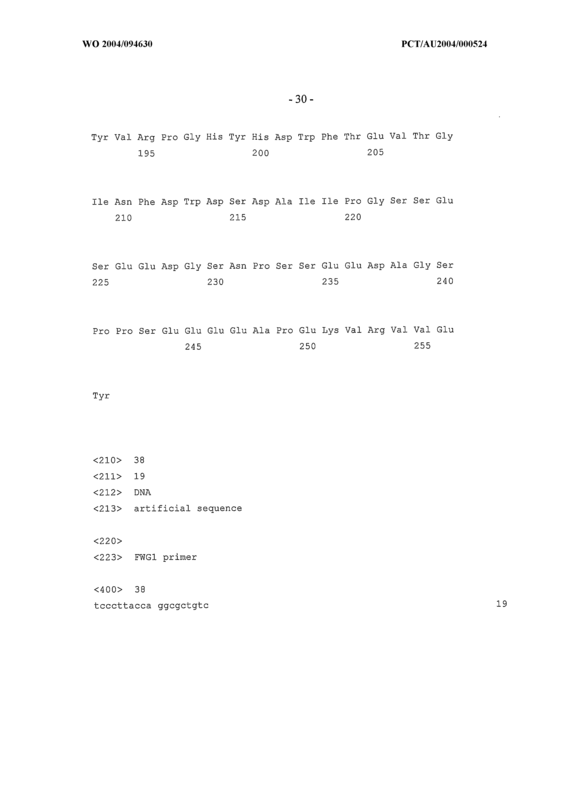 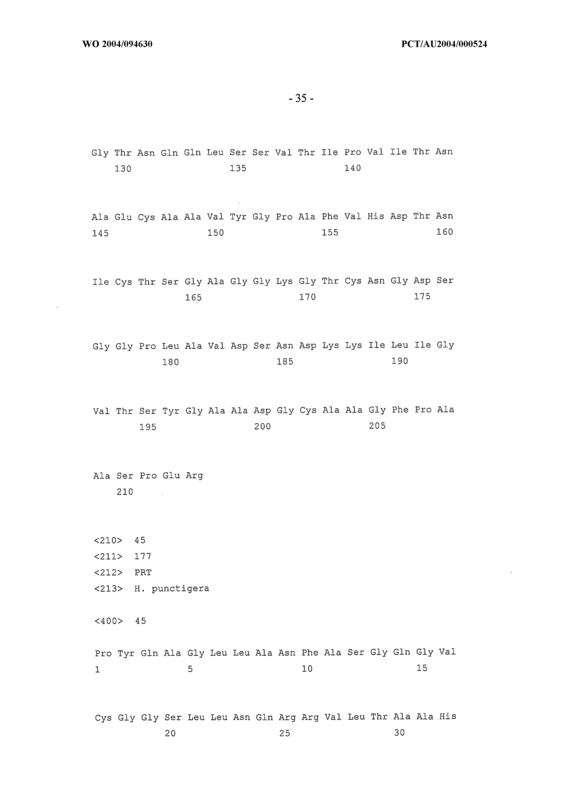 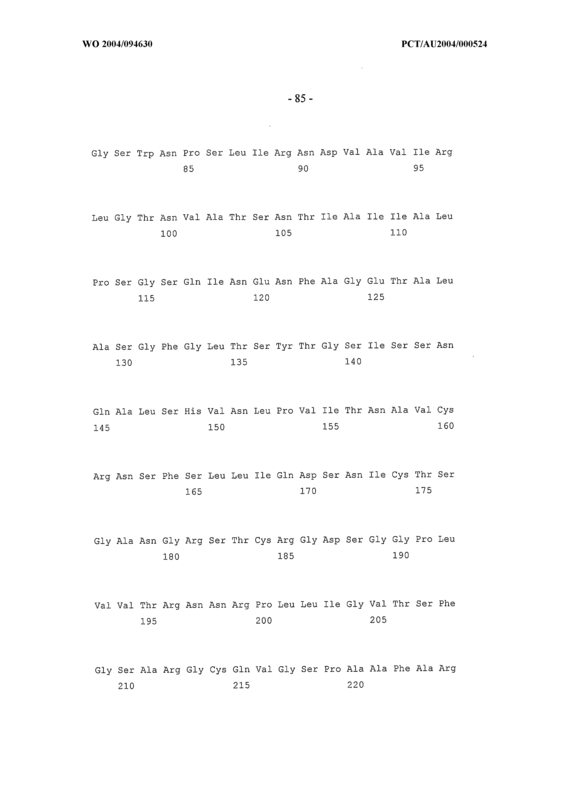 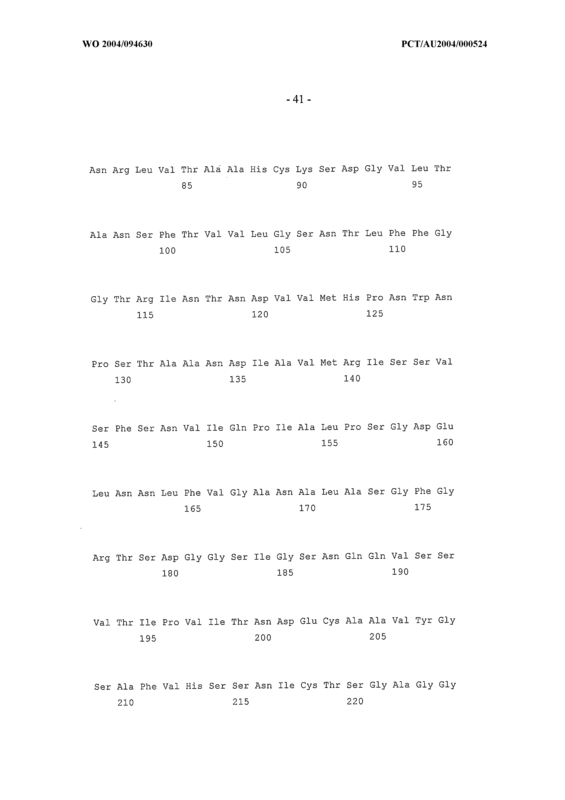 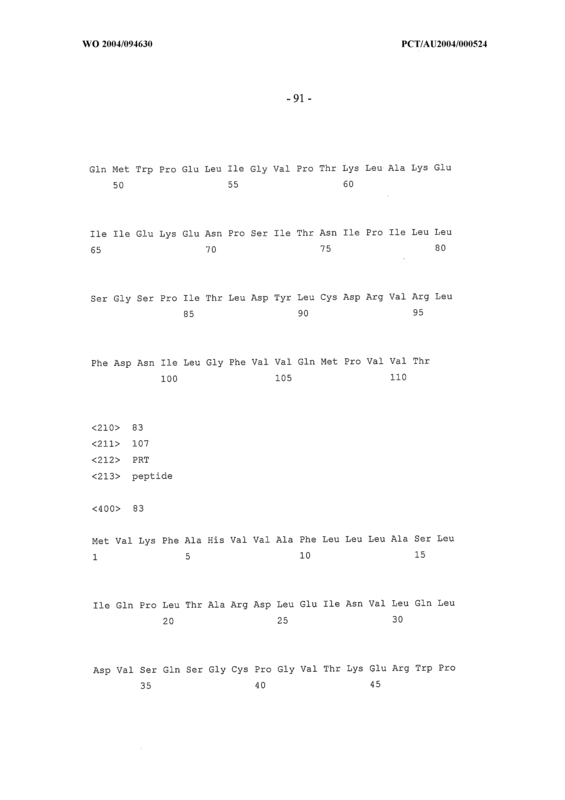 A composition comprising an antagonist of Claim 29 or 30. 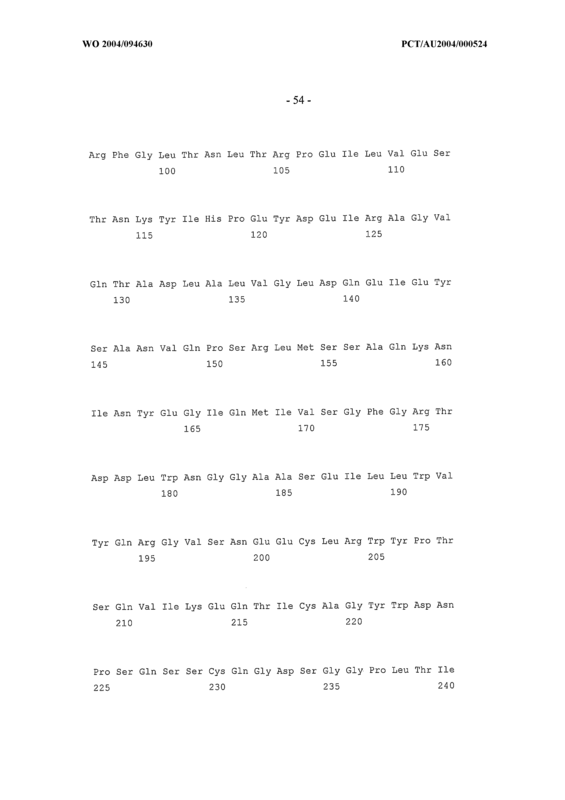 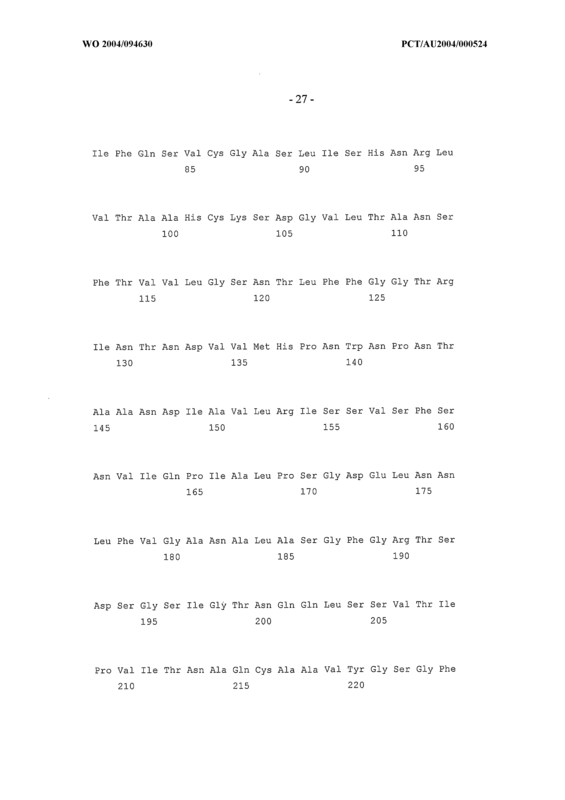 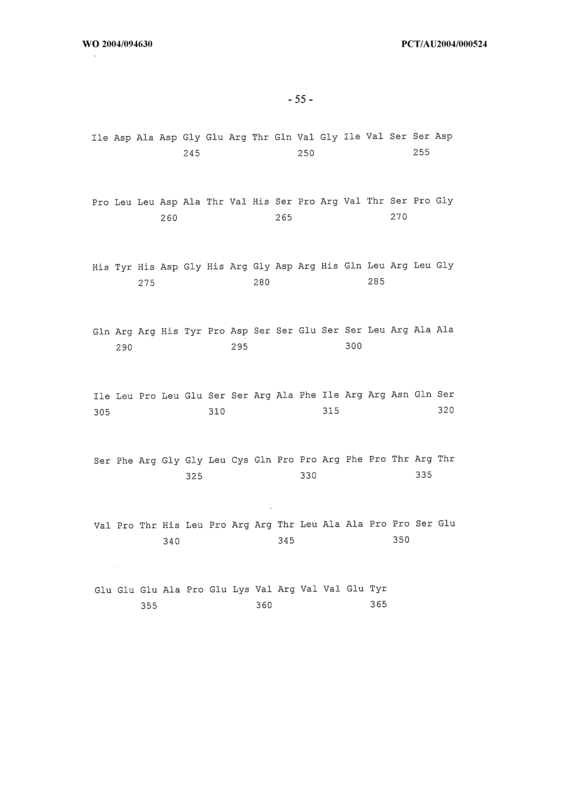 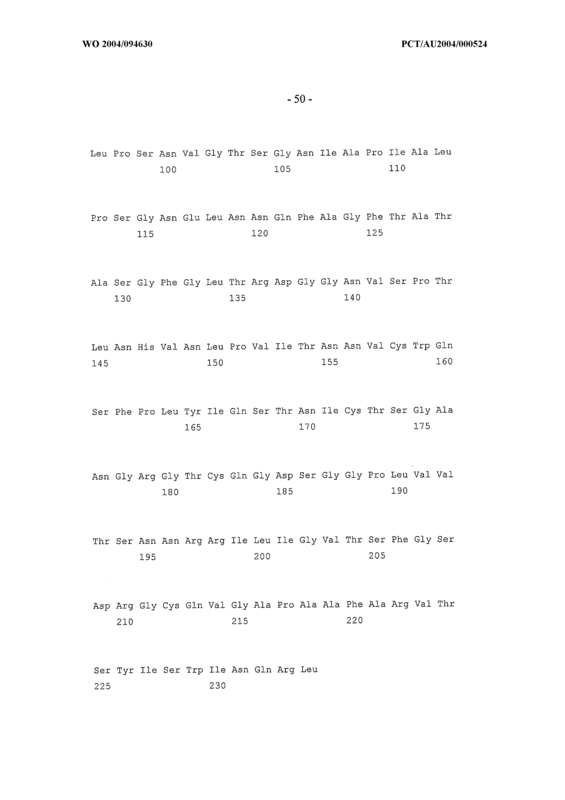 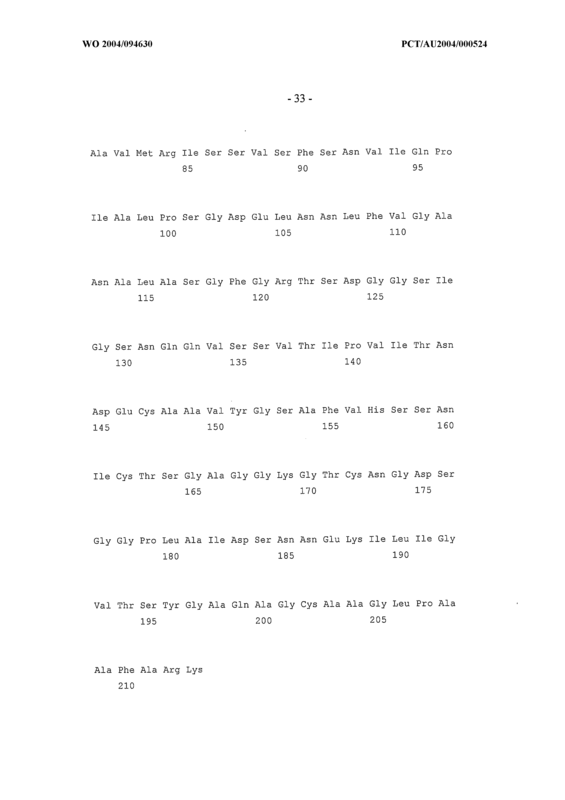 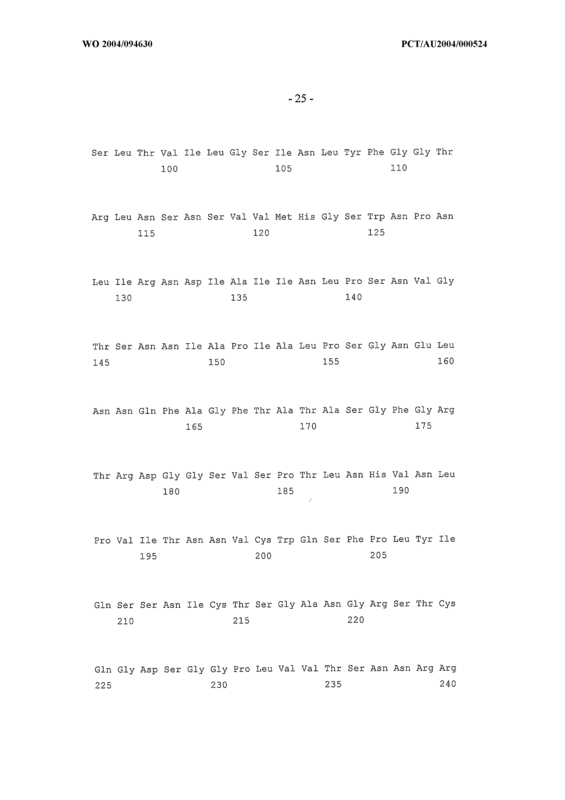 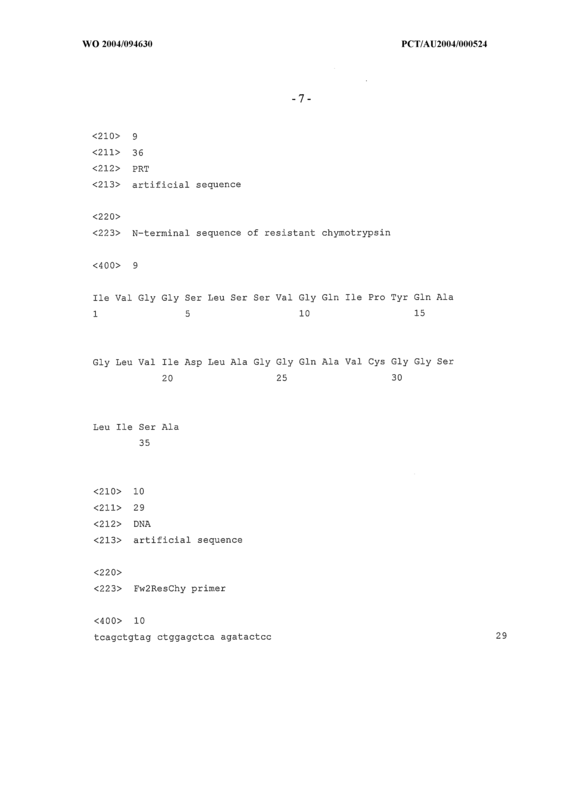 An anti-insect composition comprising an antagonist of Claim 29 or 30. 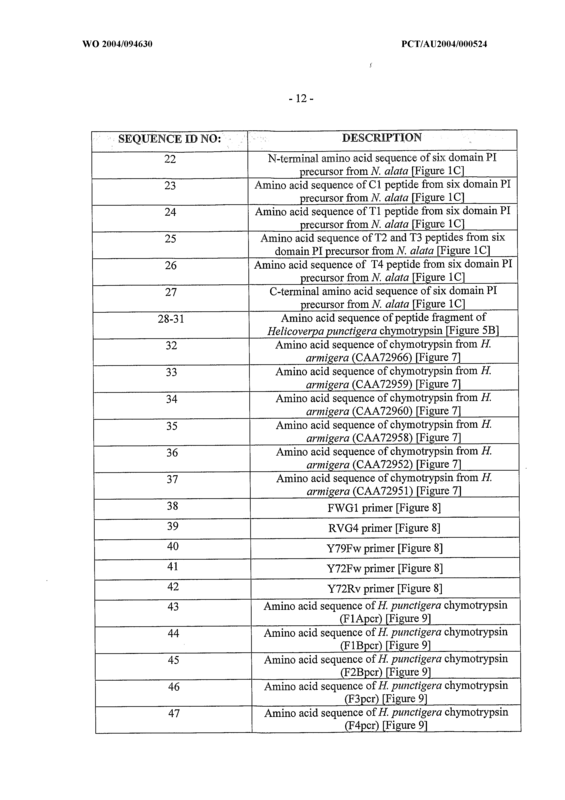 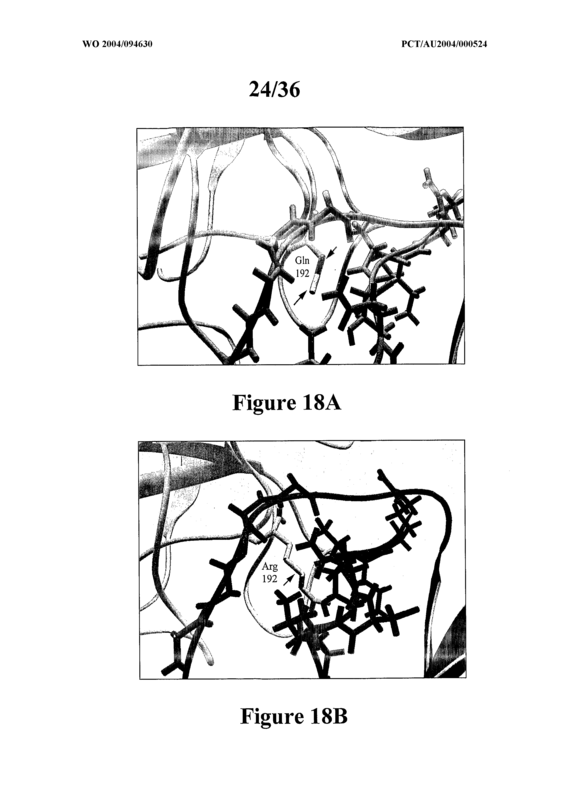 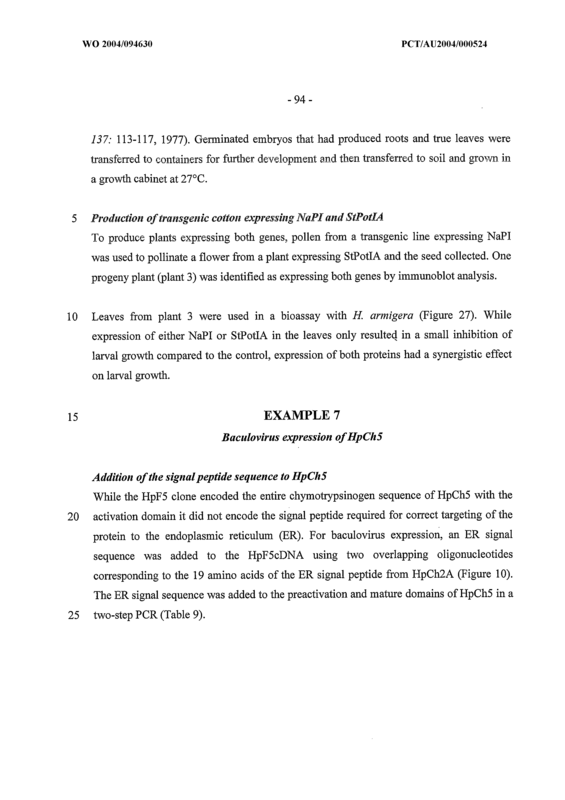 A genetically modified plant comprising cells capable of producing an antagonist of a chymotrypsin as defined in any one of Claims 19 to 26 or expression of a nucleic acid molecule as defined in any one of Claims 19 to 26. 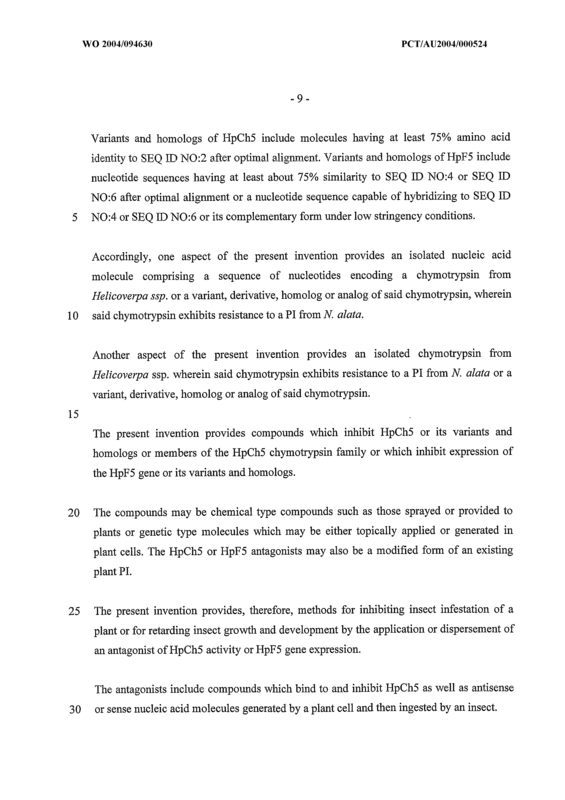 A genetically modified plant comprising cells capable of producing an antagonist of chymotrypsin-HpCh5 or HpF5 gene expression. 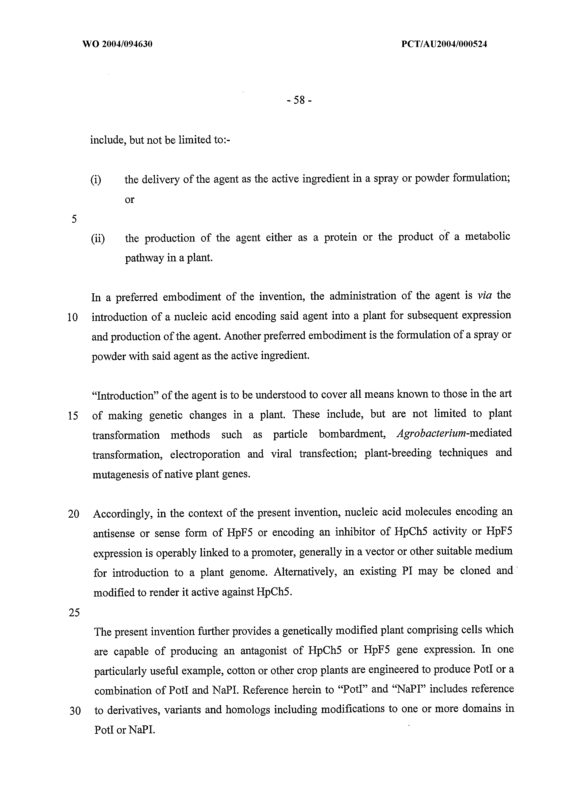 The genetically modified plant of Claim 34 or 35 wherein the plant is a monocotyledonous plant. 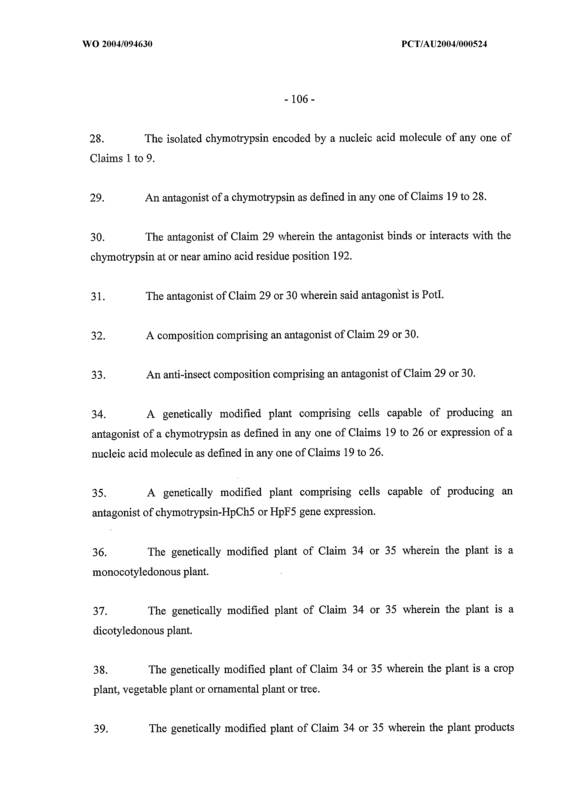 The genetically modified plant of Claim 34 or 35 wherein the plant is a dicotyledonous plant. 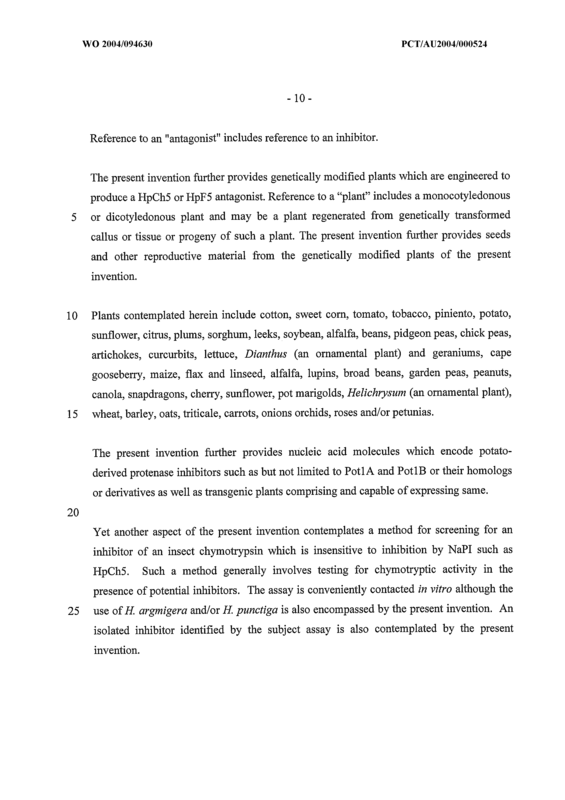 The genetically modified plant of Claim 34 or 35 wherein the plant is a crop plant, vegetable plant or ornamental plant or tree. 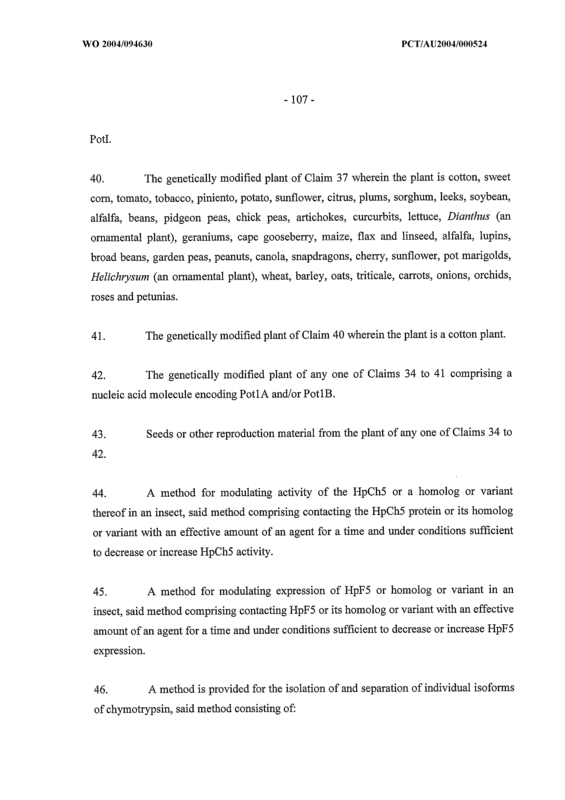 The genetically modified plant of Claim 34 or 35 wherein the plant products Potl. 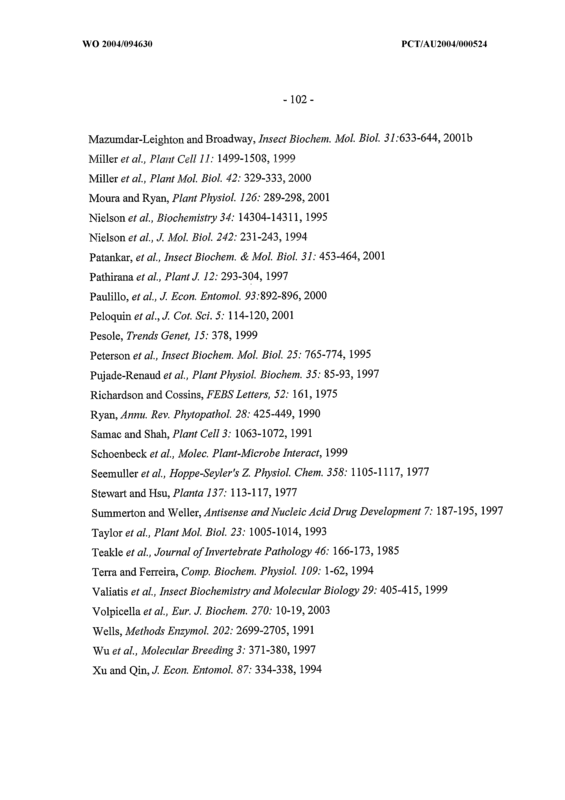 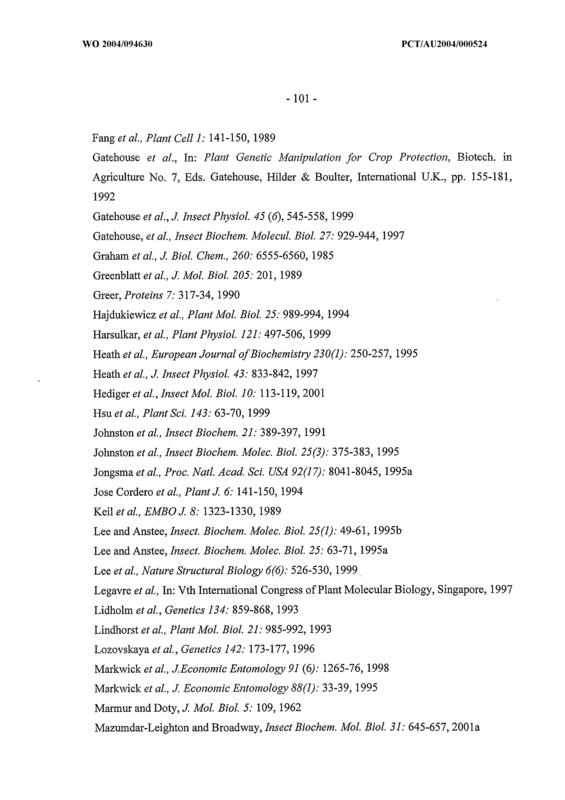 The genetically modified plant of Claim 37 wherein the plant is cotton, sweet com, tomato, tobacco, piniento, potato, sunflower, citrus, plums, sorghum, leeks, soybean, alfalfa, beans, pidgeon peas, chick peas, artichokes, curcurbits, lettuce, Dianthus (an ornamental plant), geraniums, cape gooseberry, maize, flax and linseed, alfalfa, lupins, broad beans, garden peas, peanuts, canola, snapdragons, cherry, sunflower, pot marigolds, Helichrysum (an ornamental plant), wheat, barley, oats, triticale, carrots, onions, orchids, roses and petunias. 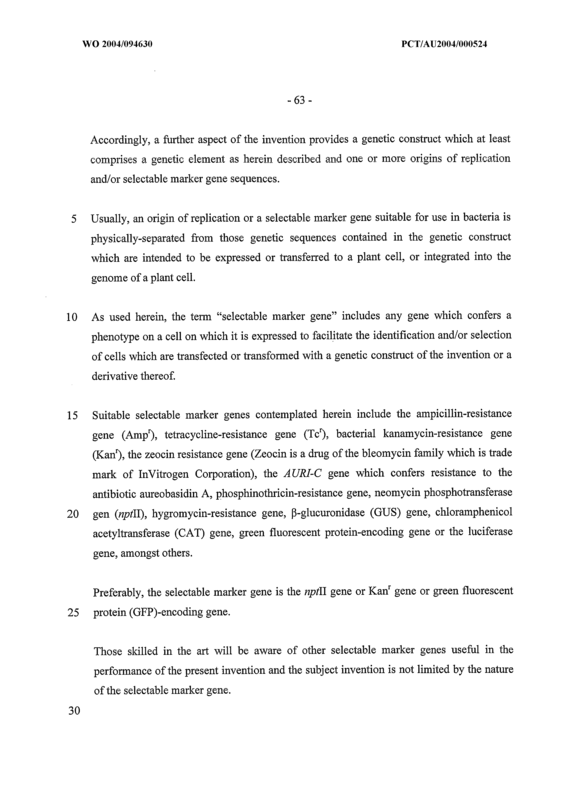 The genetically modified plant of Claim 40 wherein the plant is a cotton plant. 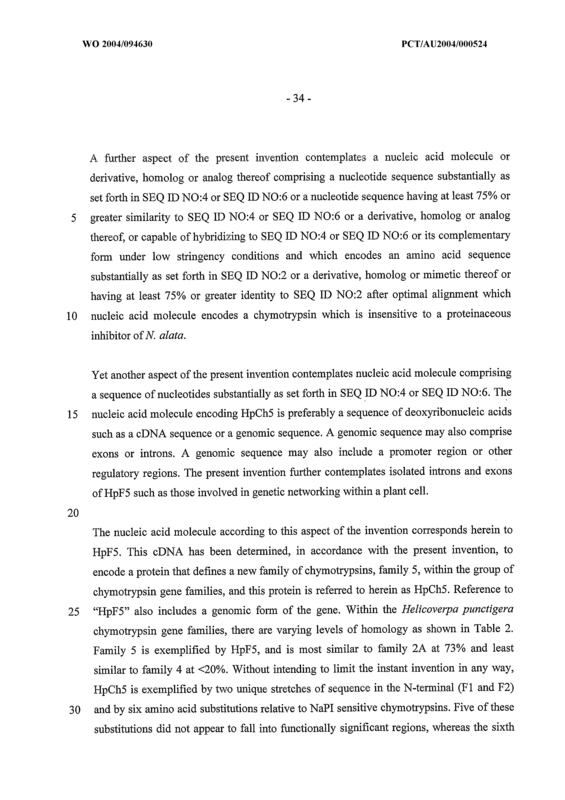 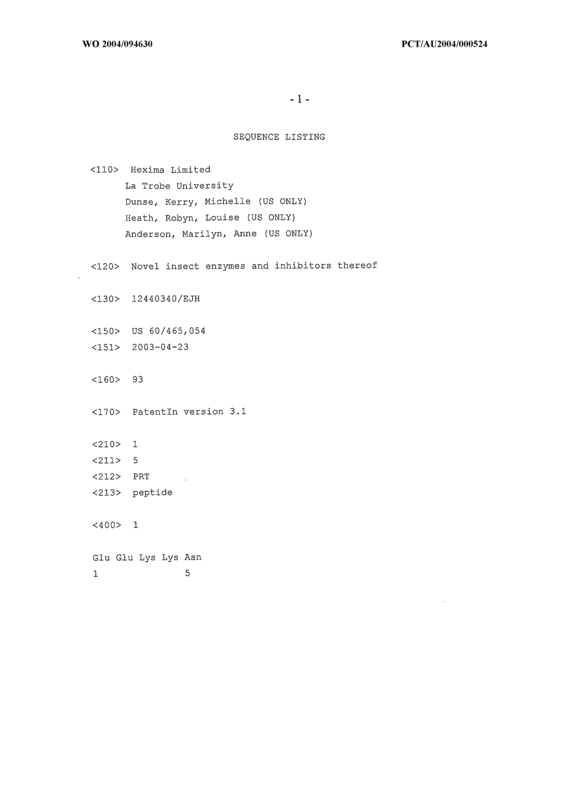 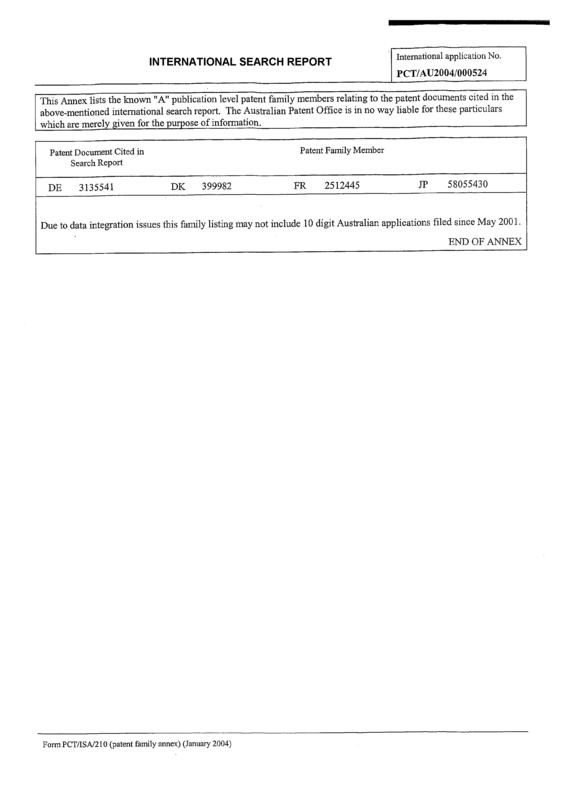 The genetically modified plant of any one of Claims 34 to 41 comprising a nucleic acid molecule encoding Potl A and/or PotlB. 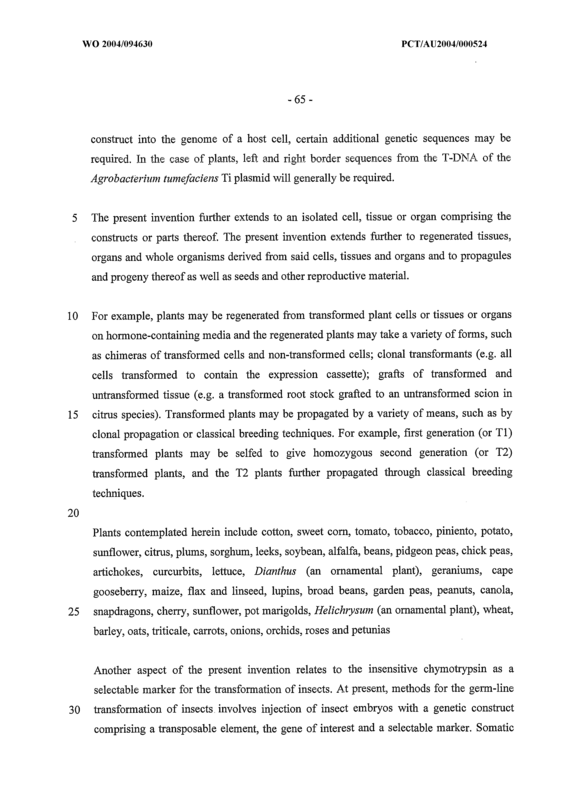 Seeds or other reproduction material from the plant of any one of Claims 34 to 42. 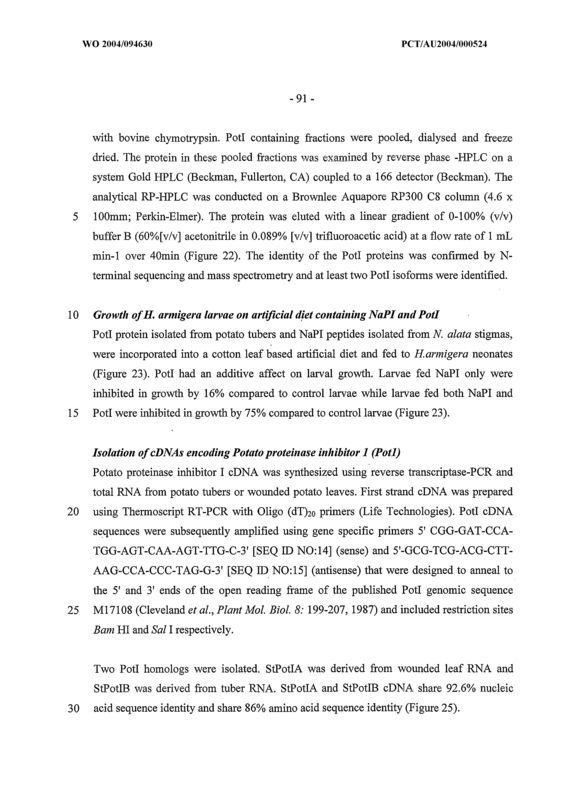 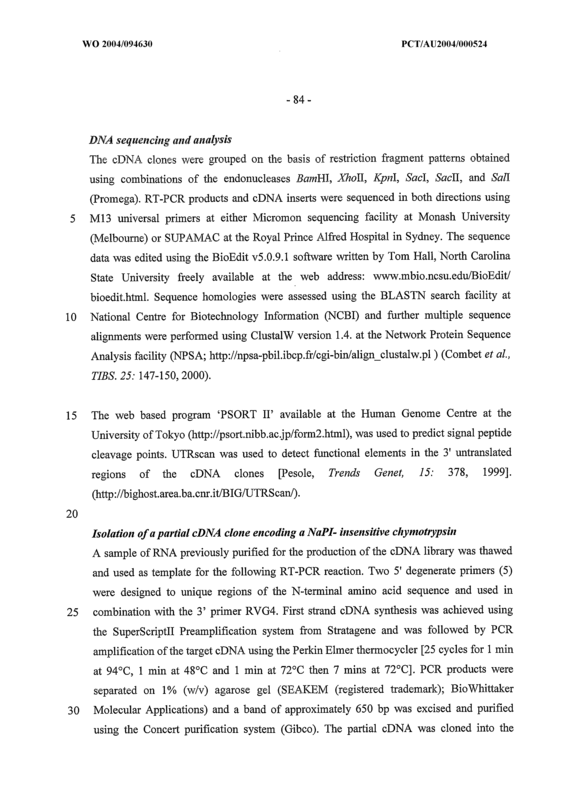 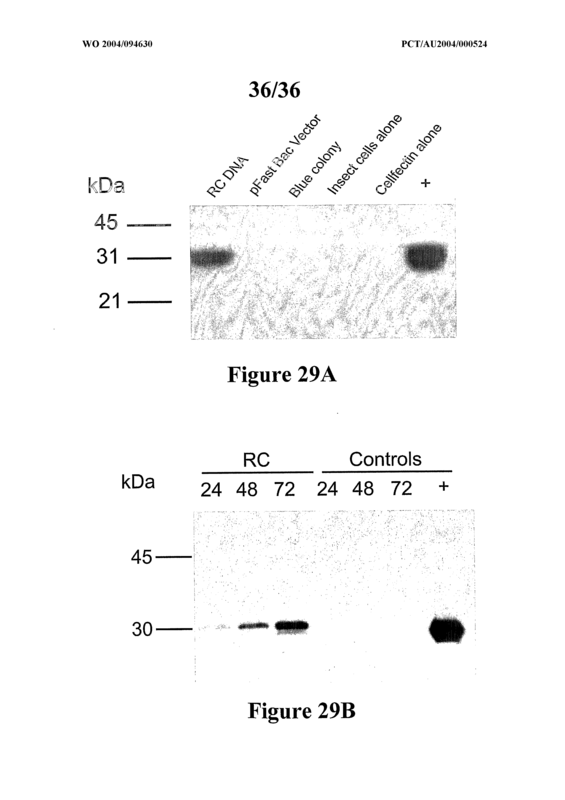 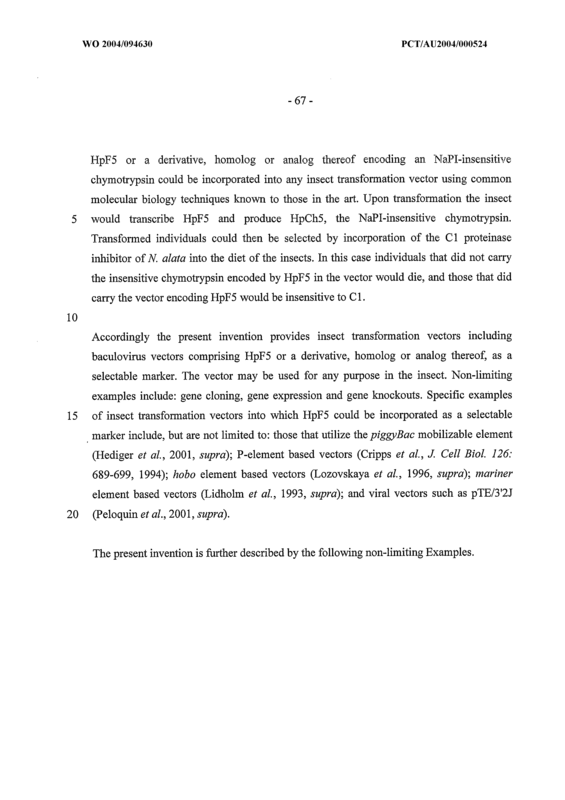 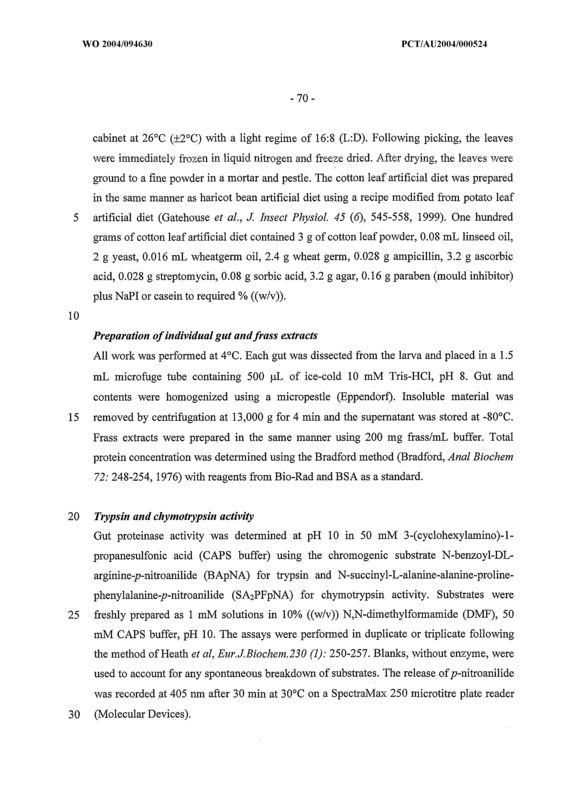 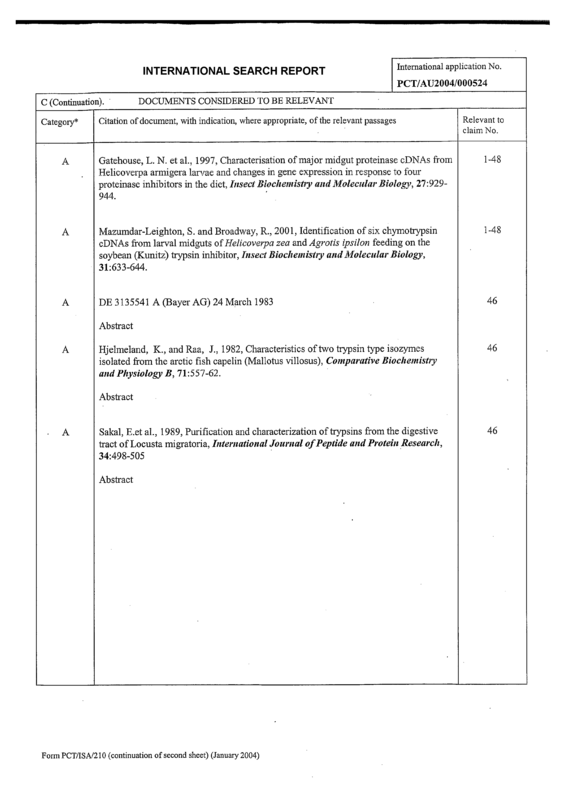 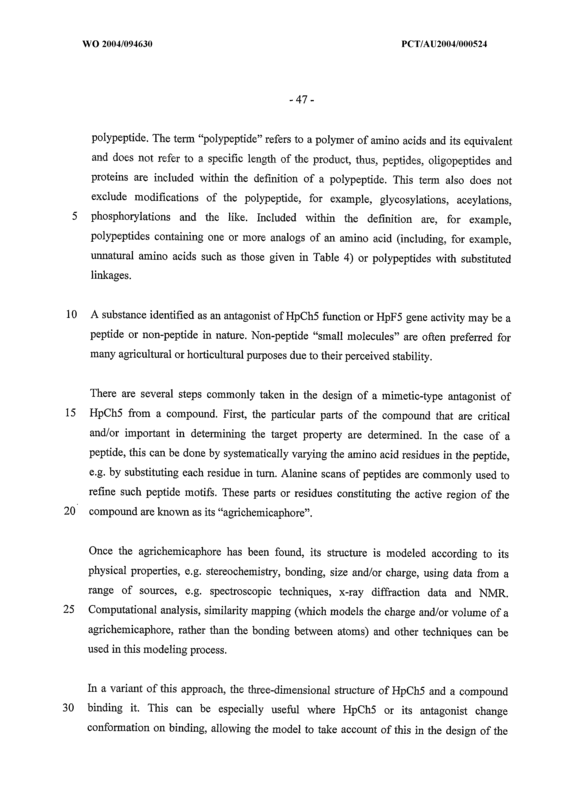 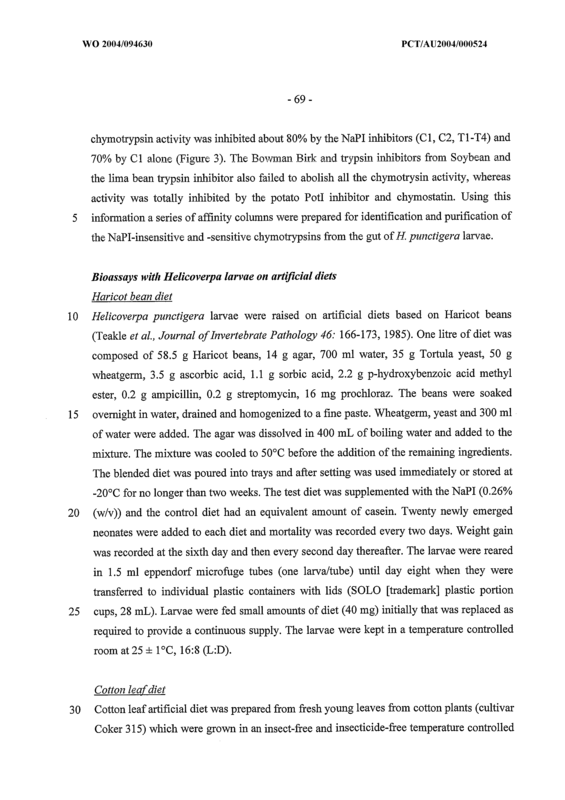 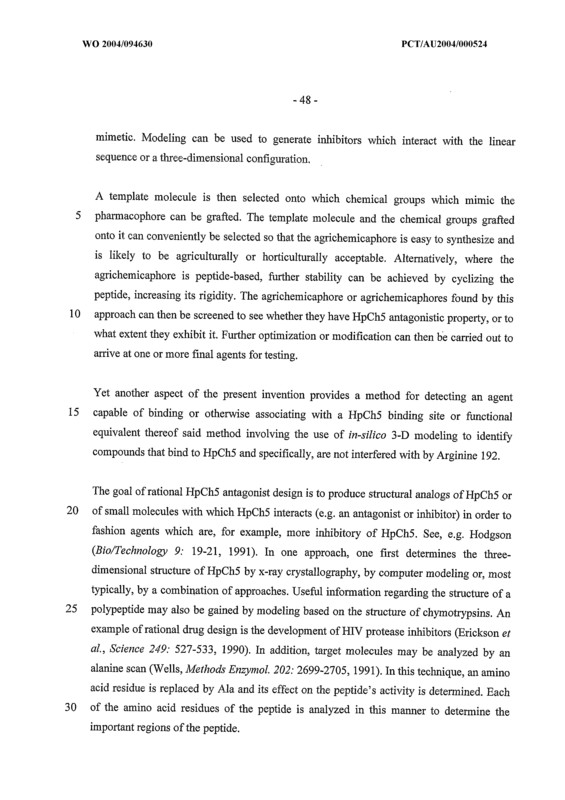 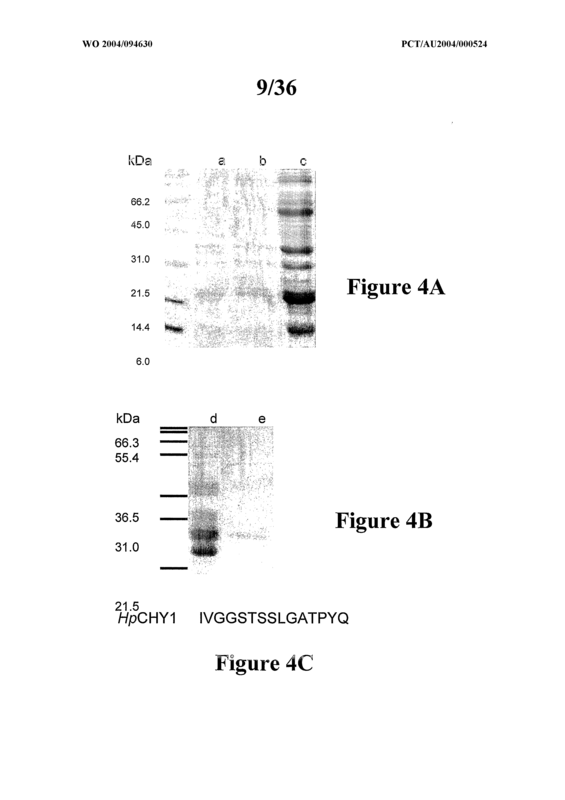 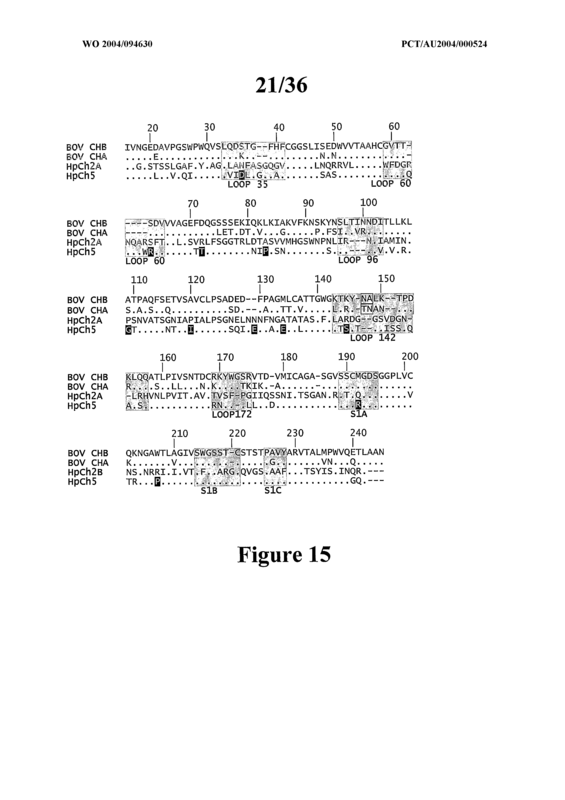 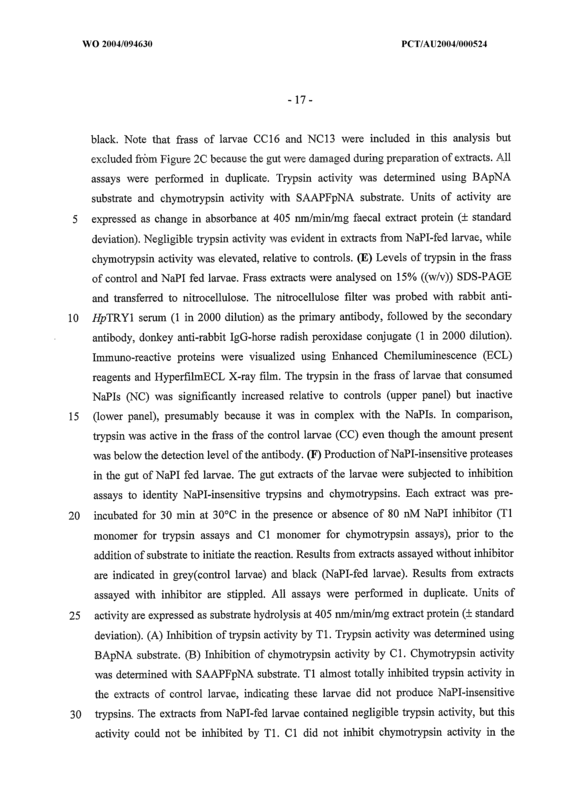 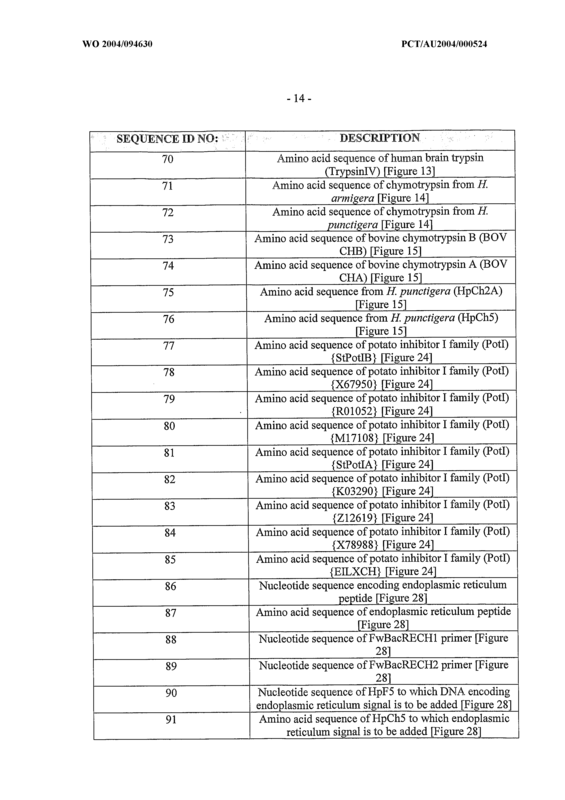 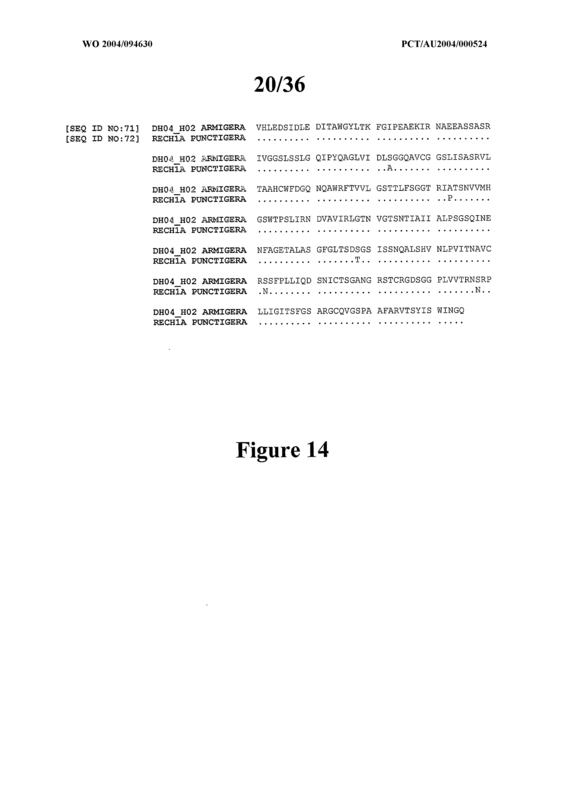 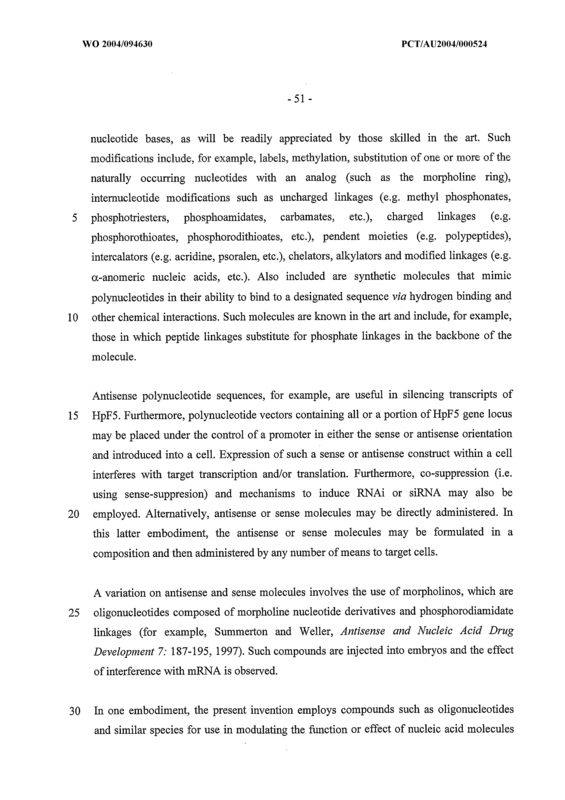 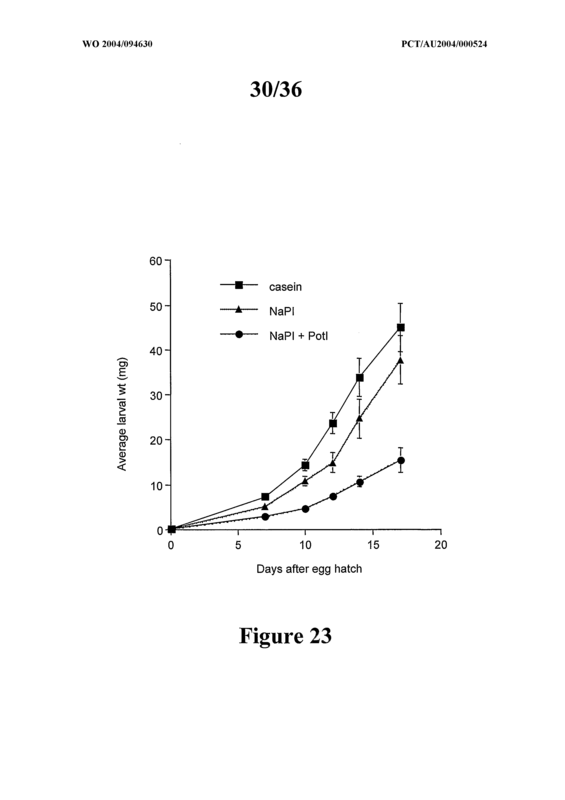 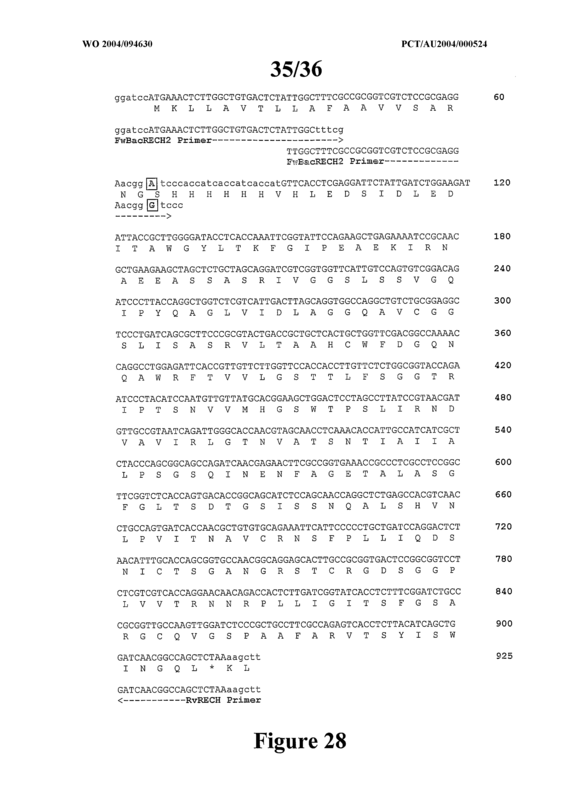 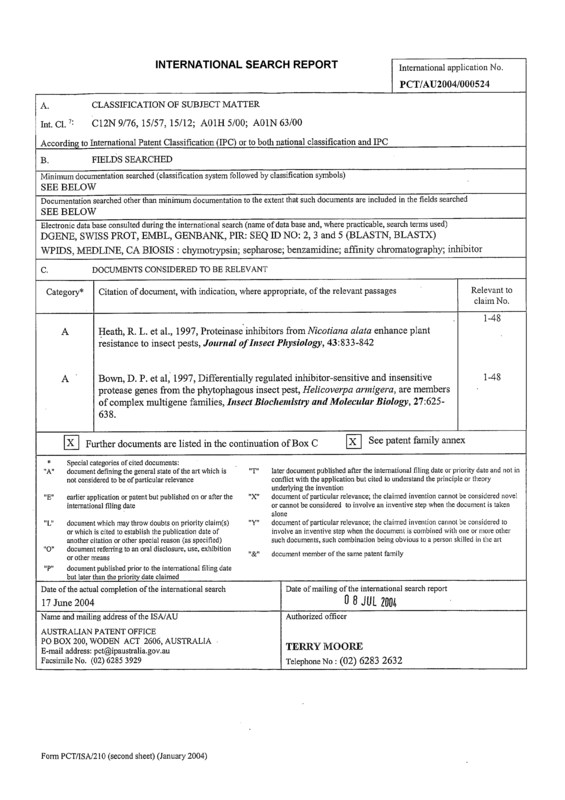 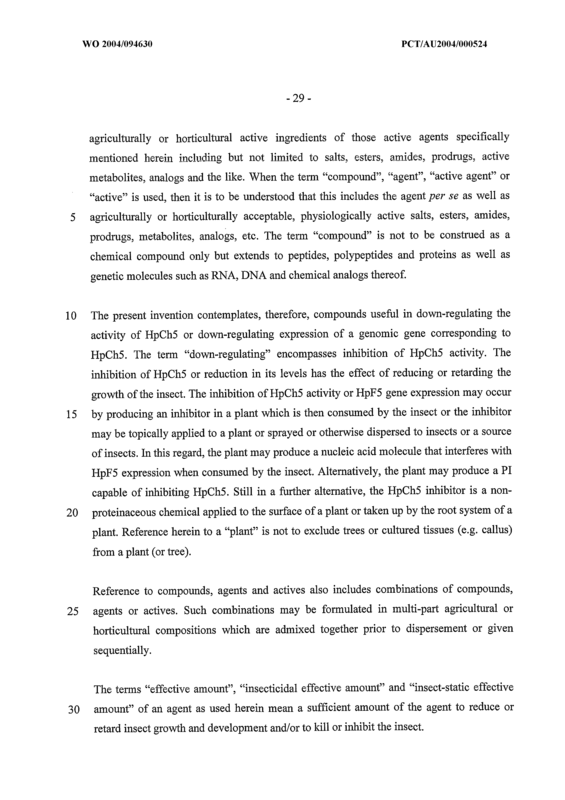 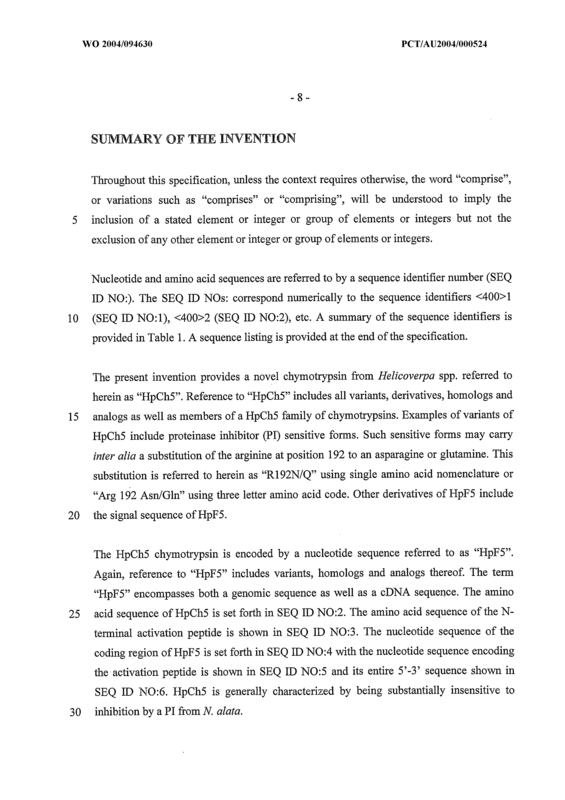 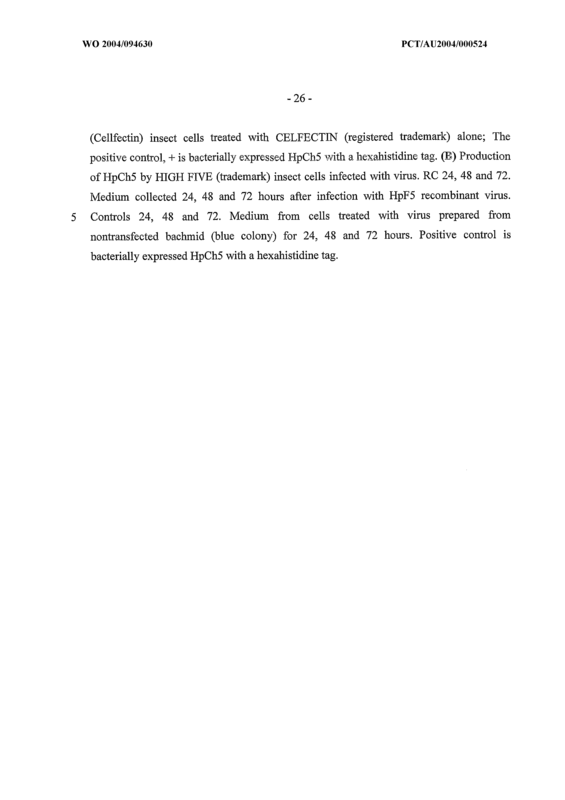 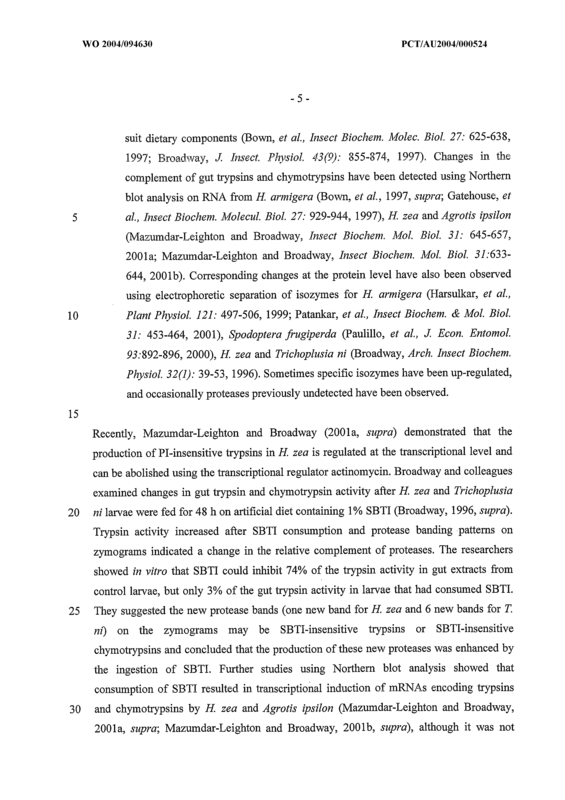 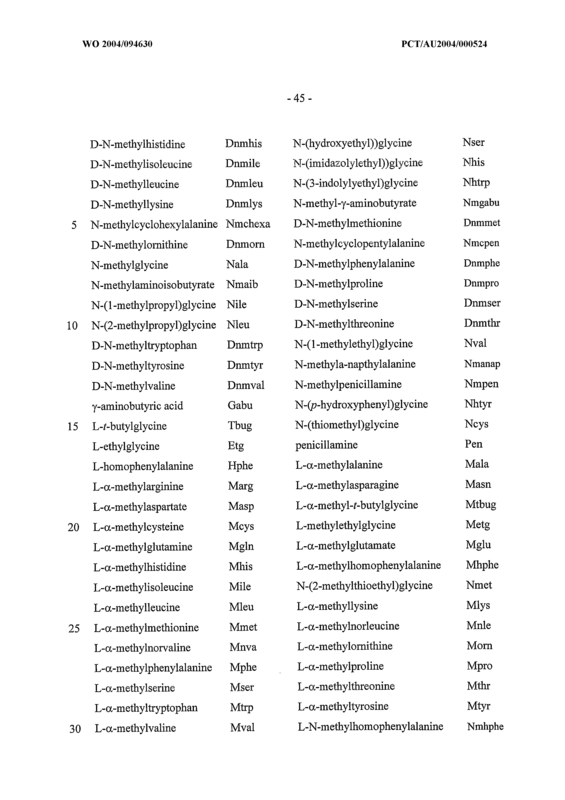 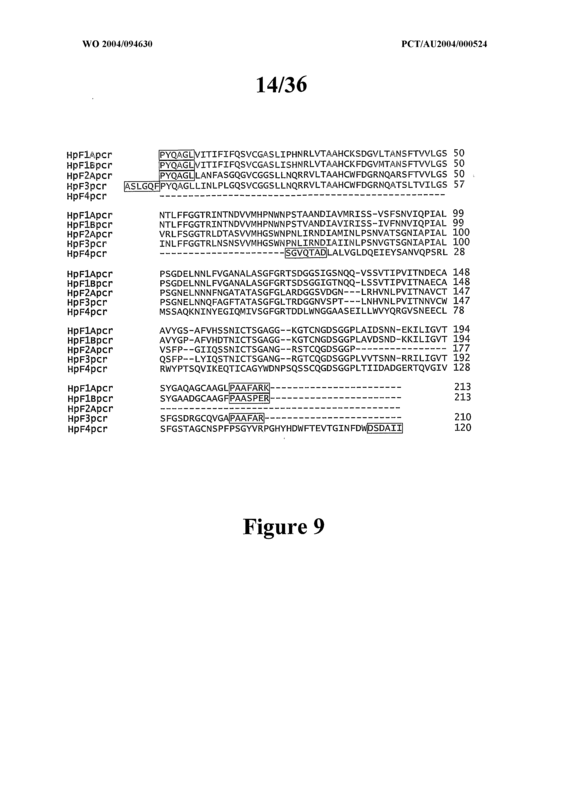 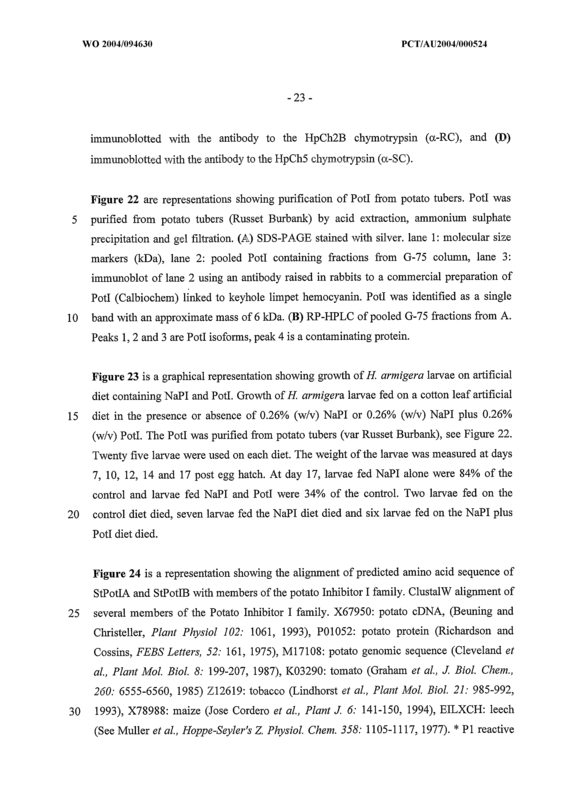 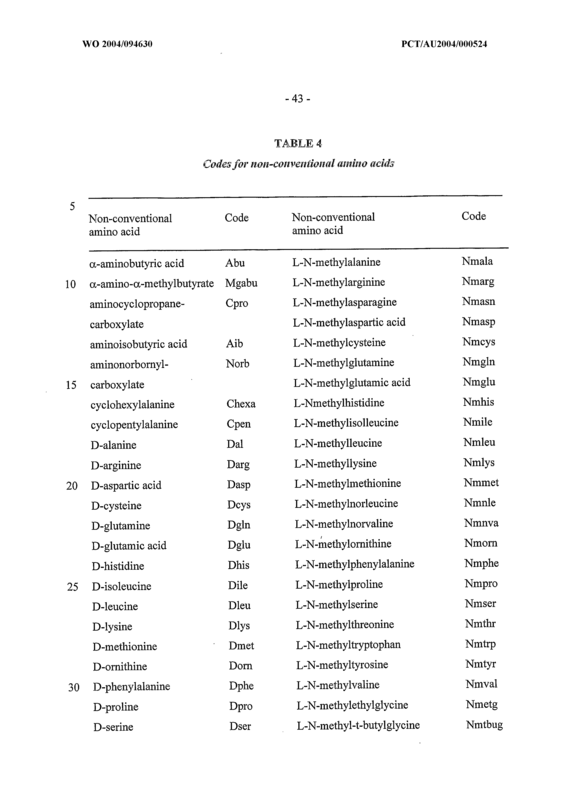 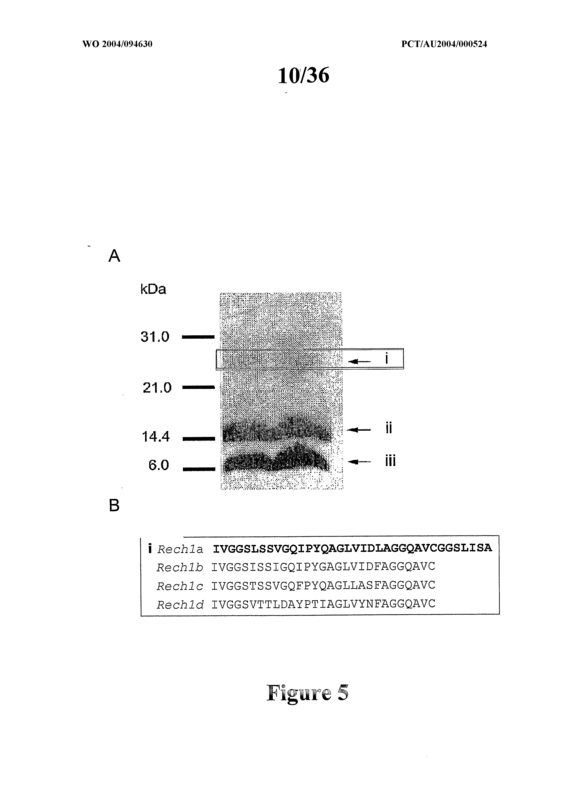 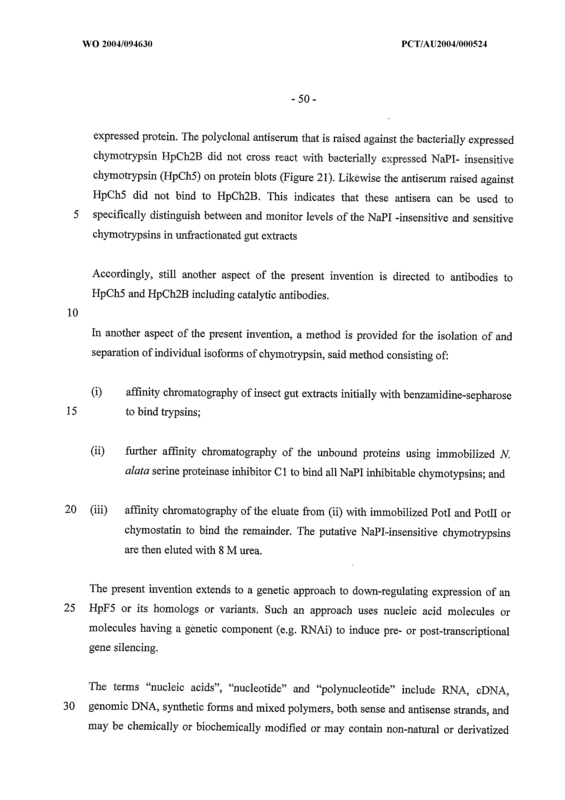 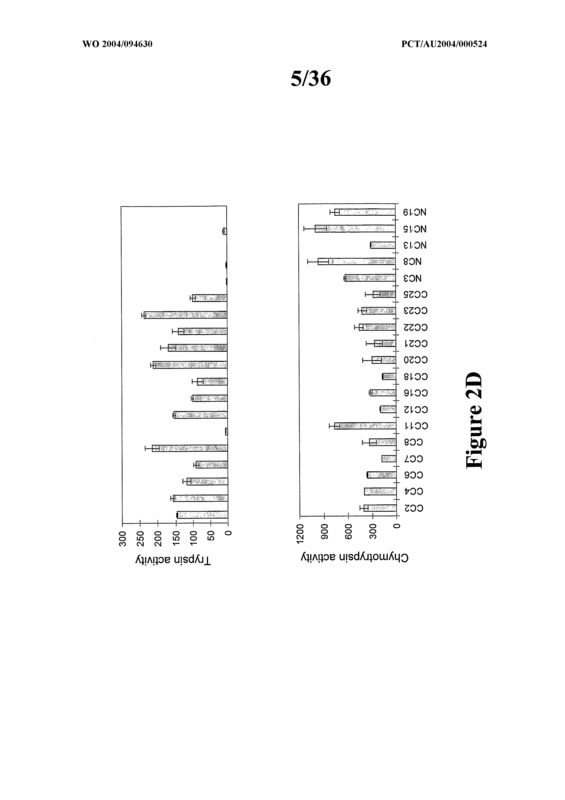 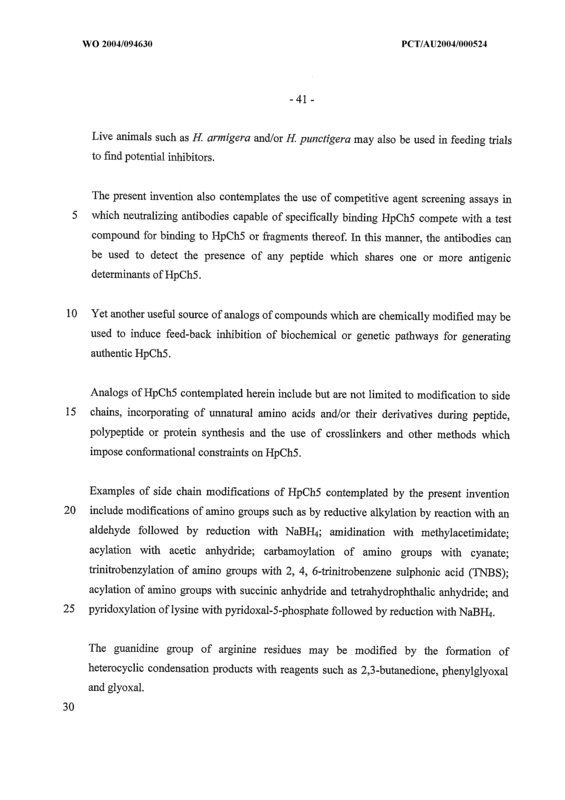 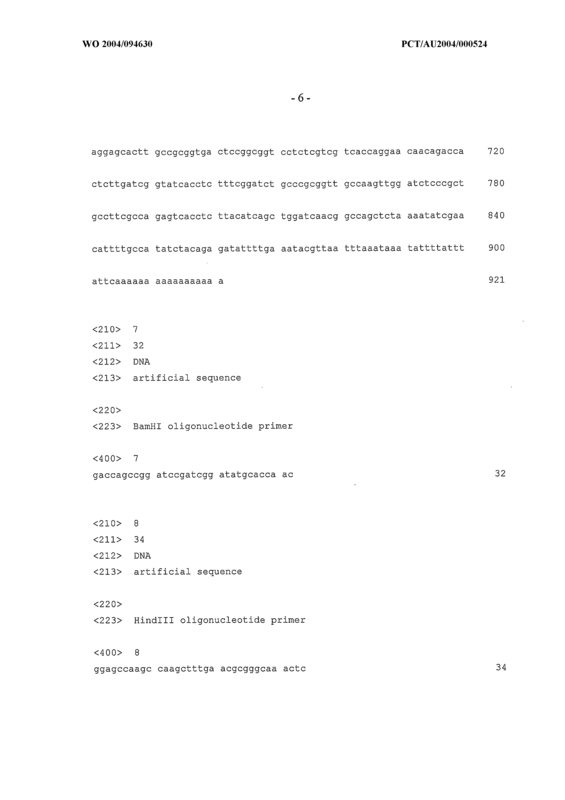 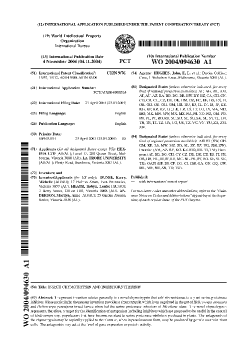 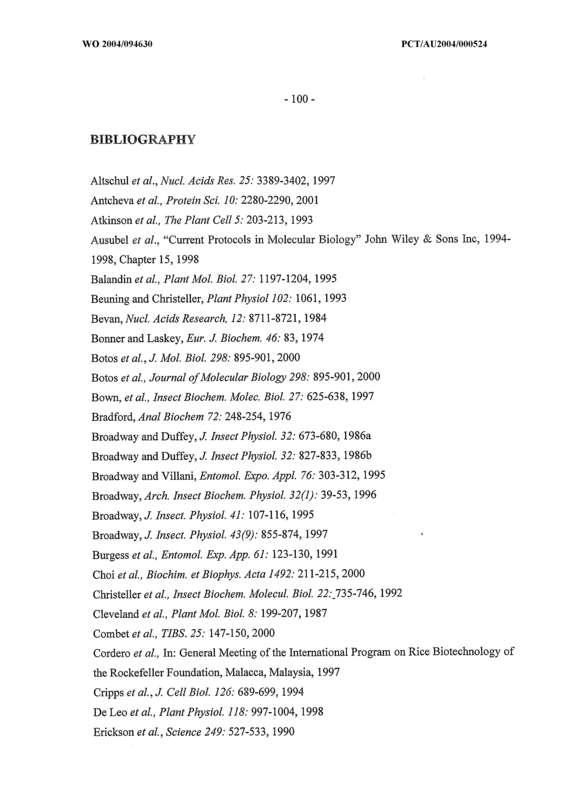 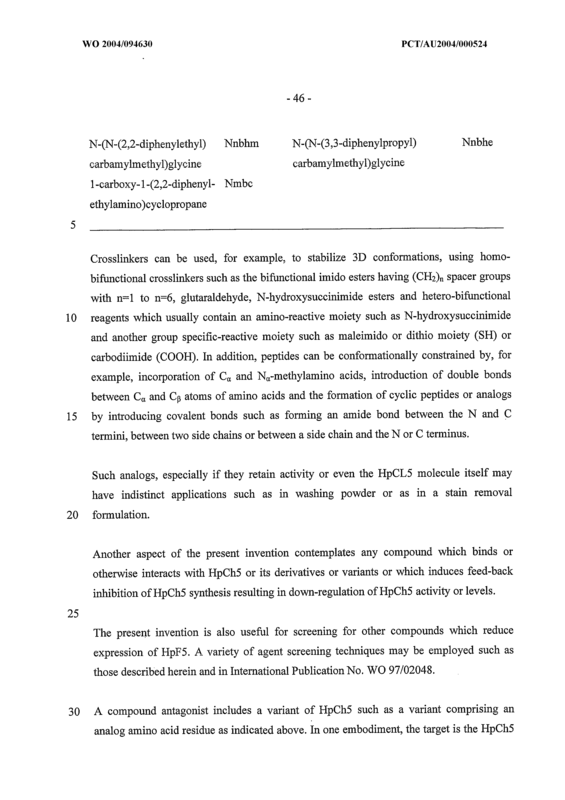 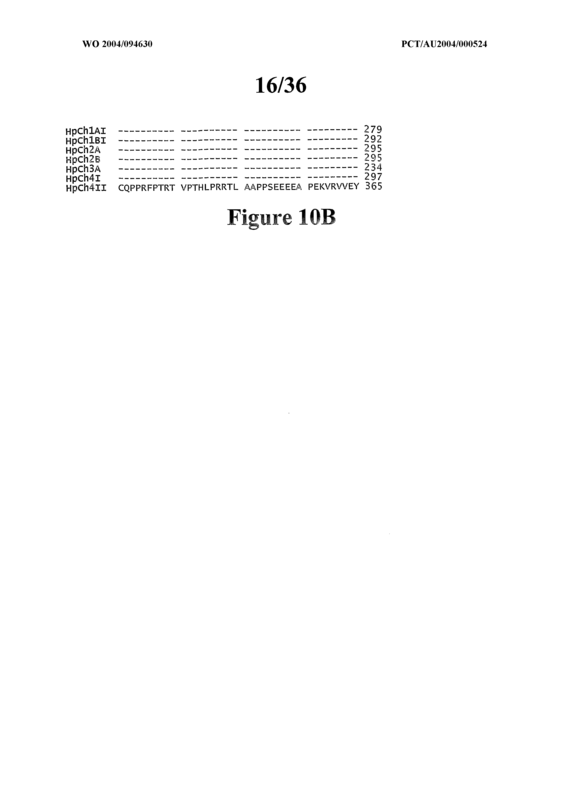 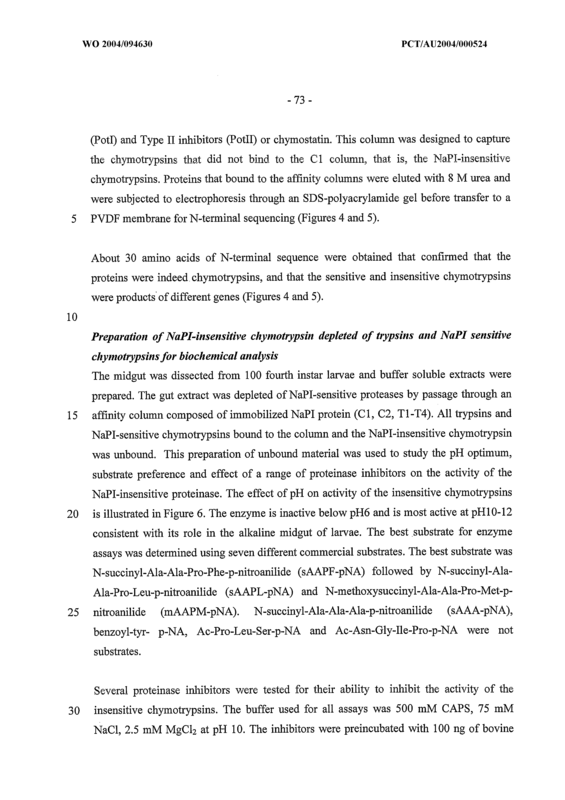 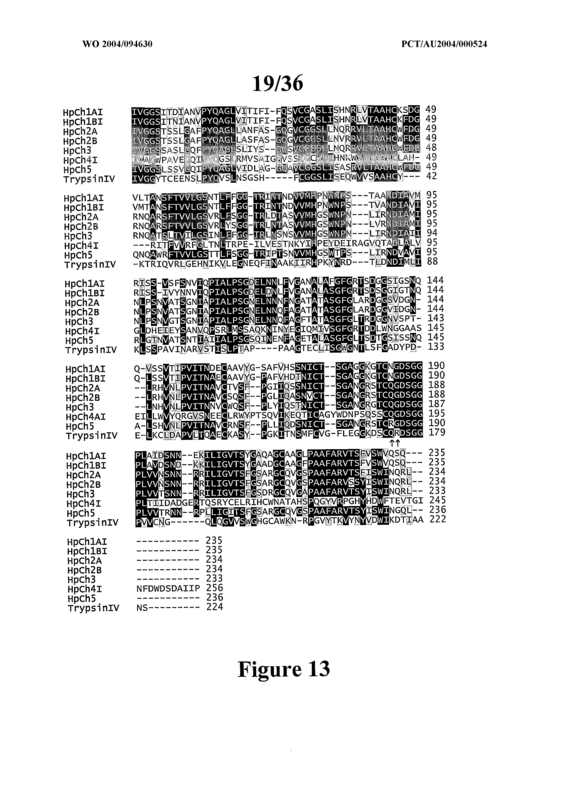 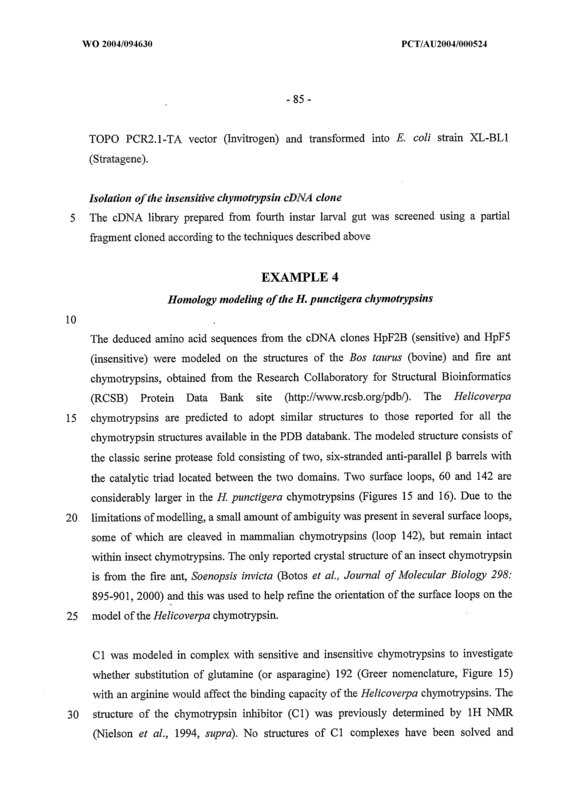 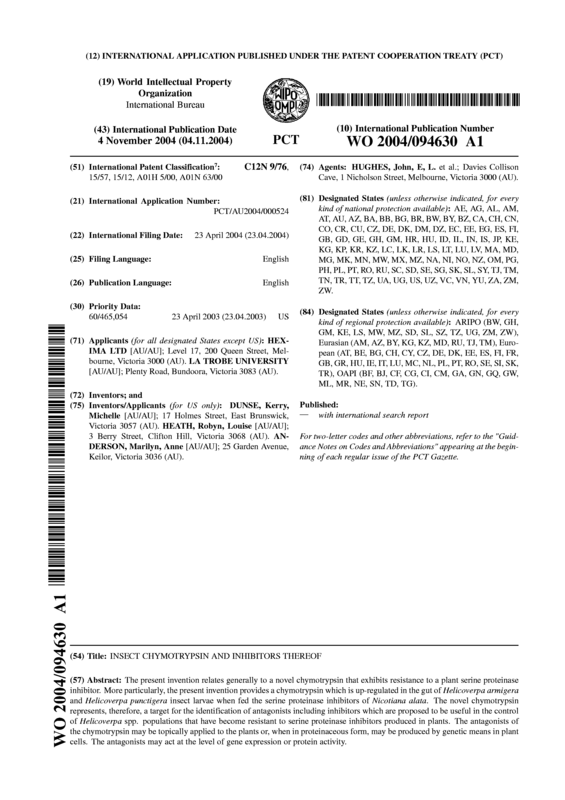 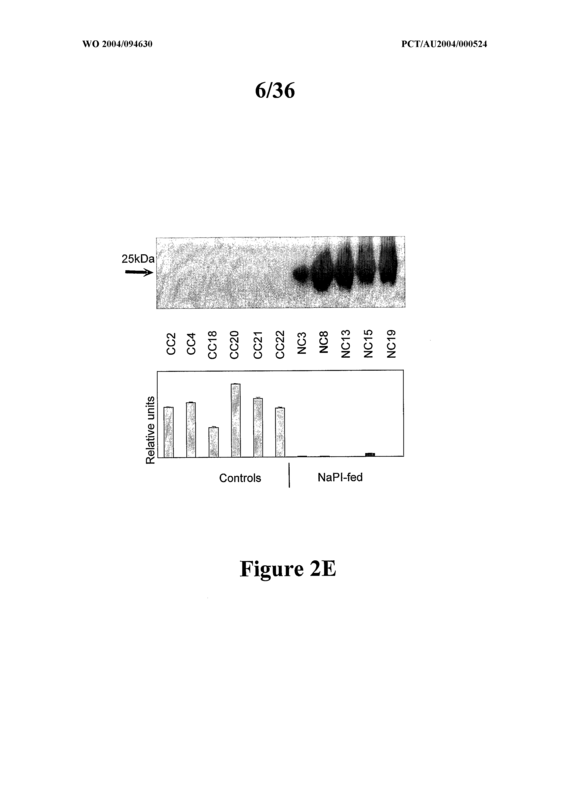 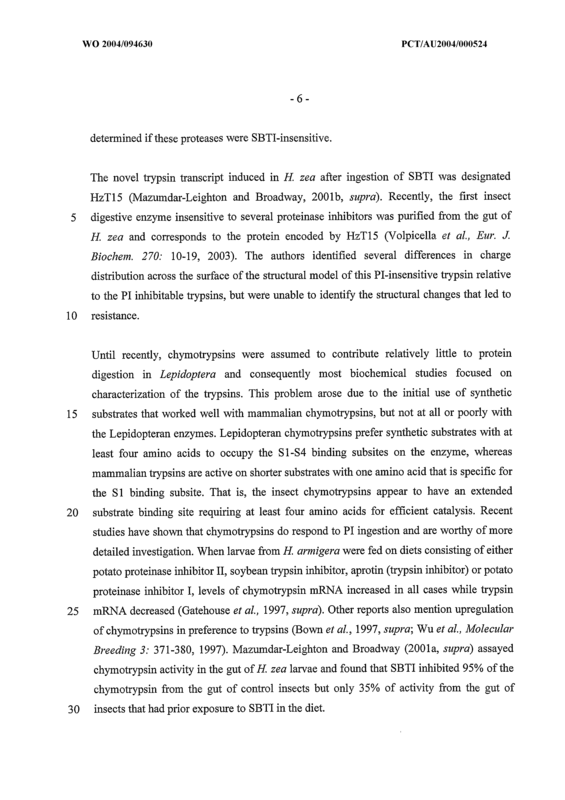 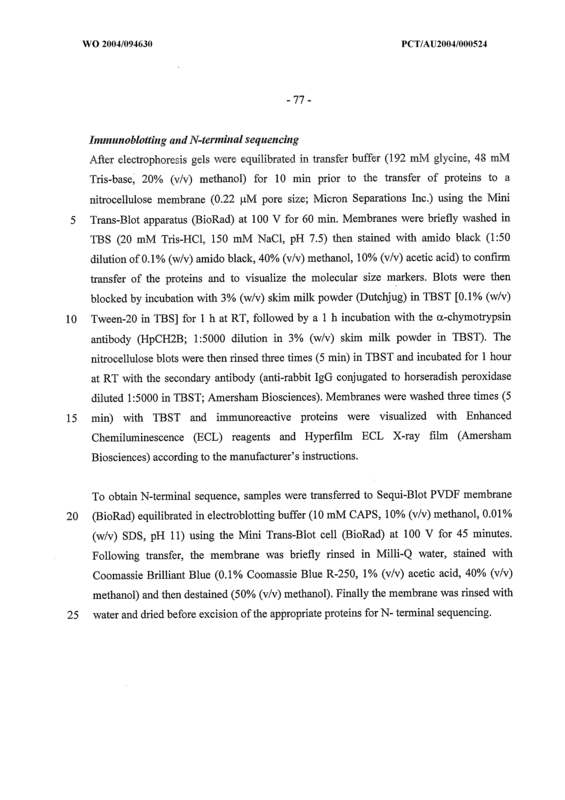 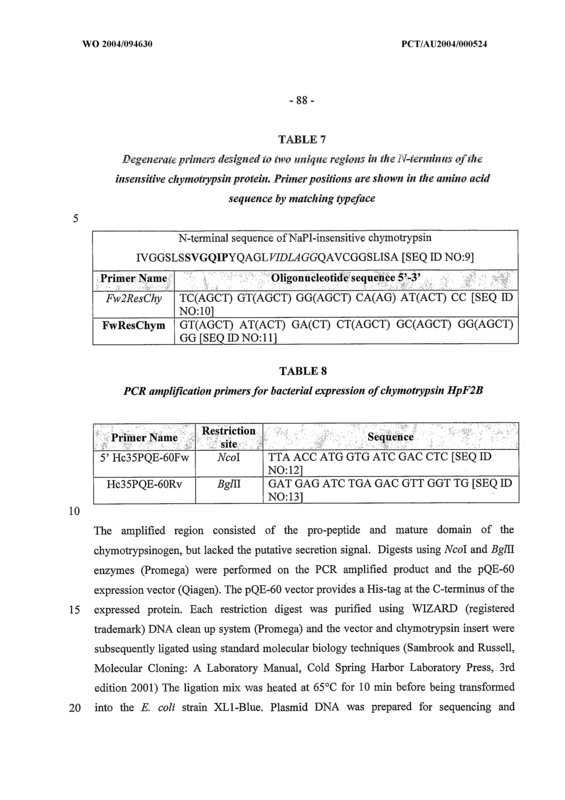 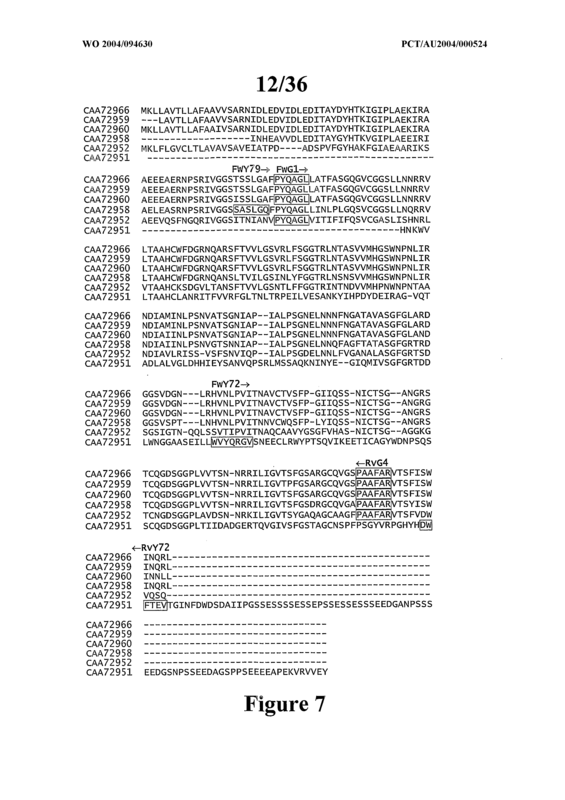 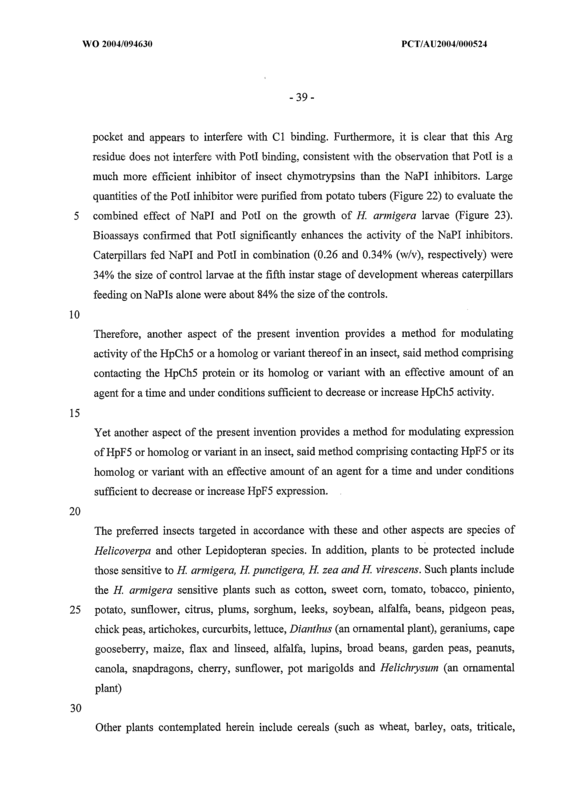 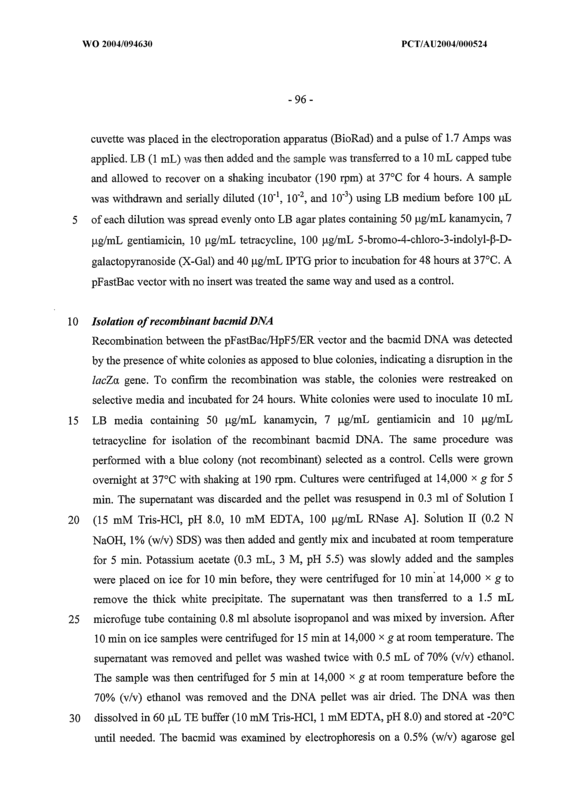 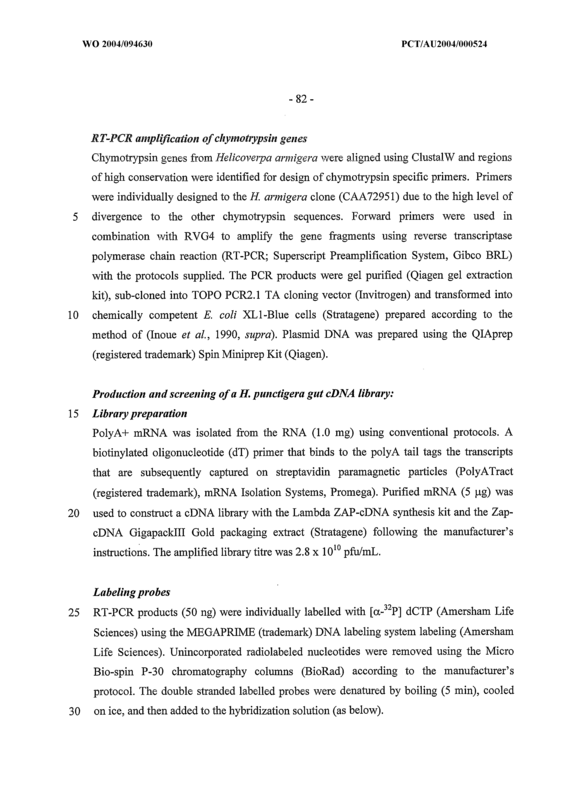 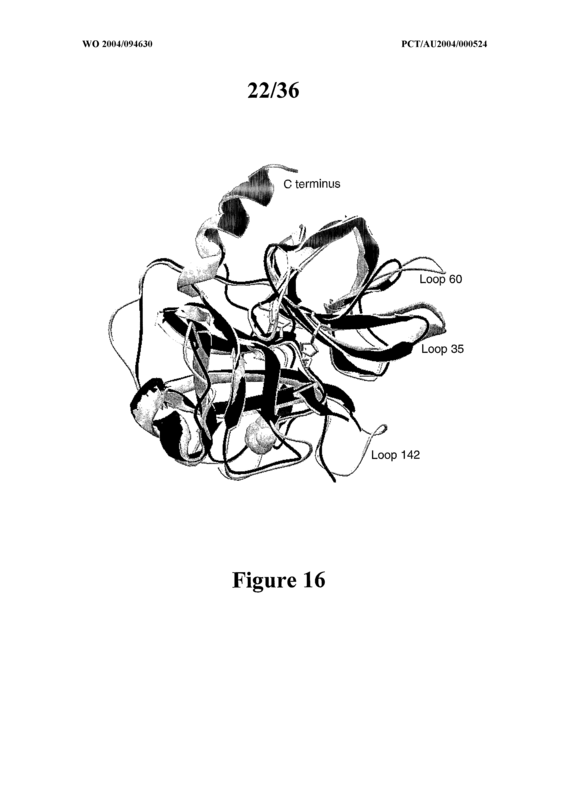 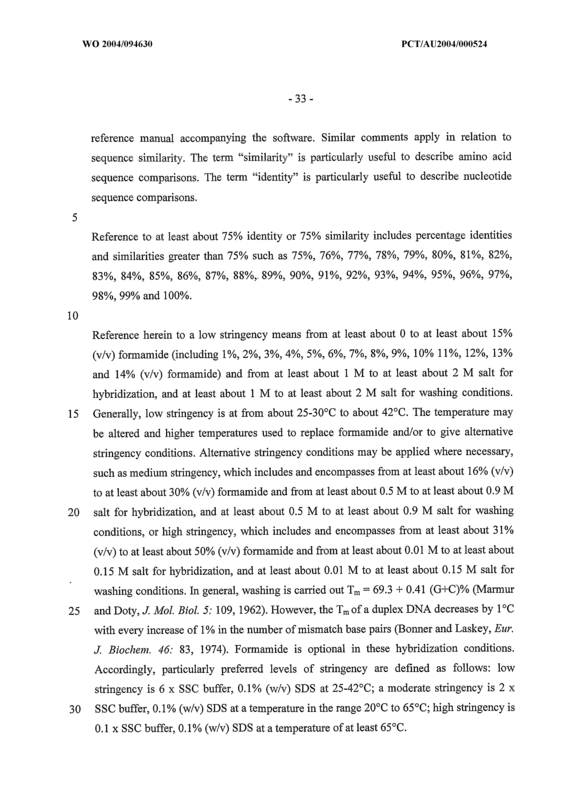 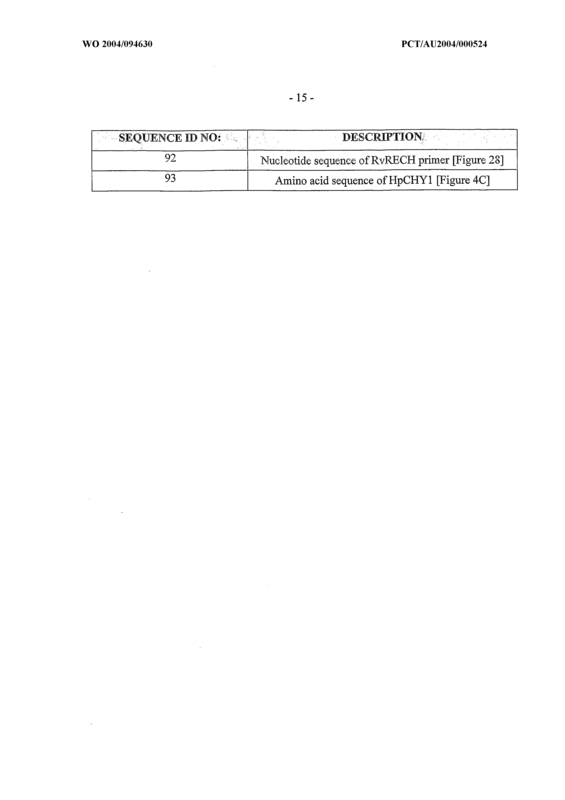 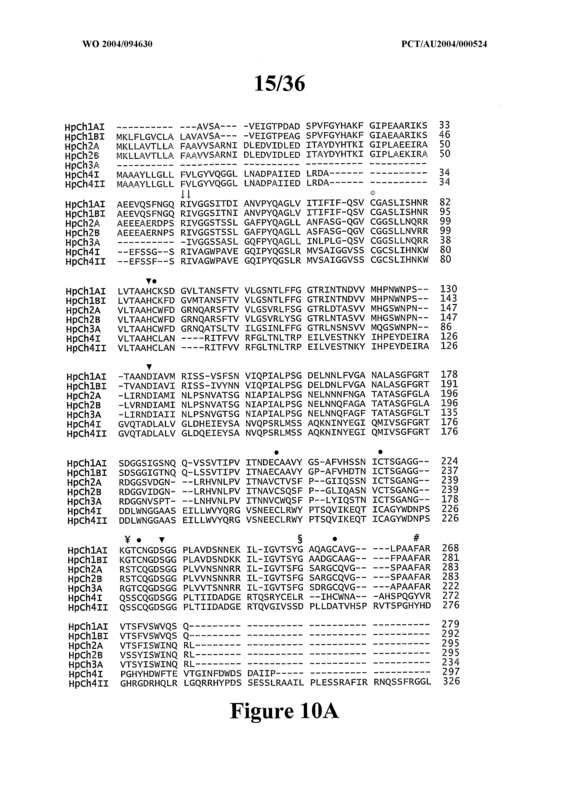 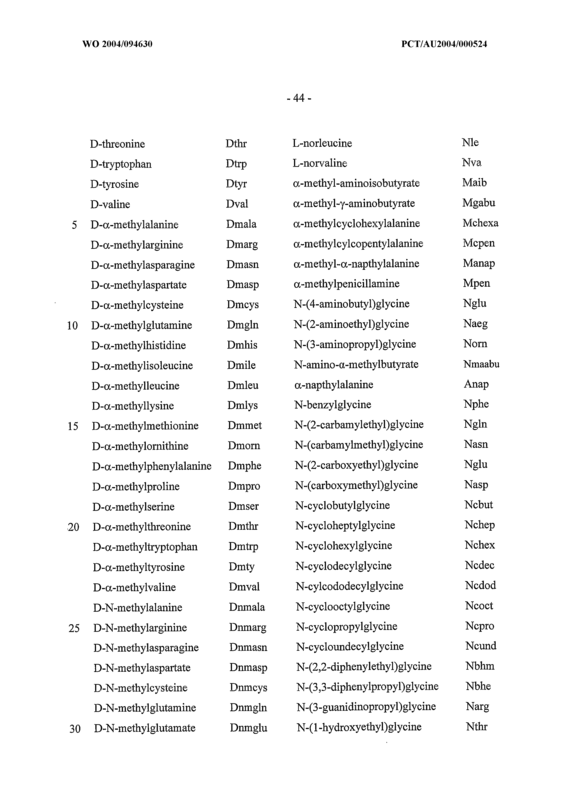 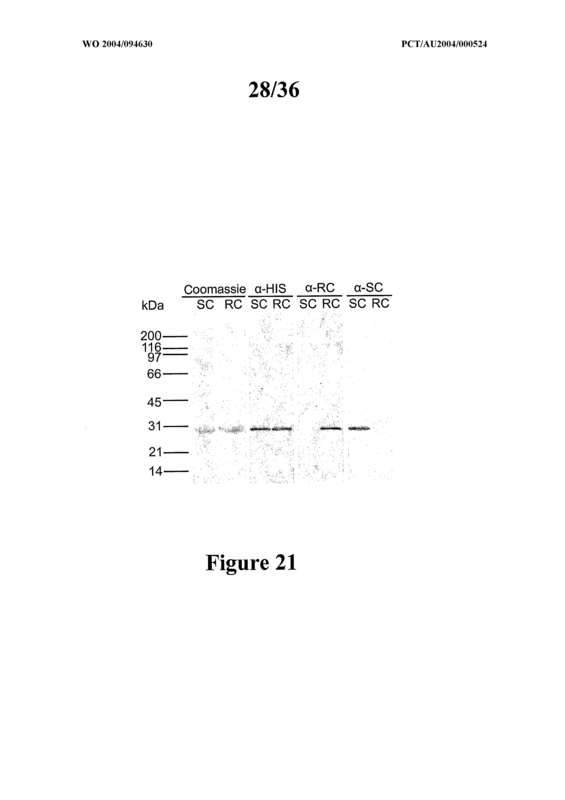 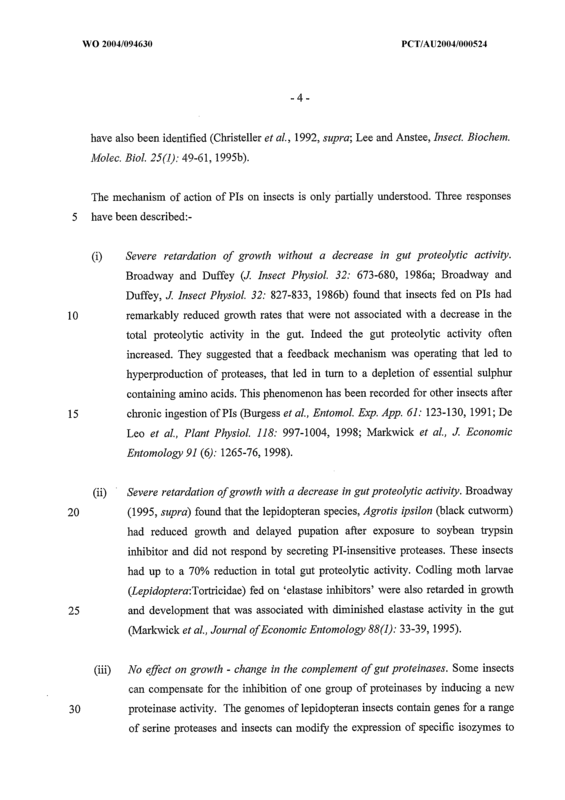 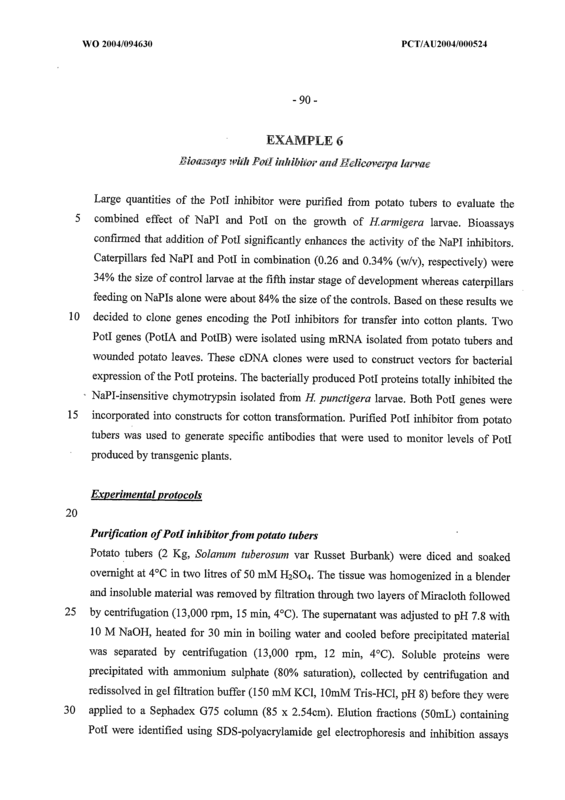 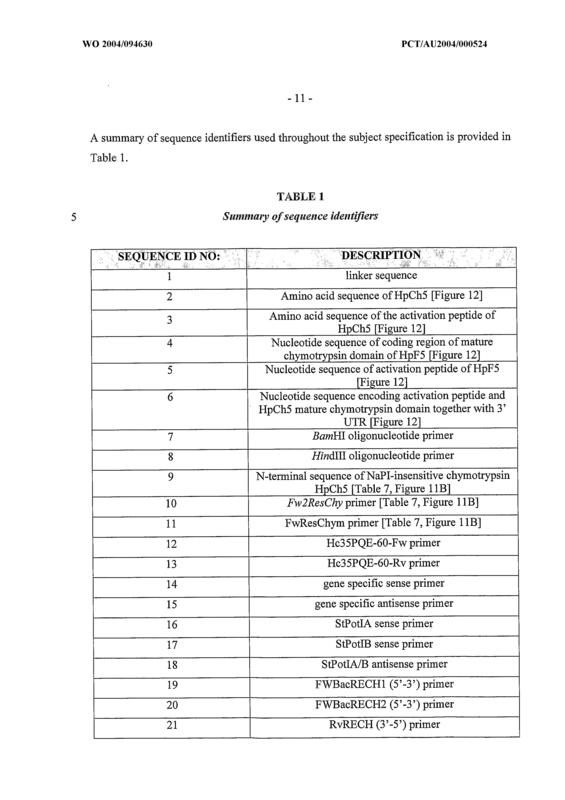 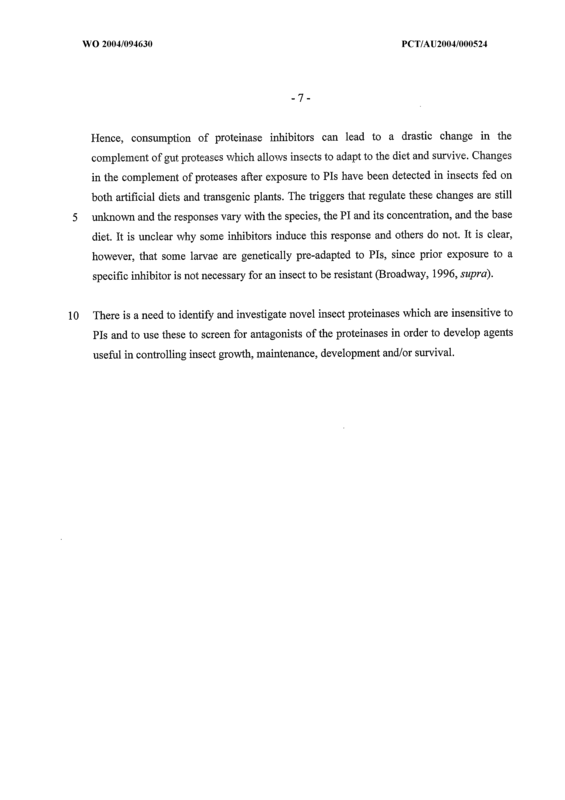 A method for modulating activity of the HpCh5 or a homolog or variant thereof in an insect, said method comprising contacting the HpCh5 protein or its homolog or variant with an effective amount of an agent for a time and under conditions sufficient to decrease or increase HpCh5 activity. 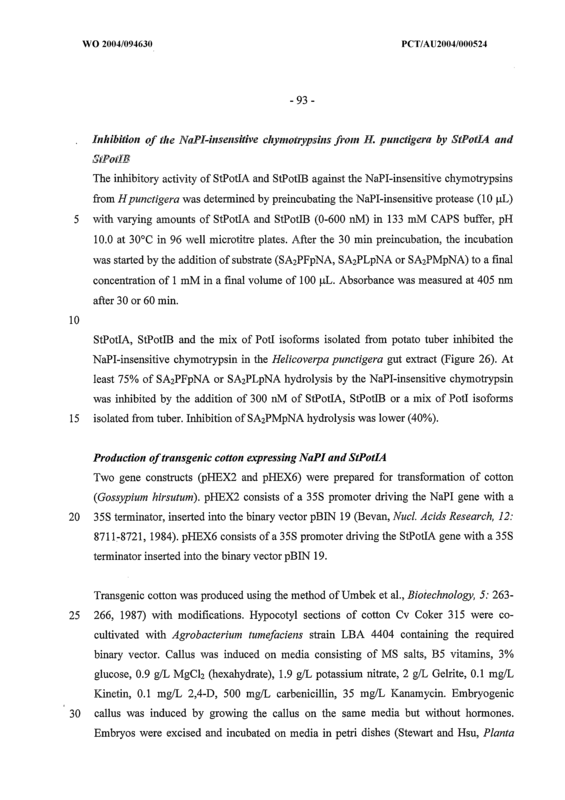 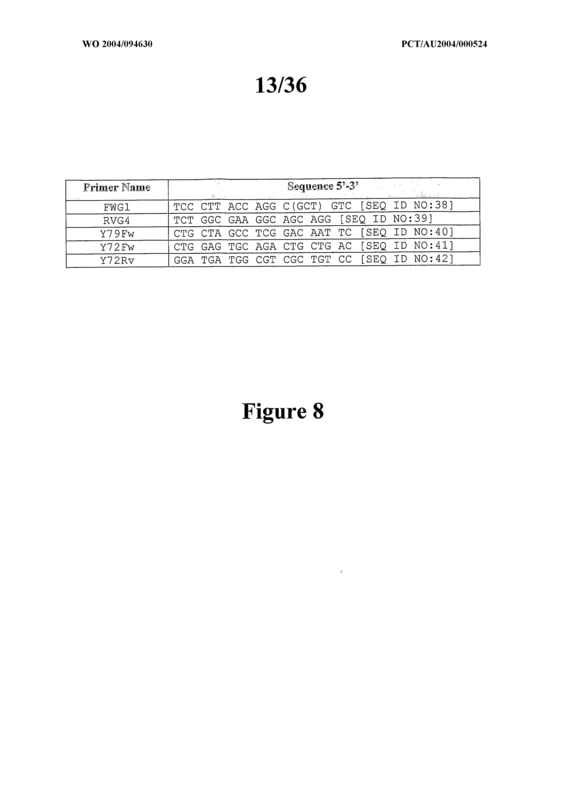 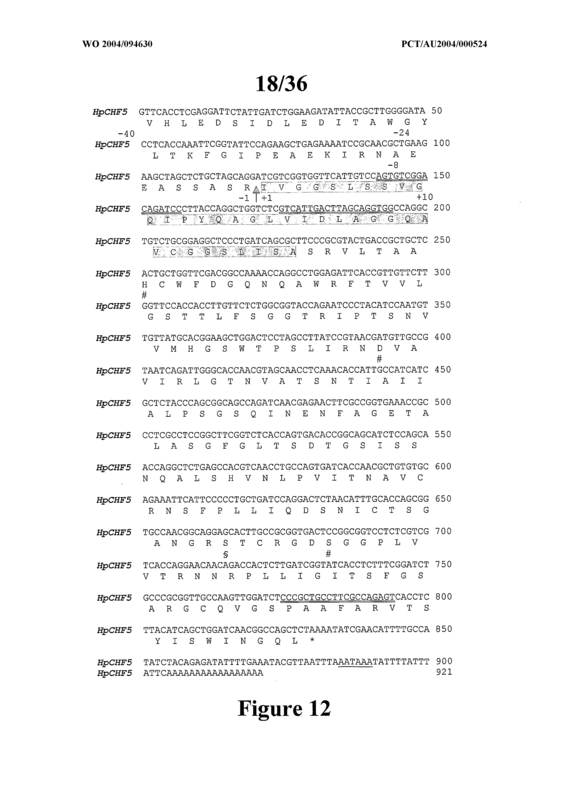 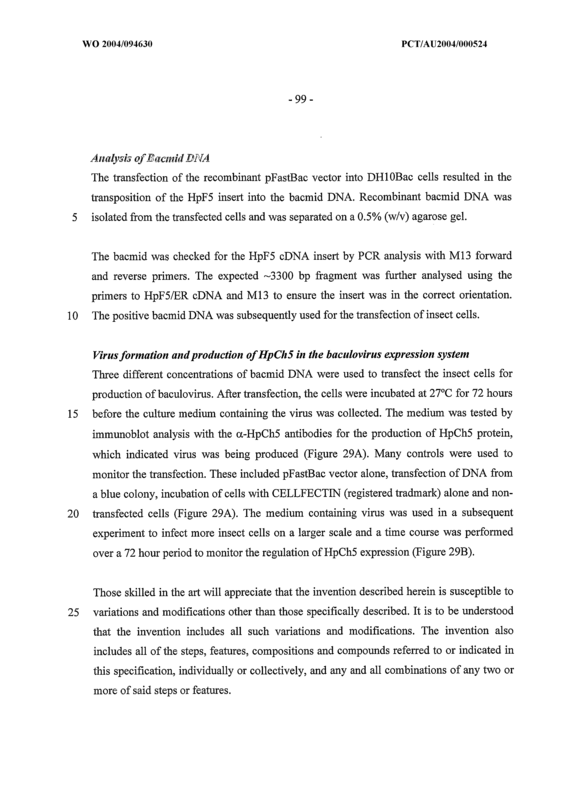 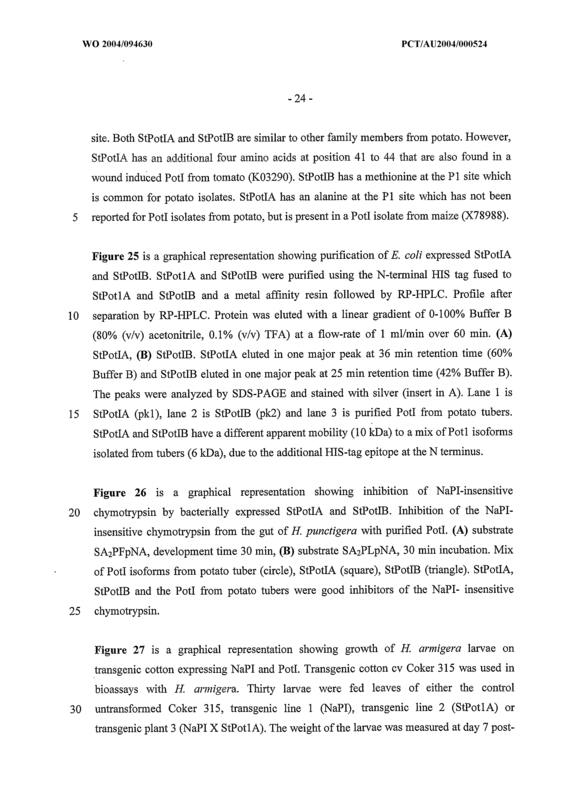 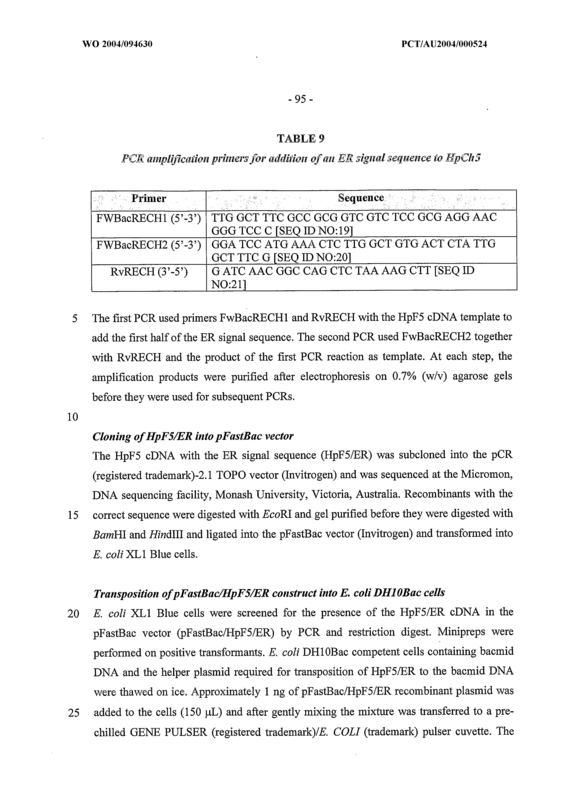 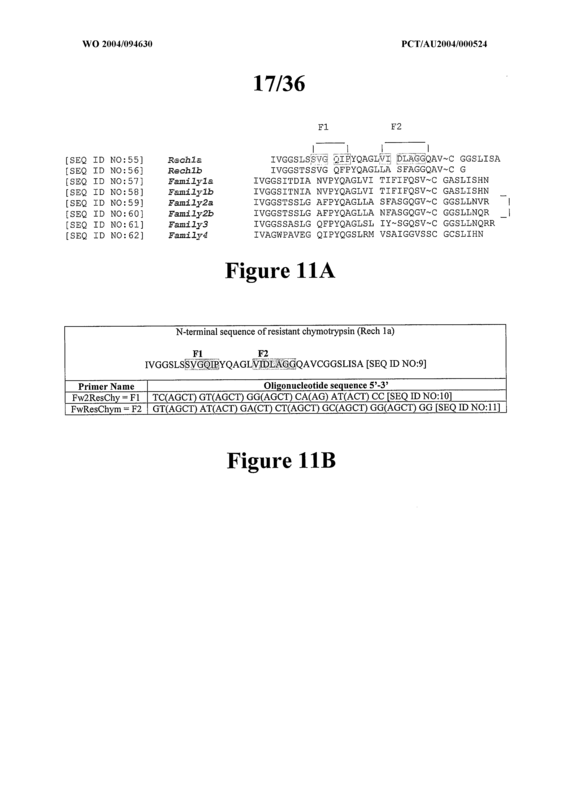 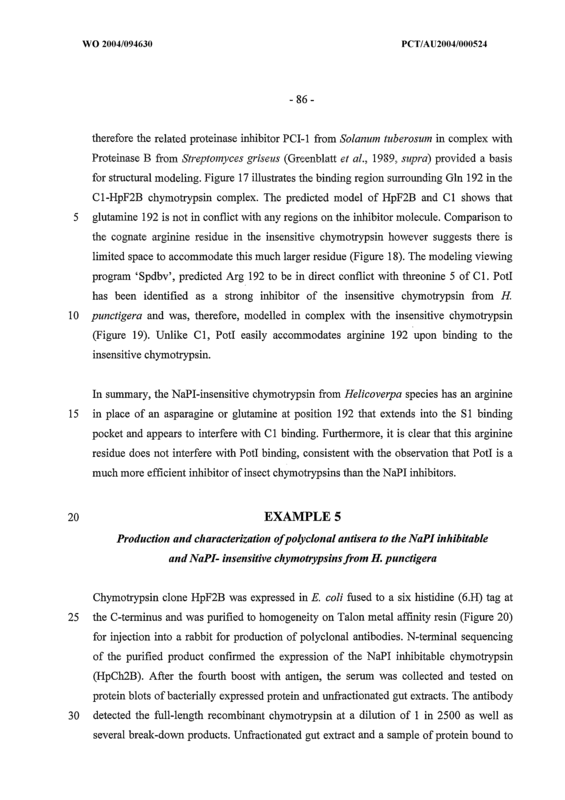 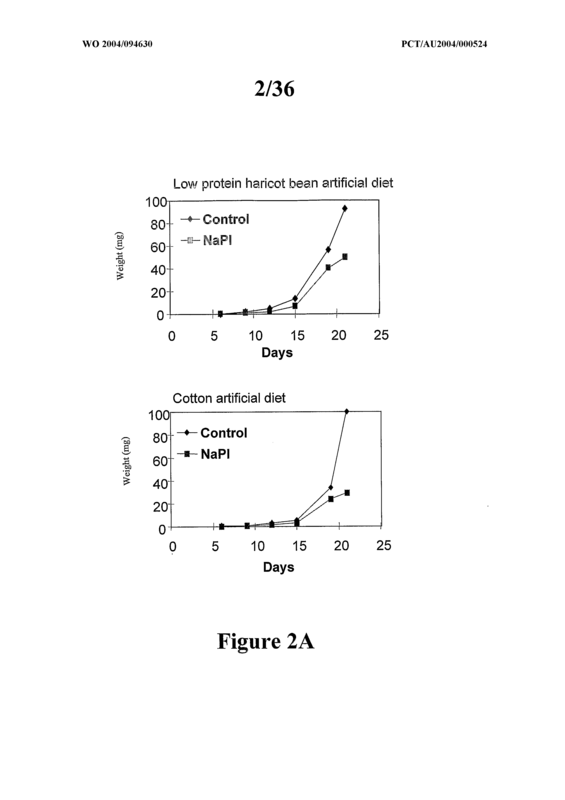 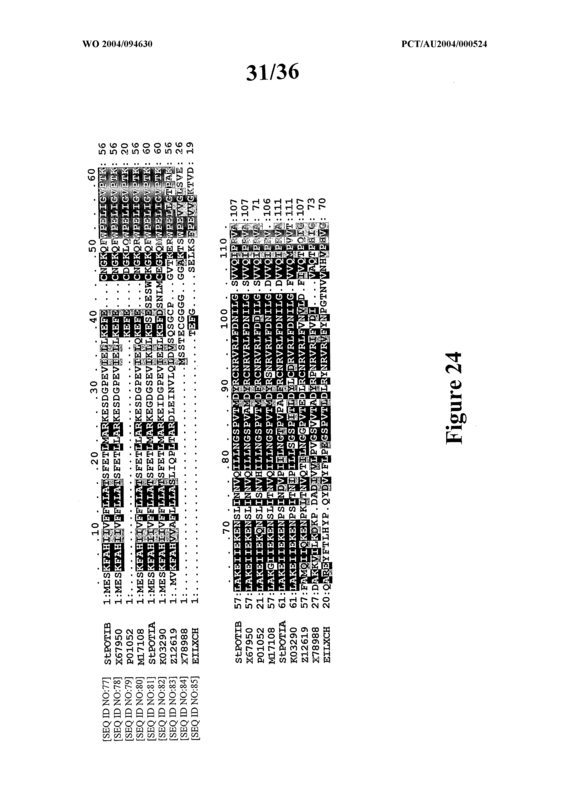 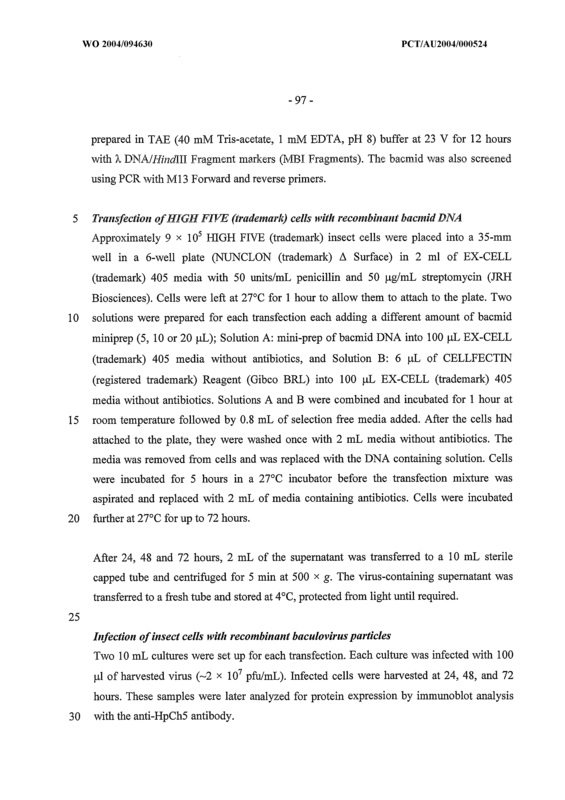 A method for modulating expression of HpF5 or homolog or variant in an insect, said method comprising contacting HpF5 or its homolog or variant with an effective amount of an agent for a time and under conditions sufficient to decrease or increase HpF5 expression. 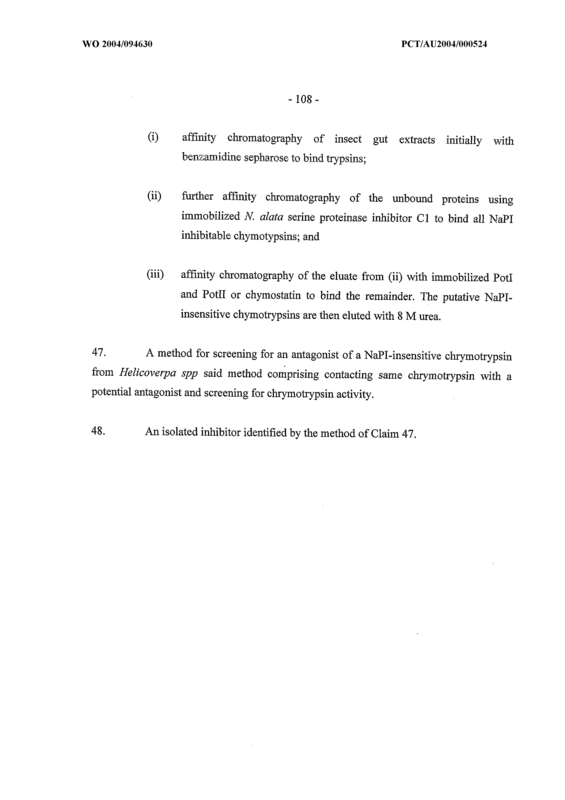 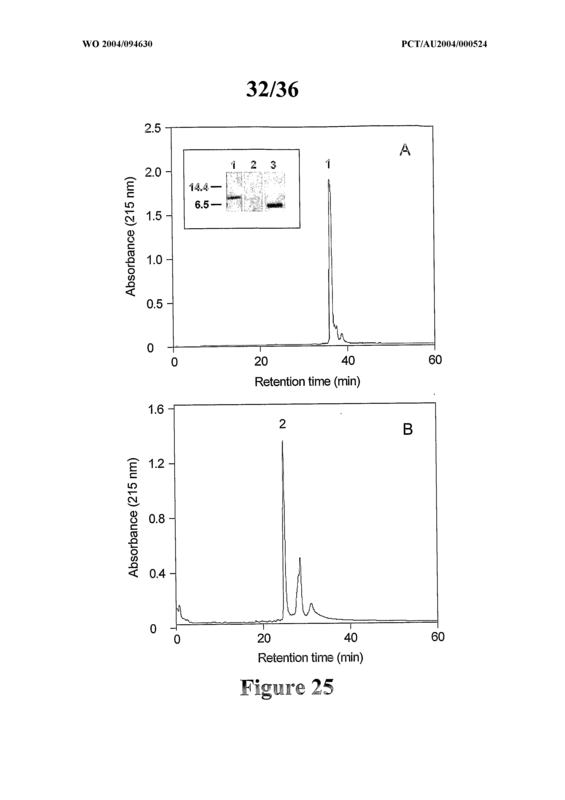 (iii) affinity chromatography of the eluate from (ii) with immobilized Potl and Potll or chymostatin to bind the remainder. 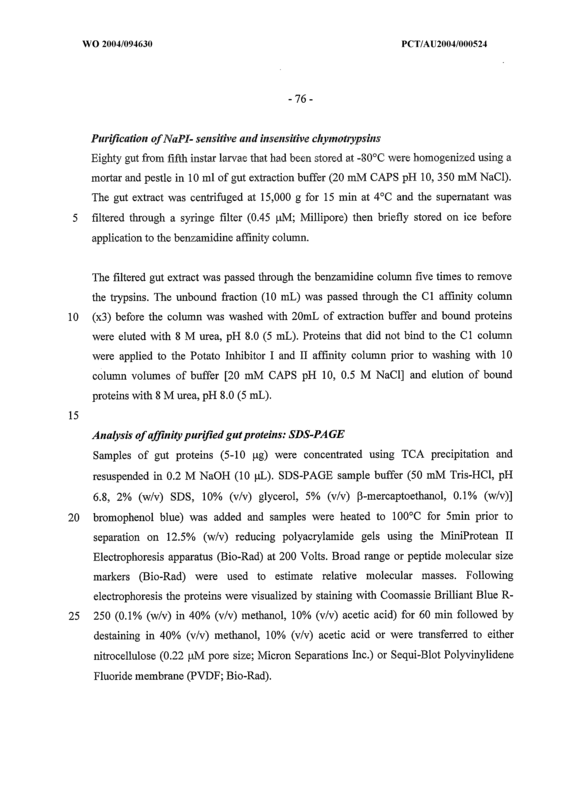 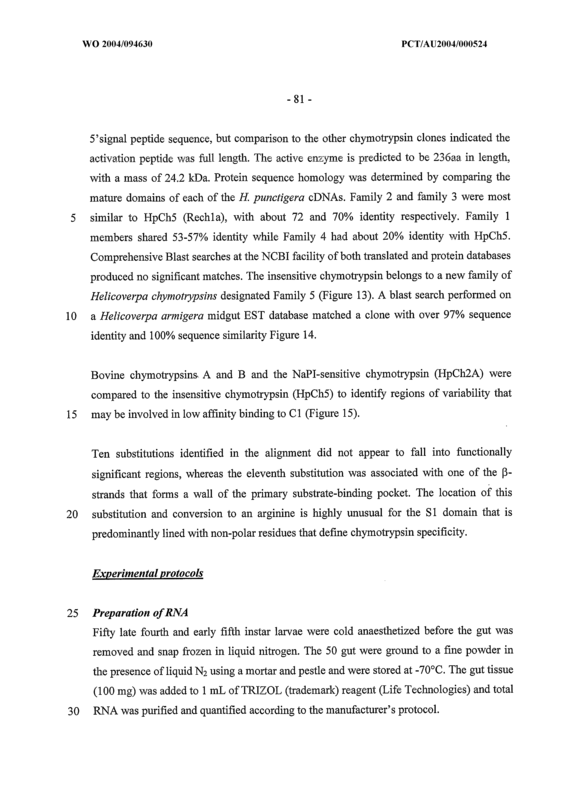 The putative ΝaPI- insensitive chymotrypsins are then eluted with 8 M urea. 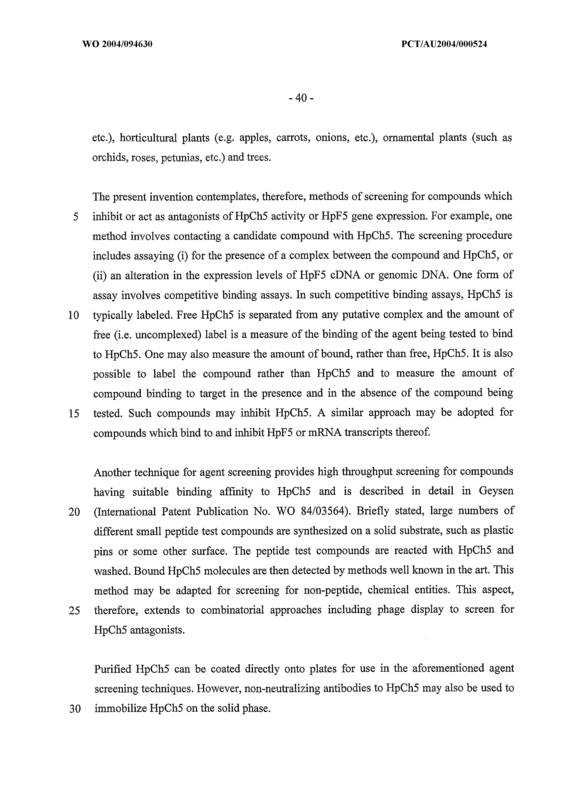 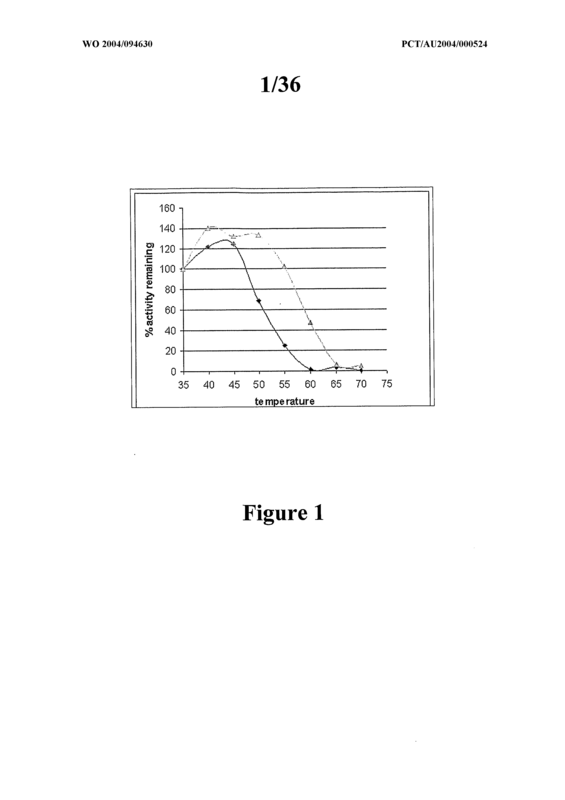 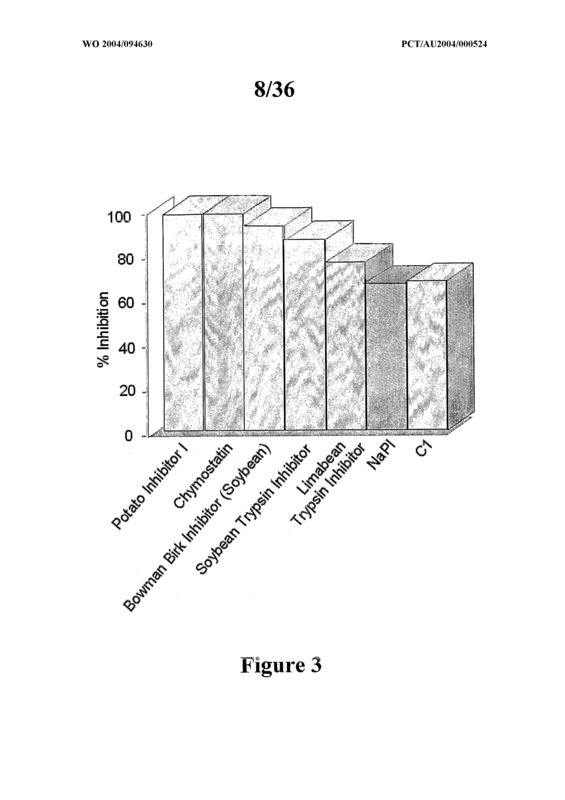 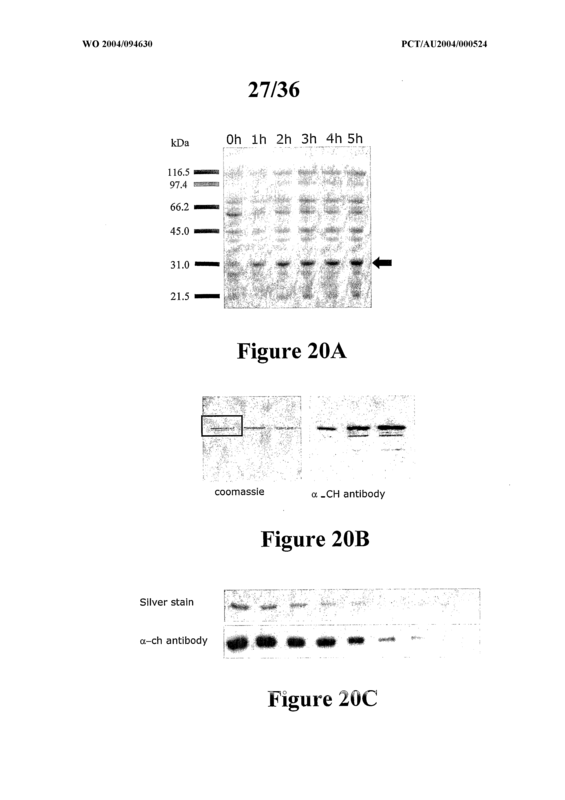 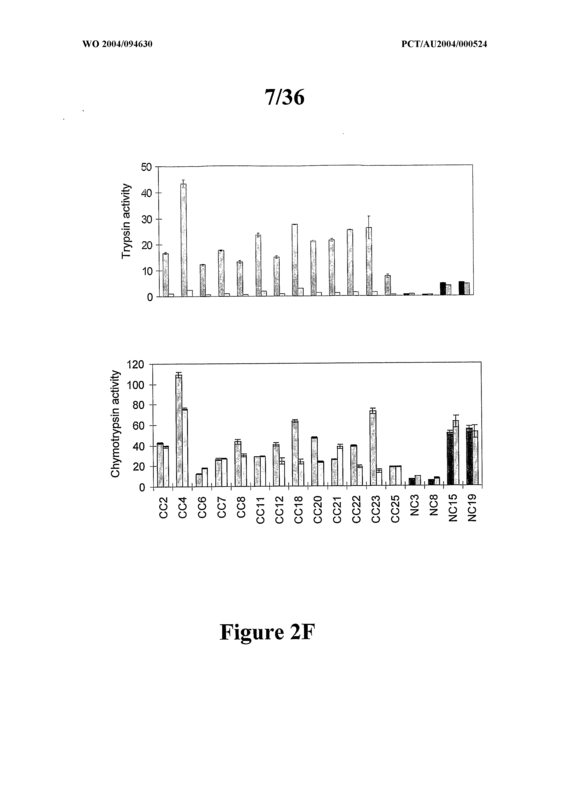 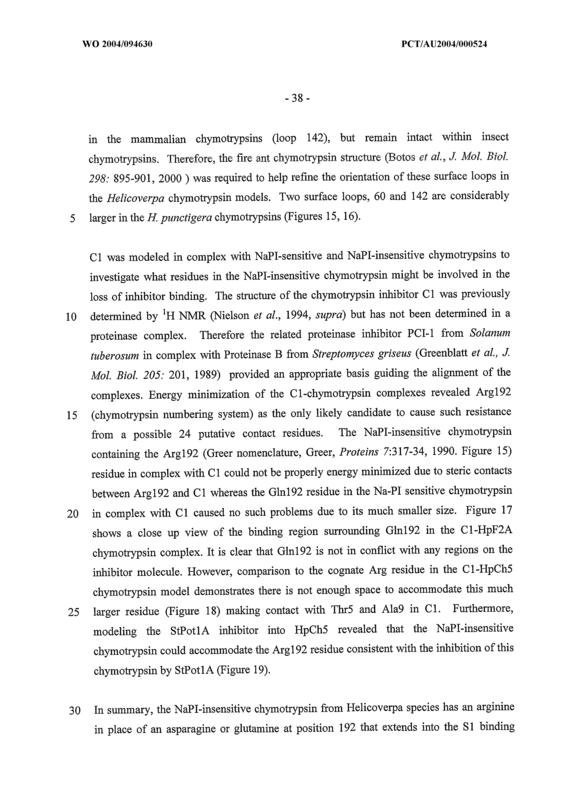 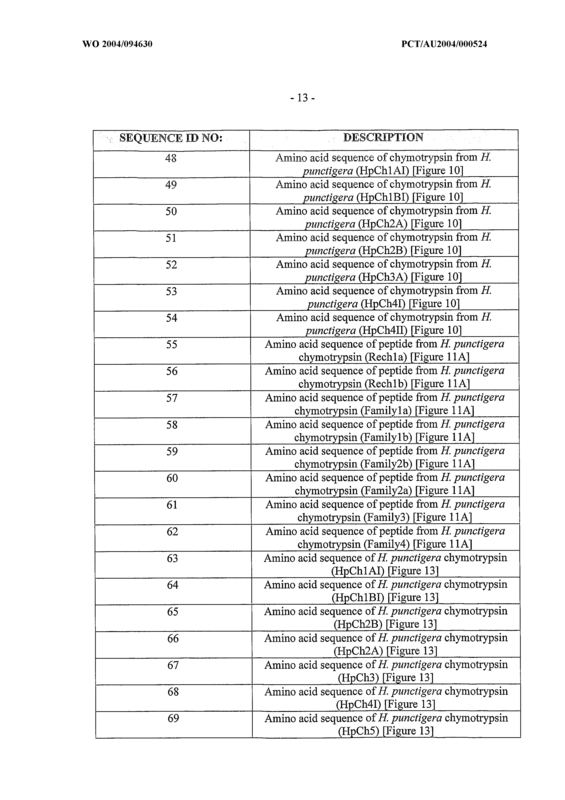 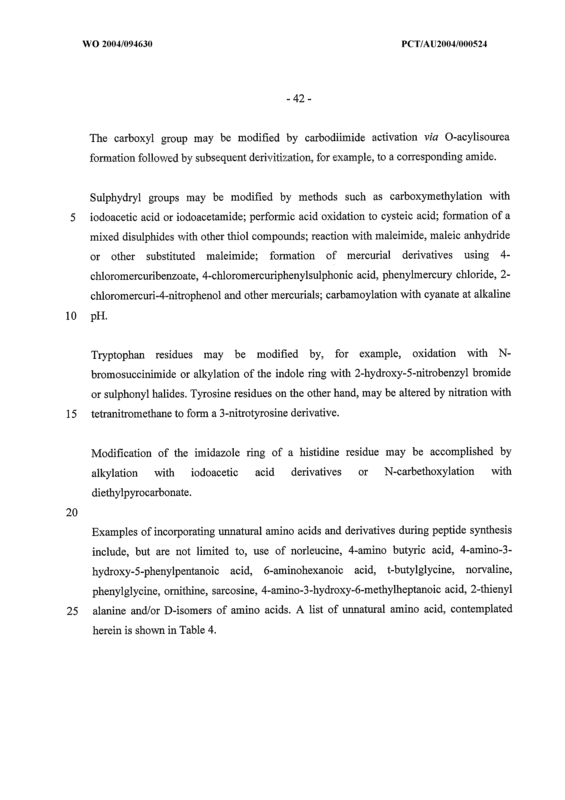 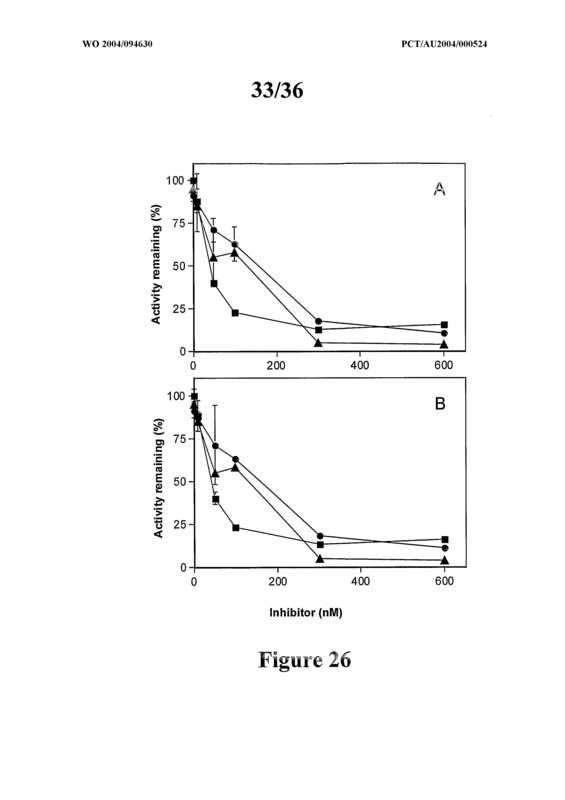 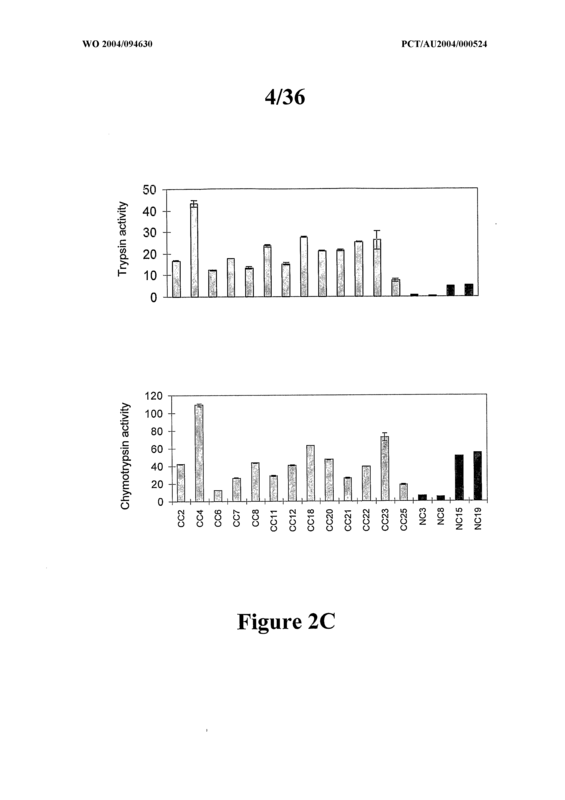 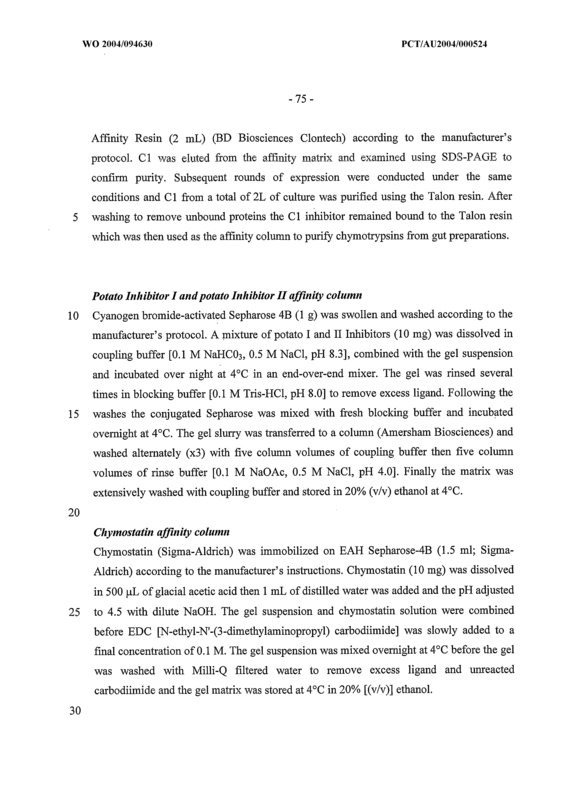 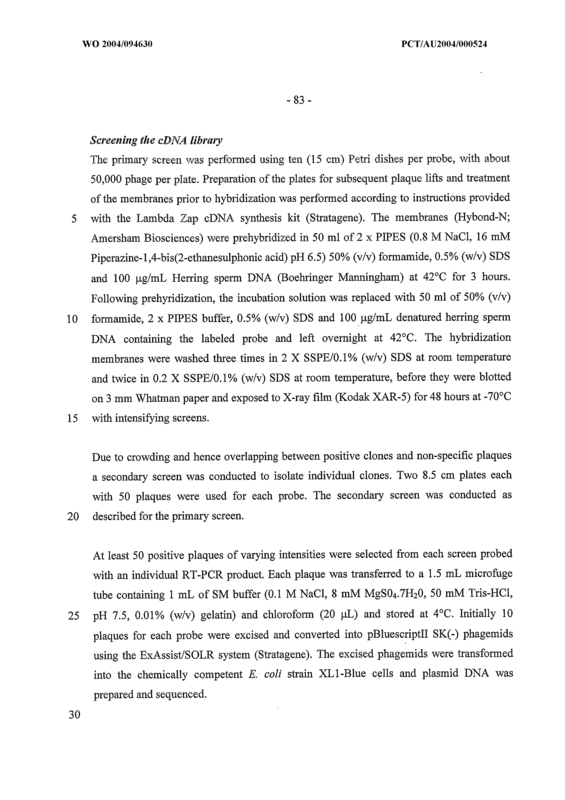 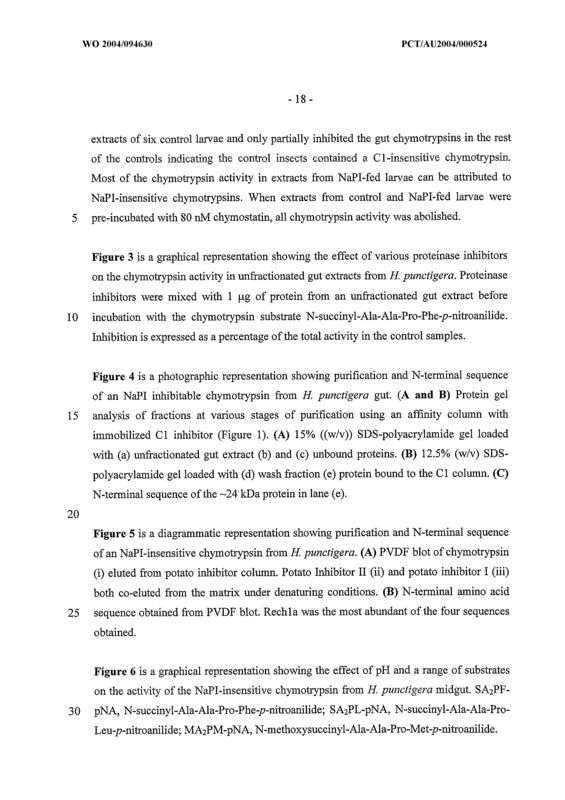 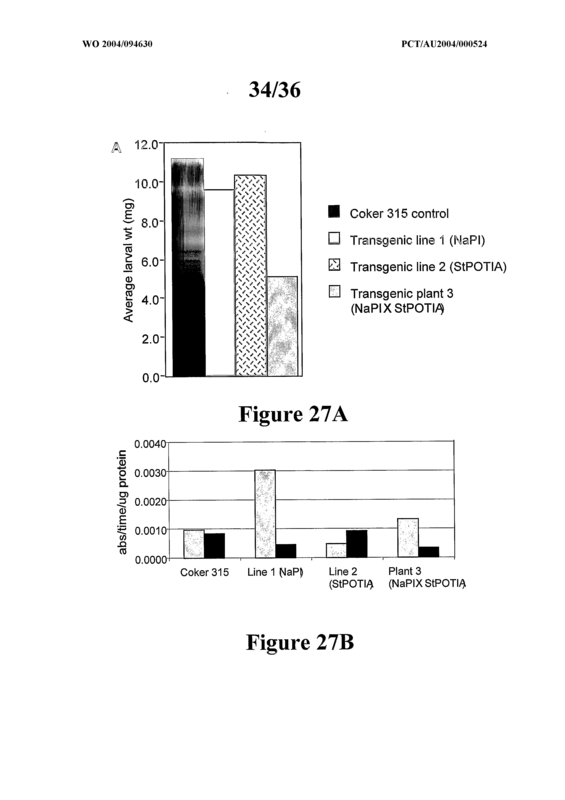 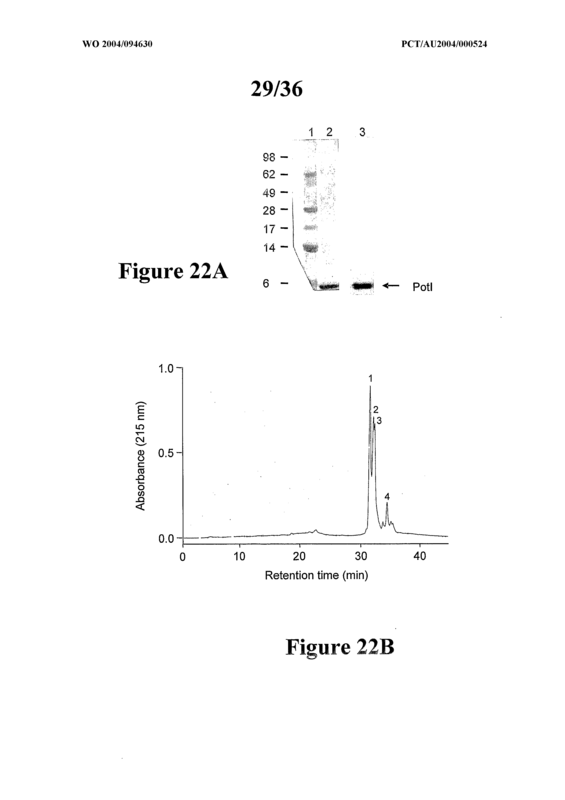 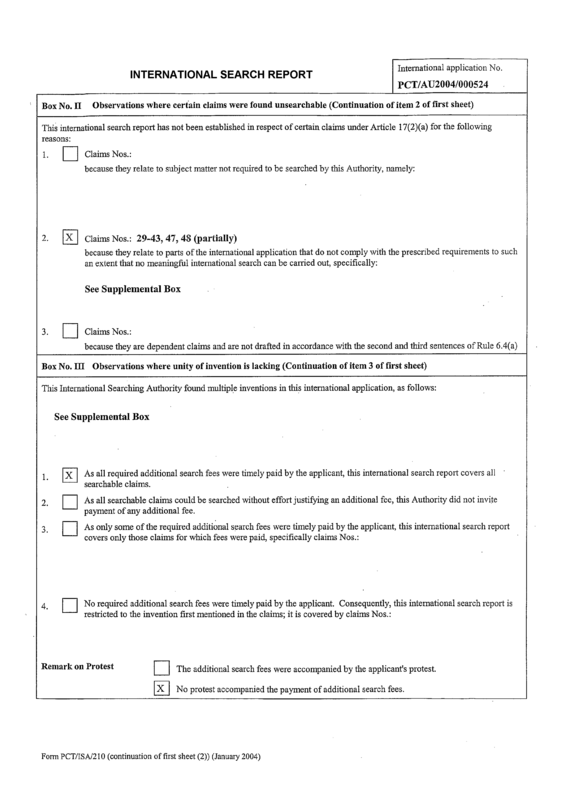 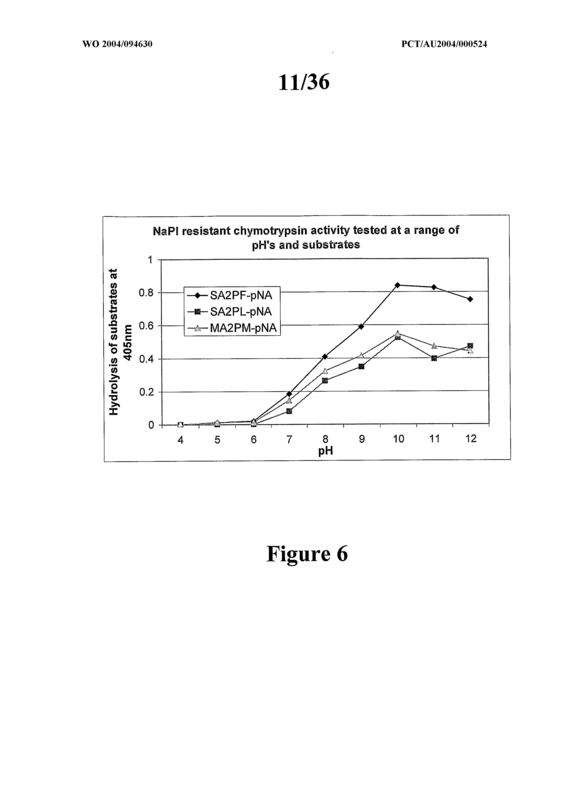 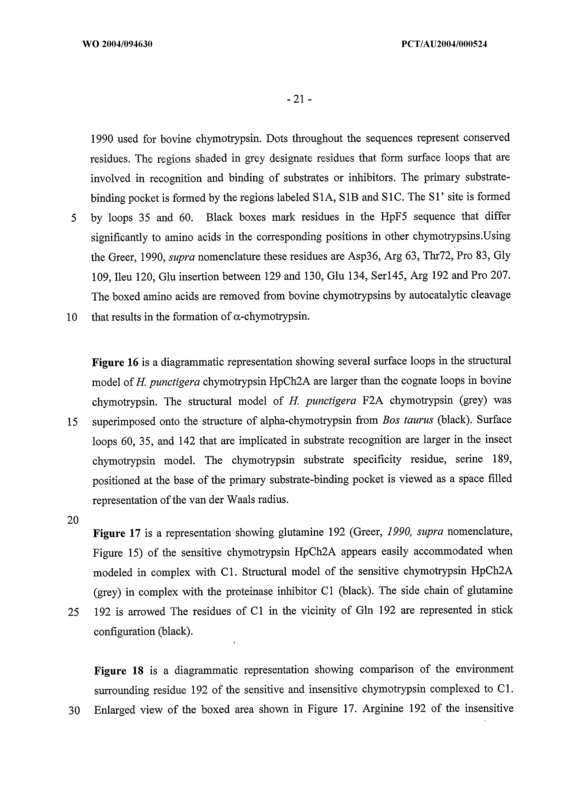 A method for screening for an antagonist of a ΝaPI-insensitive chrymotrypsin from Helicoverpa spp said method comprising contacting same chrymotrypsin with a potential antagonist and screening for chrymotrypsin activity. 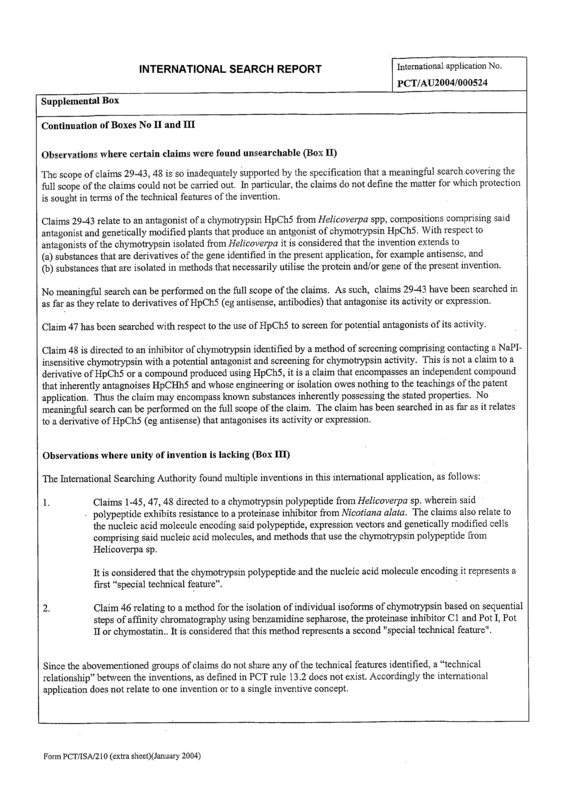 An isolated inhibitor identified by the method of Claim 47.